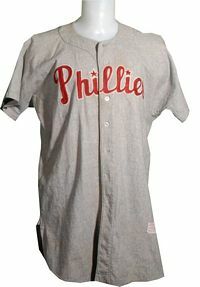 Home logo is navy "P", road grey has "PHILA." 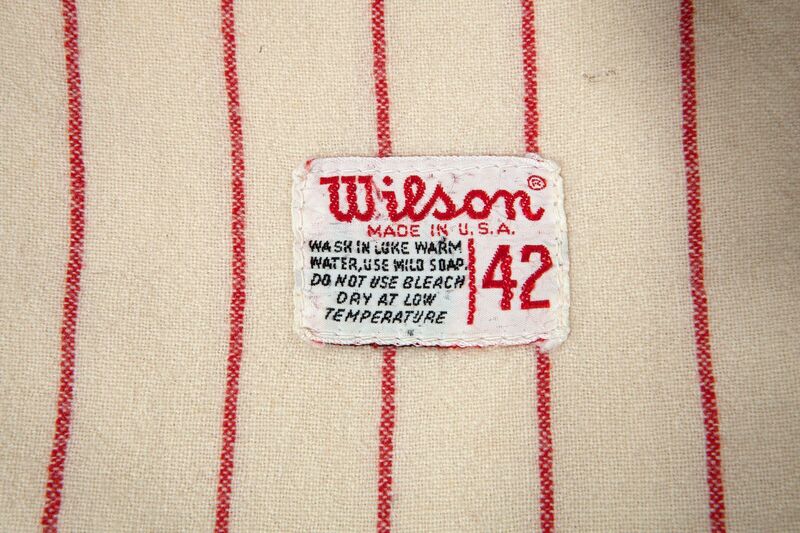 arched in red. 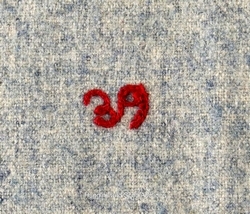 With the period. Caps are pillbox style. 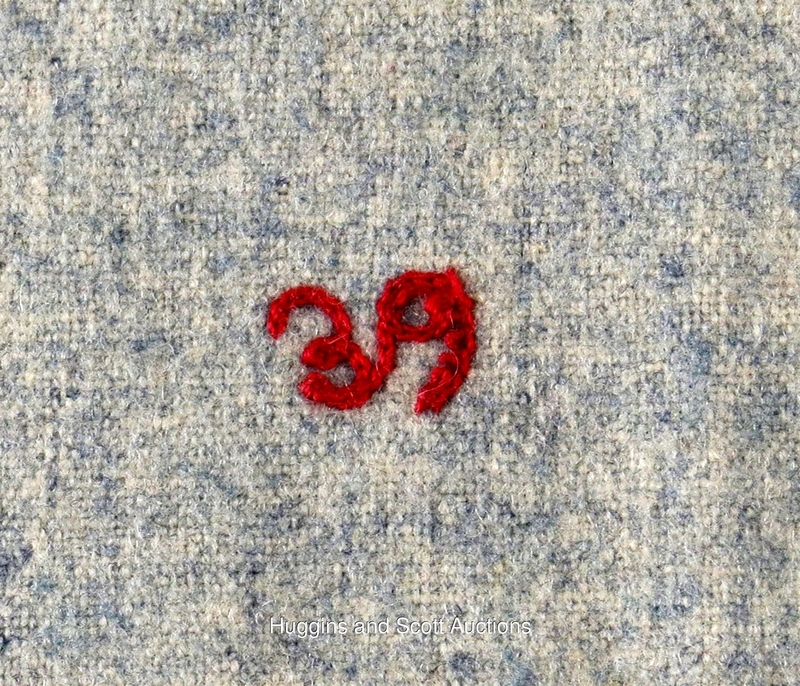 Road logo changed to red "P". 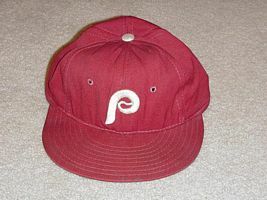 Road cap now red. 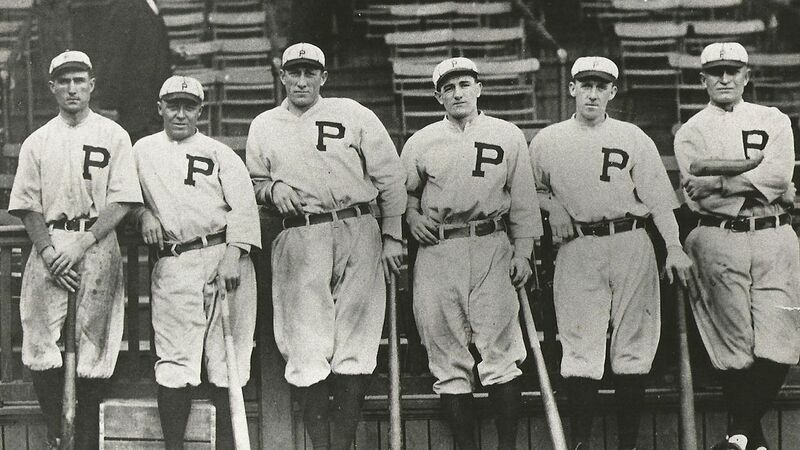 Both home and road logos now "P". 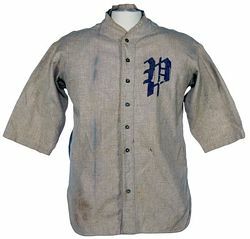 Home white and road grey with navy "P". White home and navy road caps. 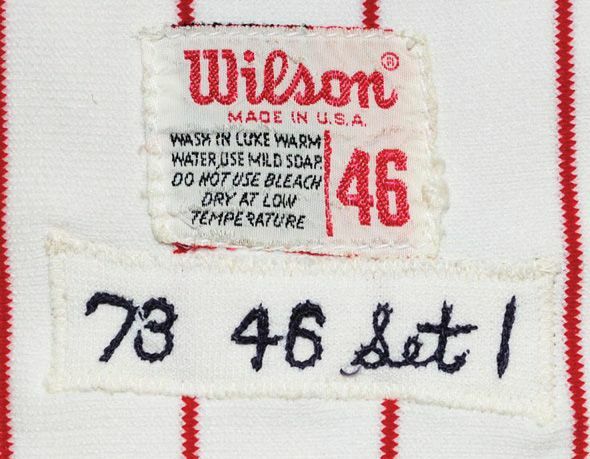 Serif dropped on the "P". 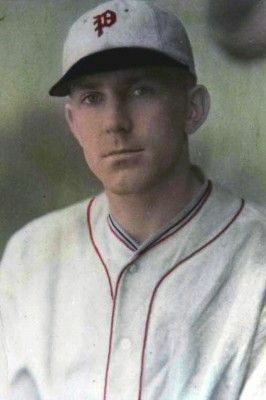 White cap. 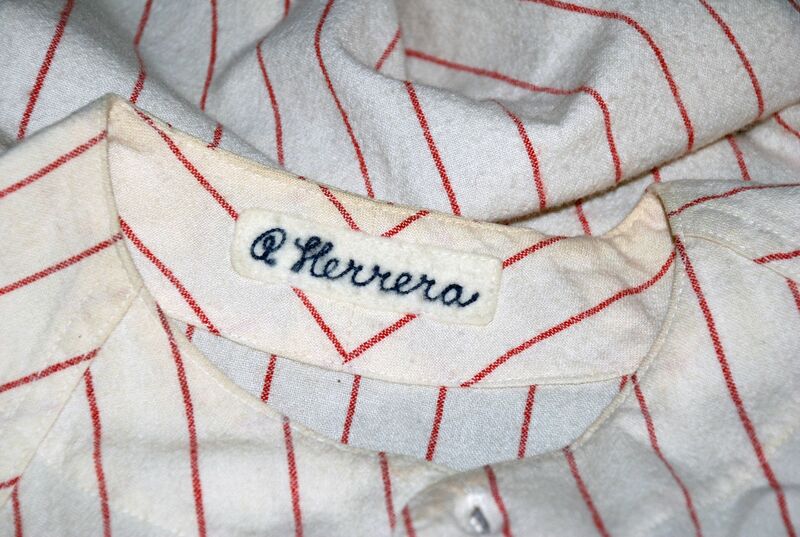 Serif gone again. 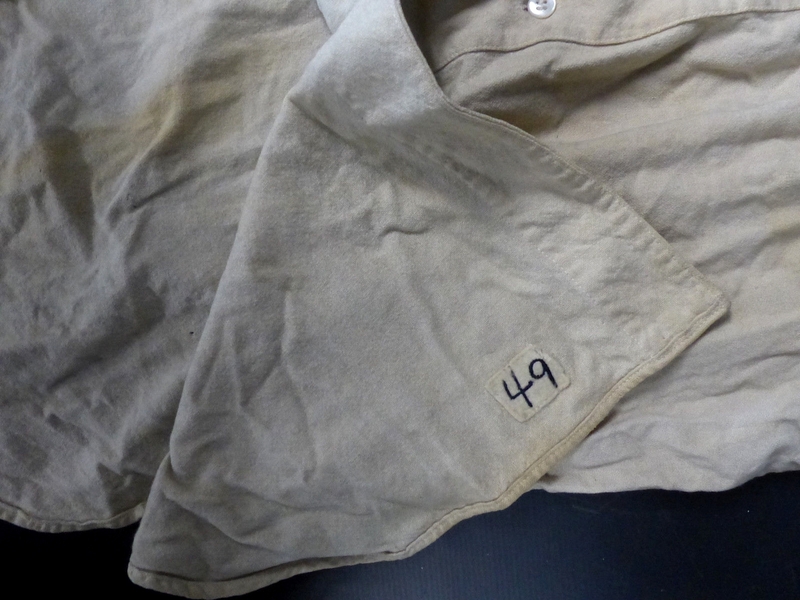 Collars dropped. 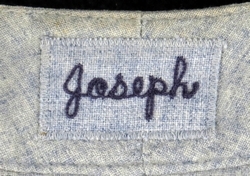 Navy cap. 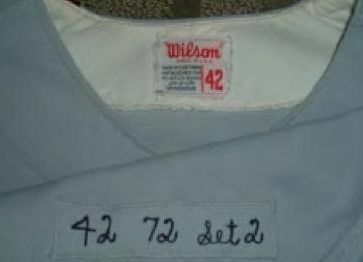 Logo moved to the sleeve on both jerseys. 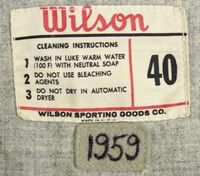 Color changed to green. Fancy "P" on home white, block "P" on road grey. 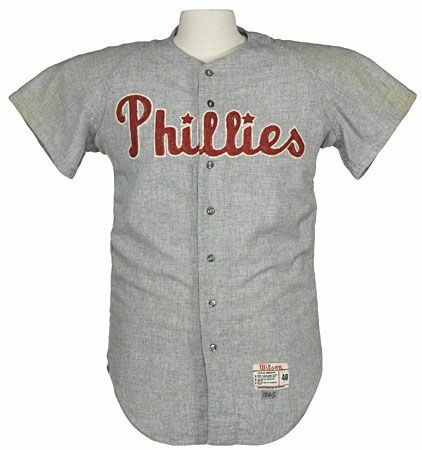 White pinstriped cap at home, road grey. 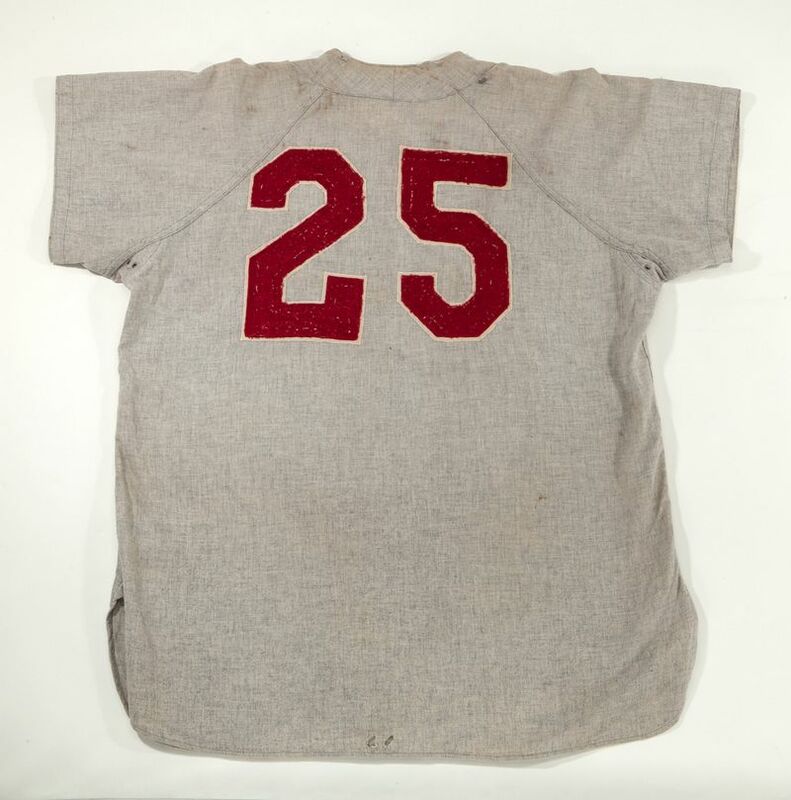 Blank red pinstriped home jersey, road grey with red "P". Caps get logos. 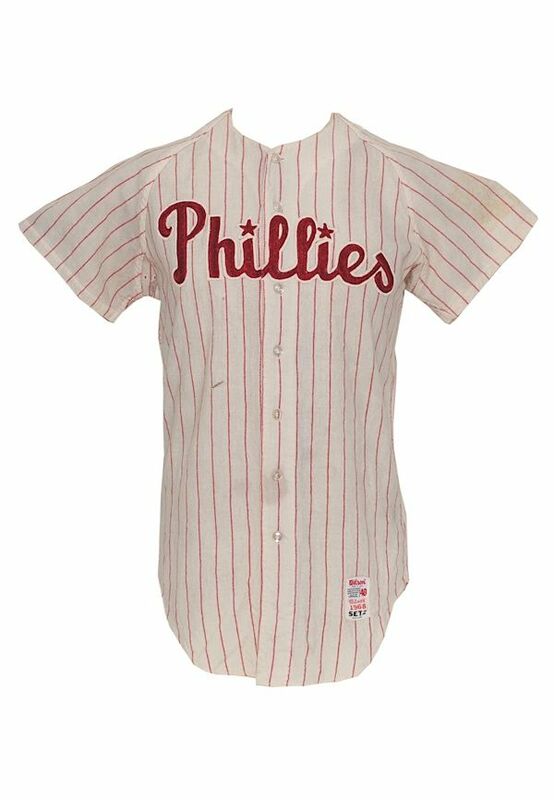 Pinstripes dropped, logo added to home jersey. 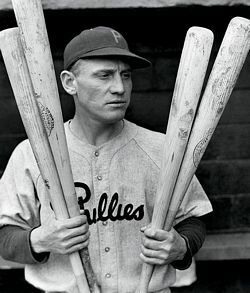 Caps are white and grey. 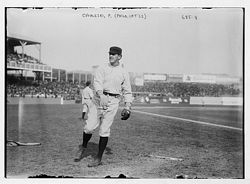 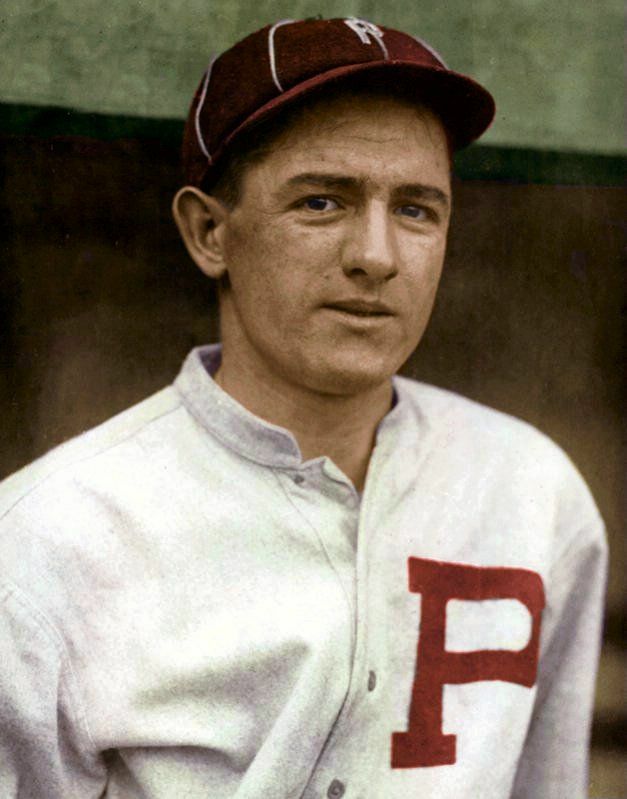 Cap turns red in 1913. 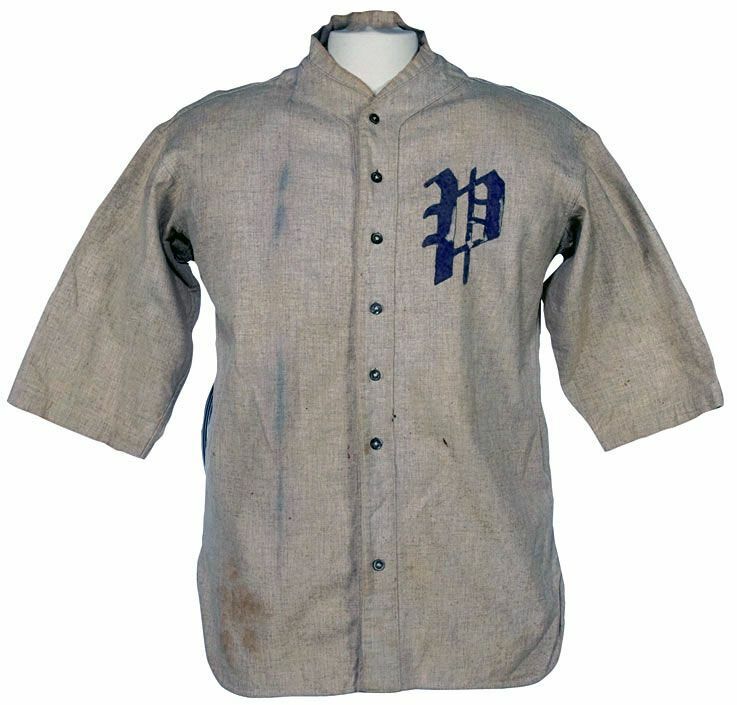 Road jersey now has a navy "P" and navy cap. 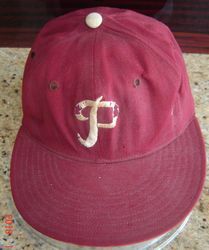 Home cap changed to white. 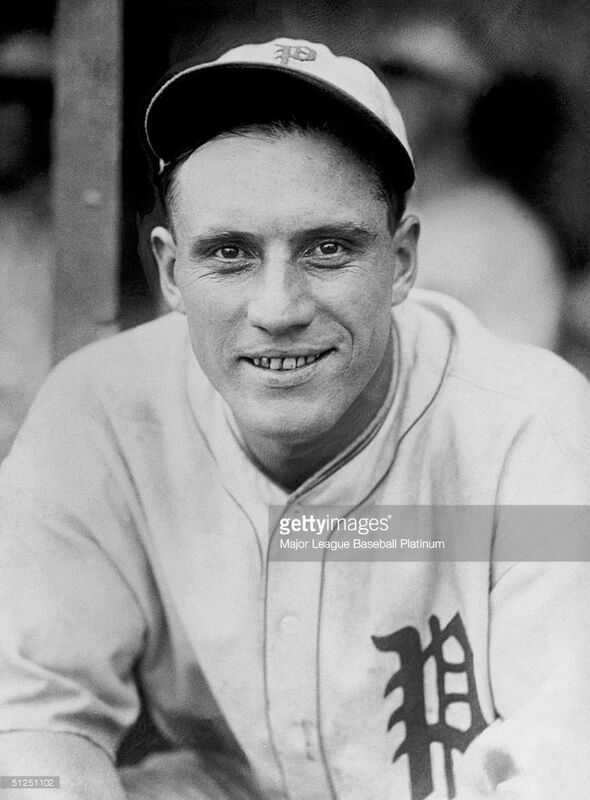 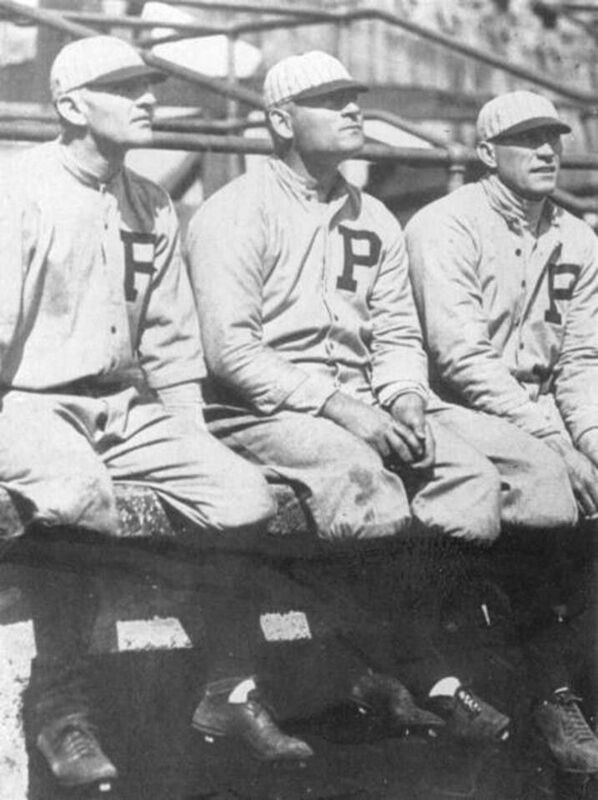 Road cap changed to grey in 1920. 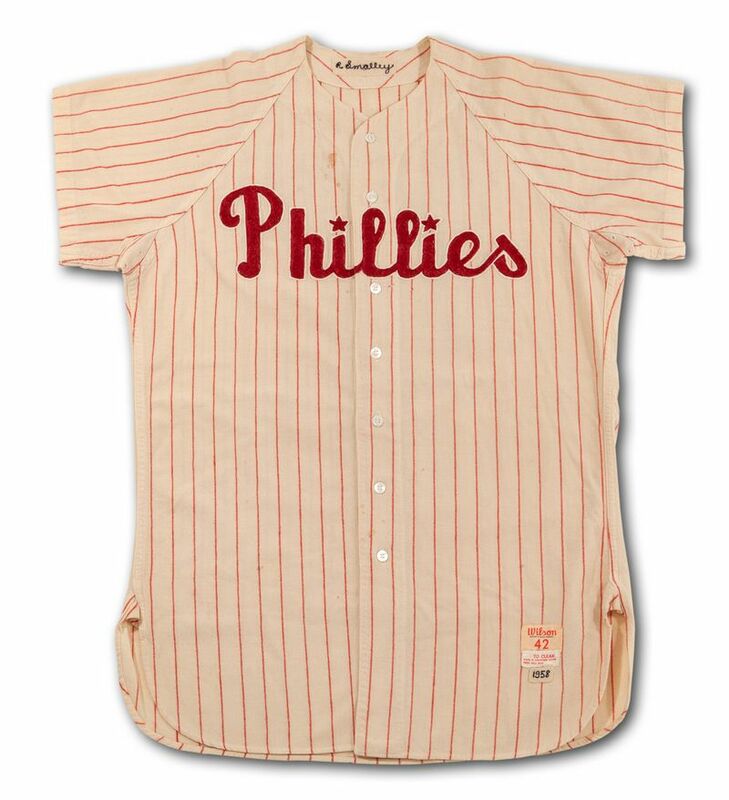 Pinstripes added to jersseys. 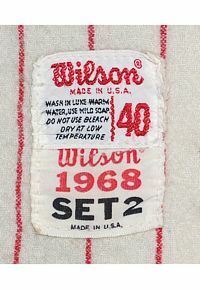 Logo is a red "P" in a blue circle. 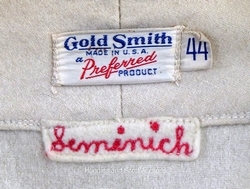 Navy cap. 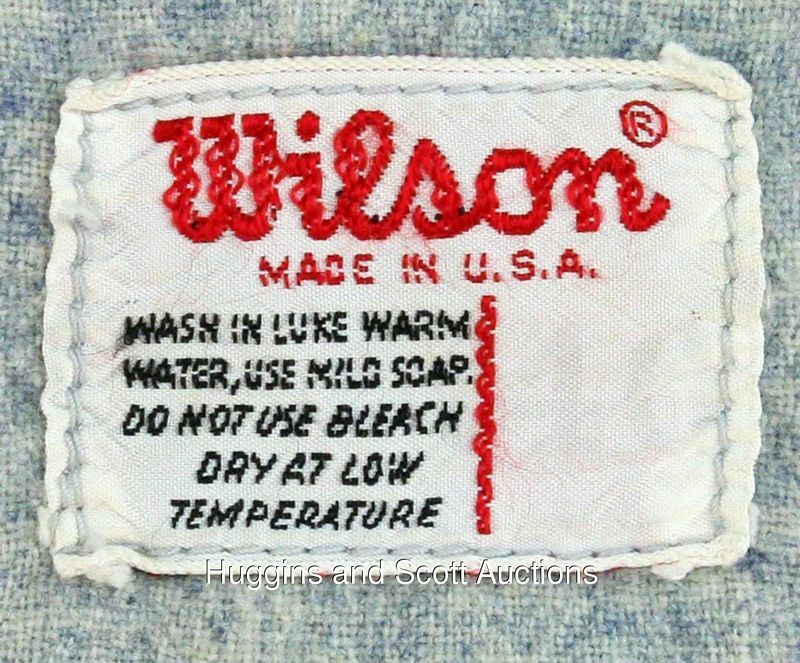 The red "P" is larger, the blue circle is gone. 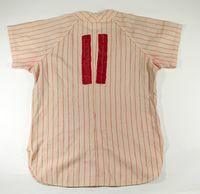 White home, grey road caps with red pinstripes. 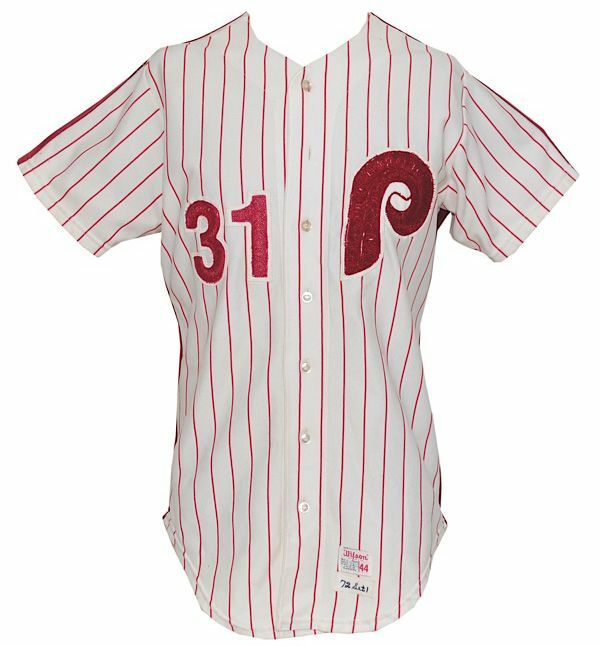 Red "P" loses the serif and the pinstripes are gone. "P" is changed to red Old English on the home jersey, navy on the road (NOT red per the HOF database). 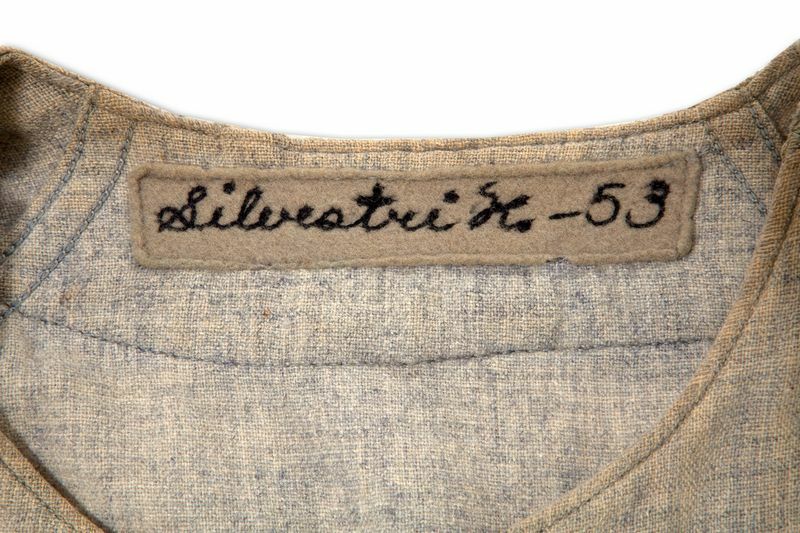 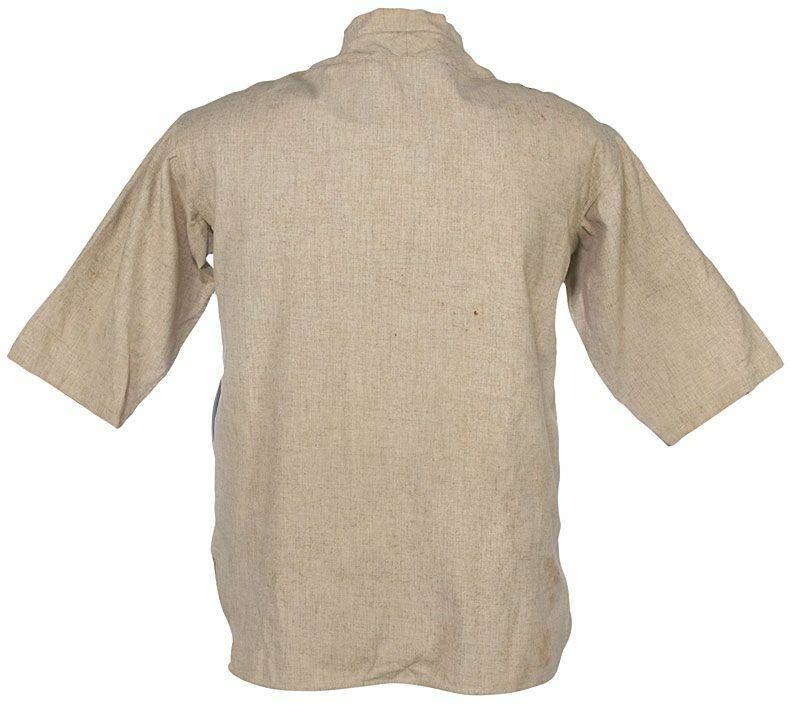 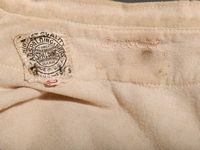 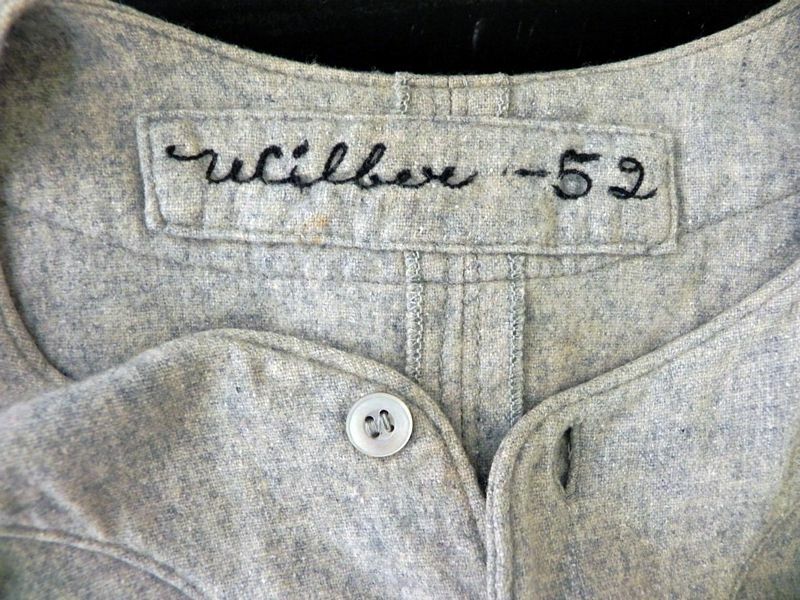 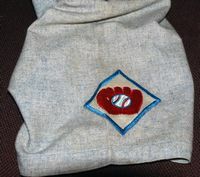 NL Golden Jubilee sleeve patch worn in 1925. Road cap goes from grey to navy in 1926. 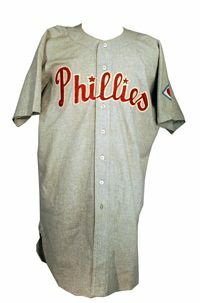 On the road jersey, the logo changes to red and is put on both sleeves inside a diamond. 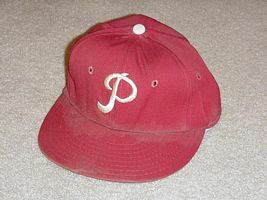 Road cap goes back to grey. 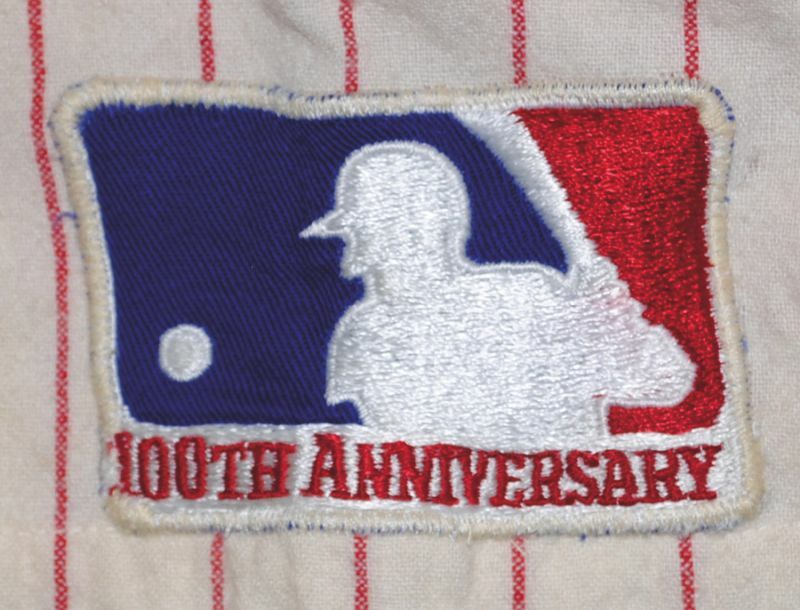 Home logo is a bit smaller. 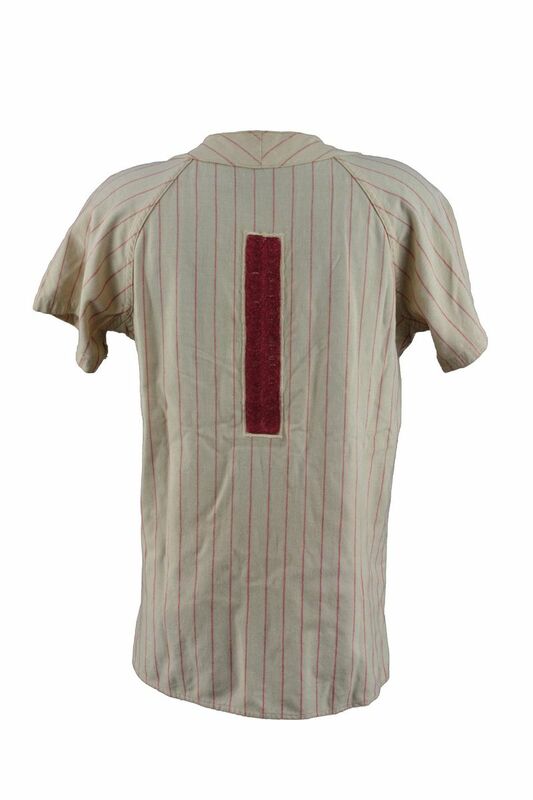 Red piping and cuff trim added to both jerseys. Road jersey now has "Phillies" in red script. 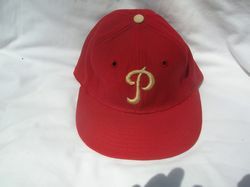 Home cap changed to red. 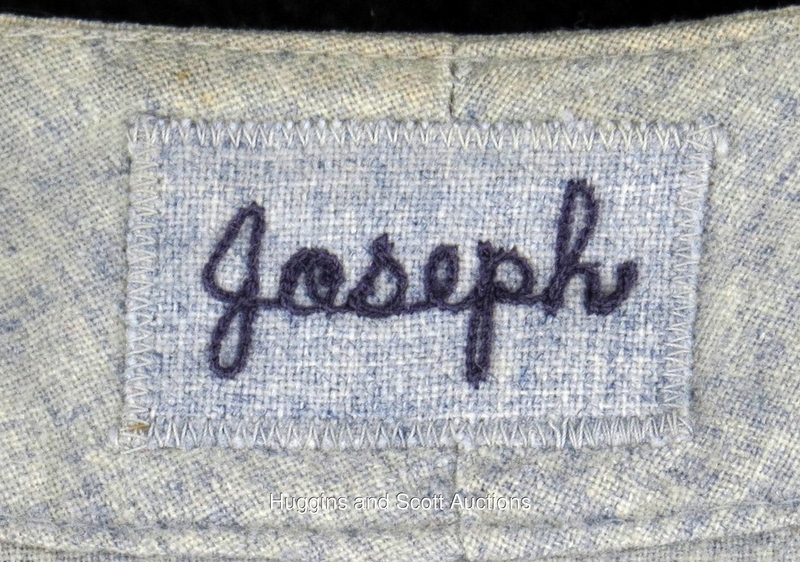 Navy accent color added. 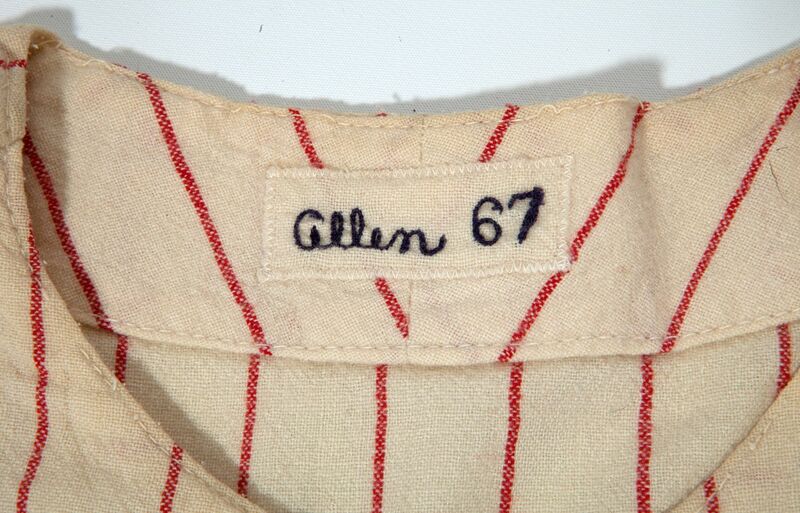 Home has "Phillies" in script; the "P" and underline tail is navy with red trim, while the other letters are red. 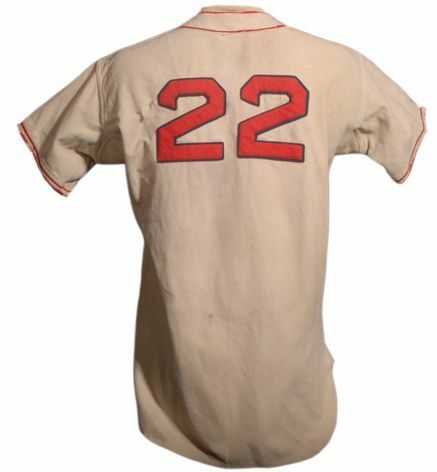 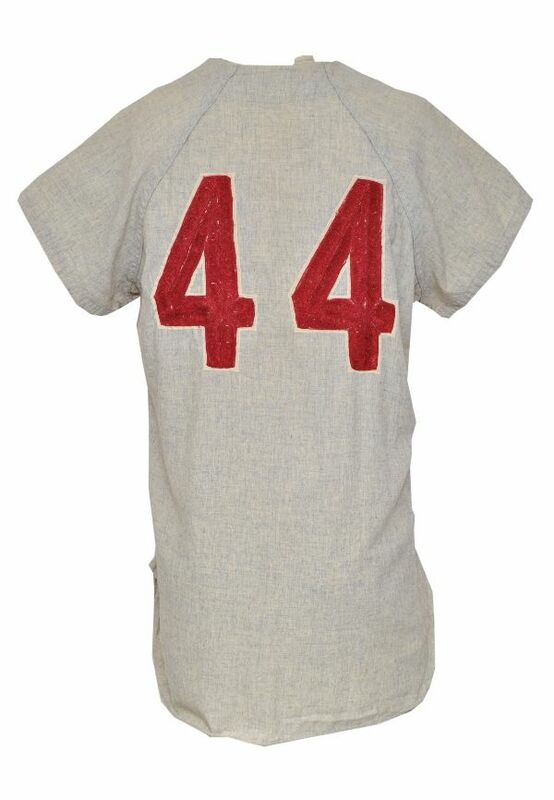 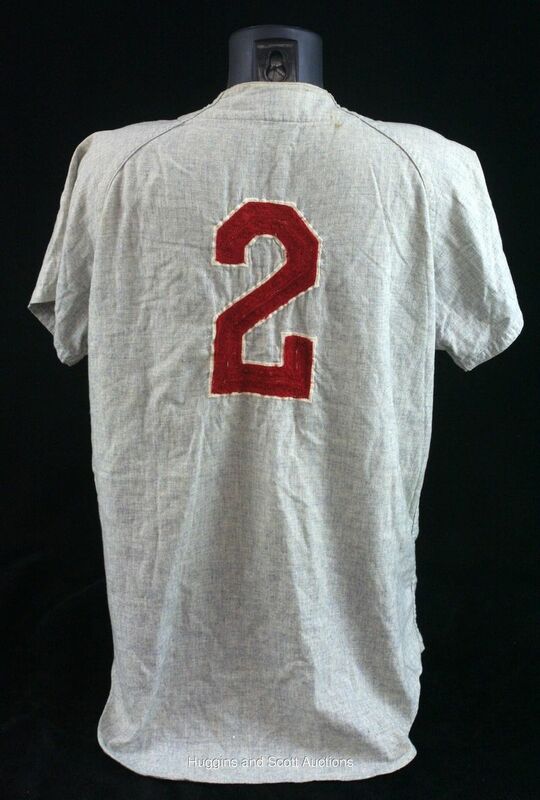 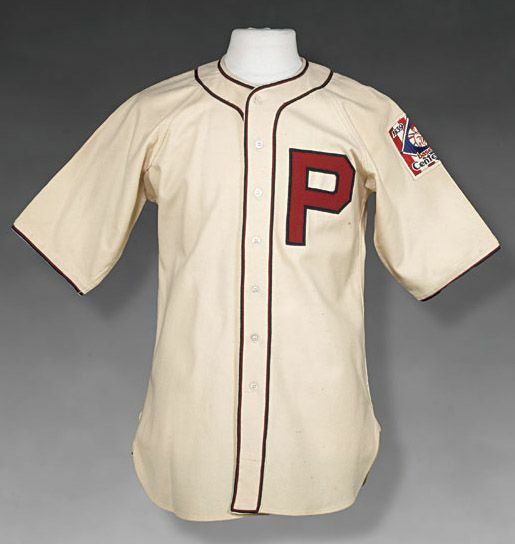 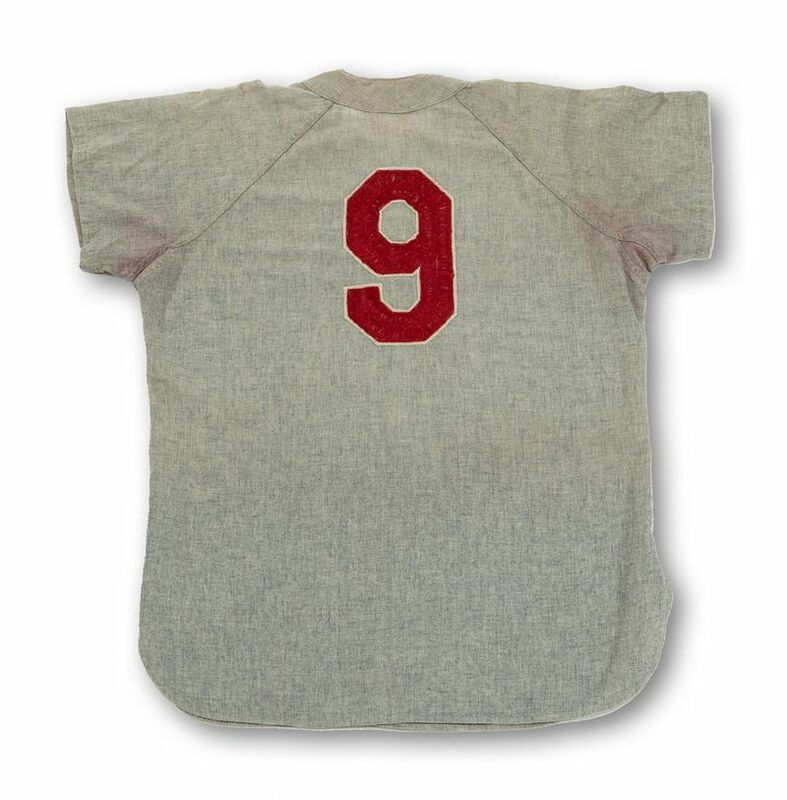 The road jersey "P" and tail are white with red trim, the other letters red. 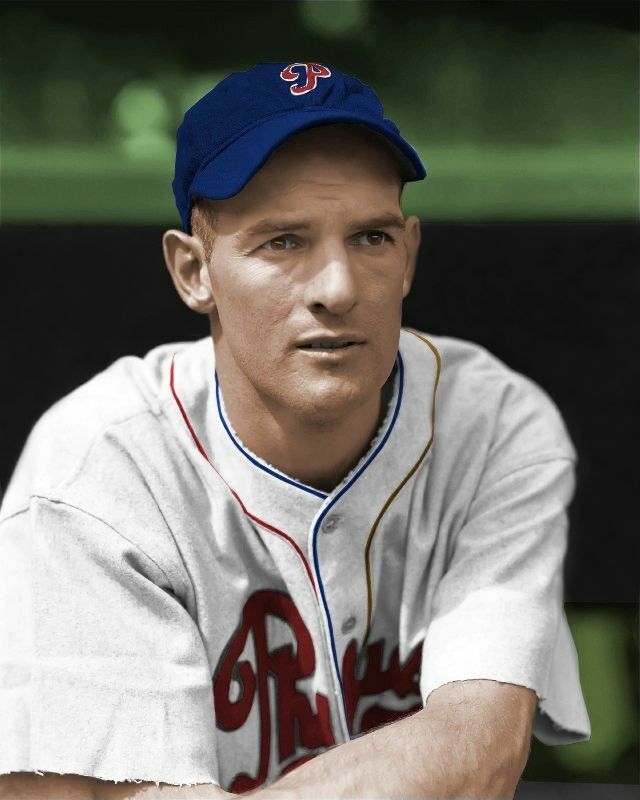 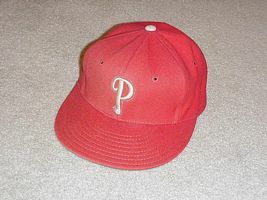 Blue cap with red cursive "P" and white trim. 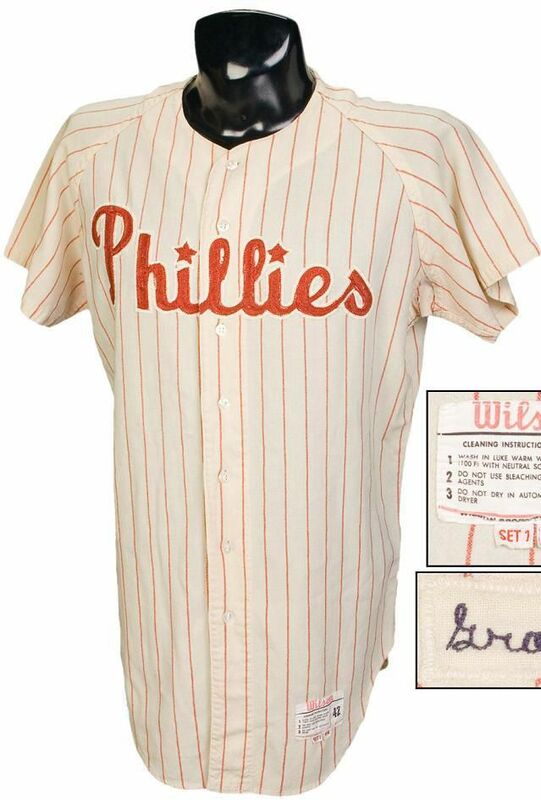 "Phillies" script now red with navy trim on both jerseys. 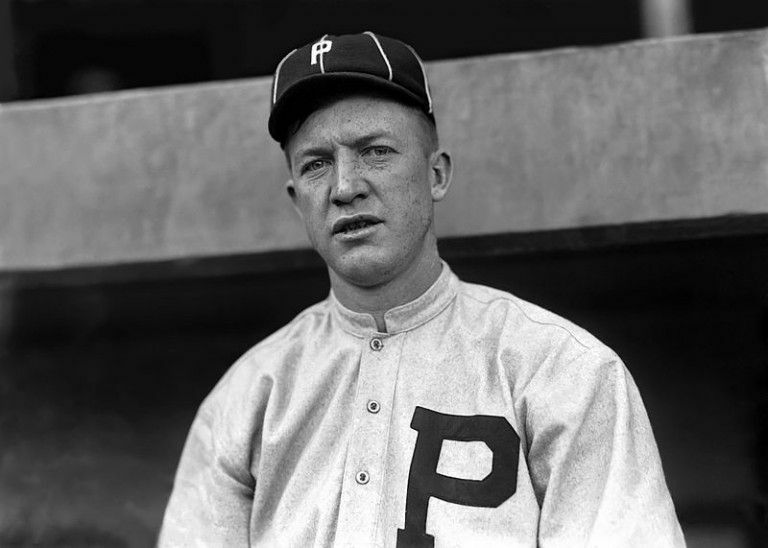 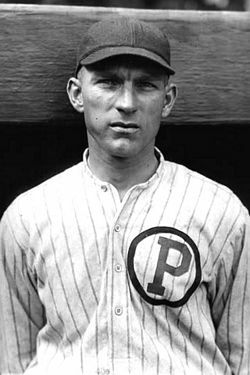 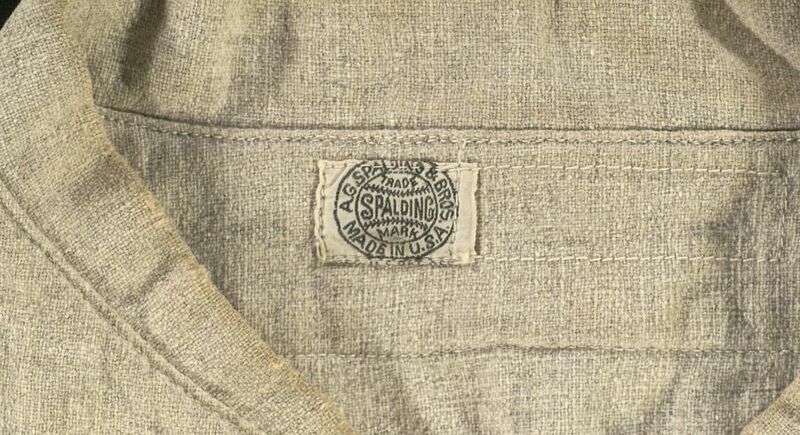 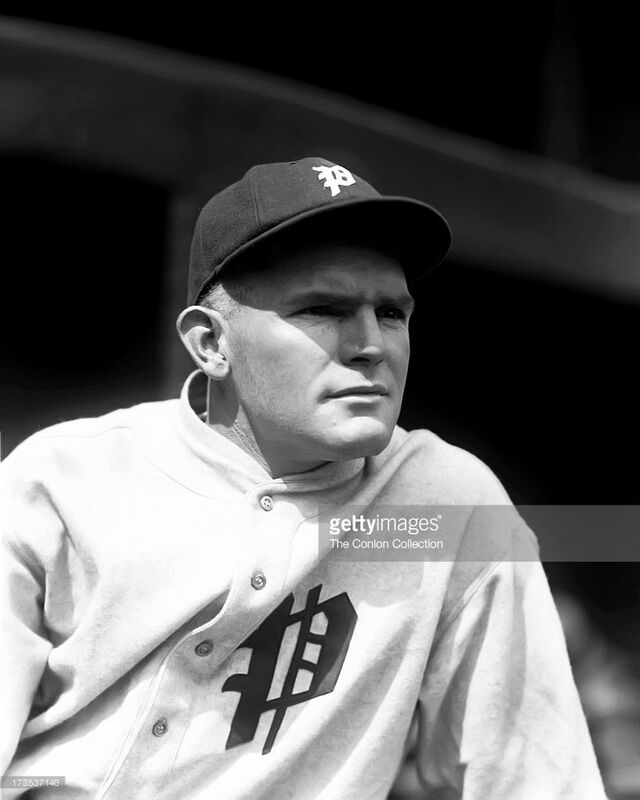 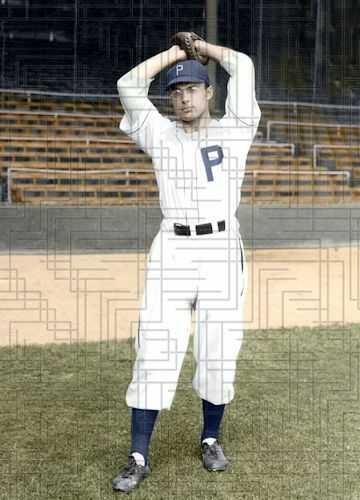 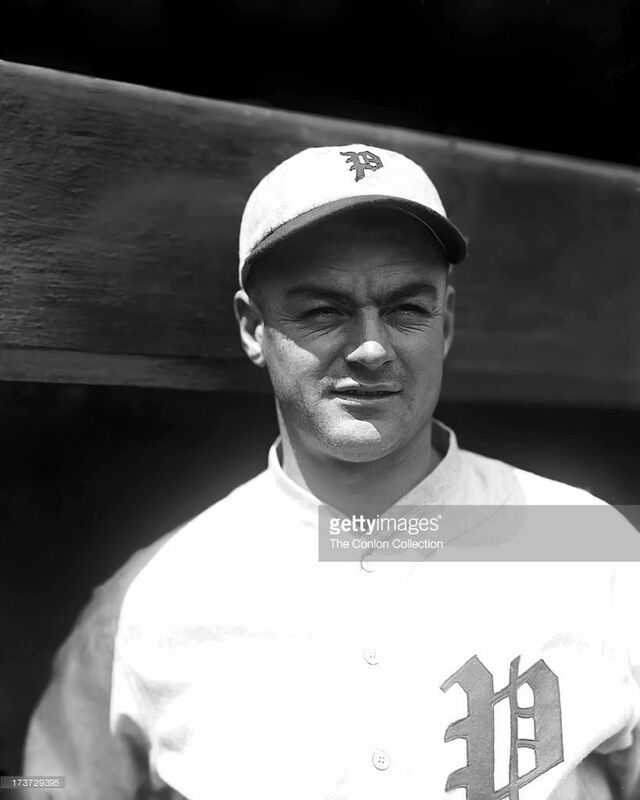 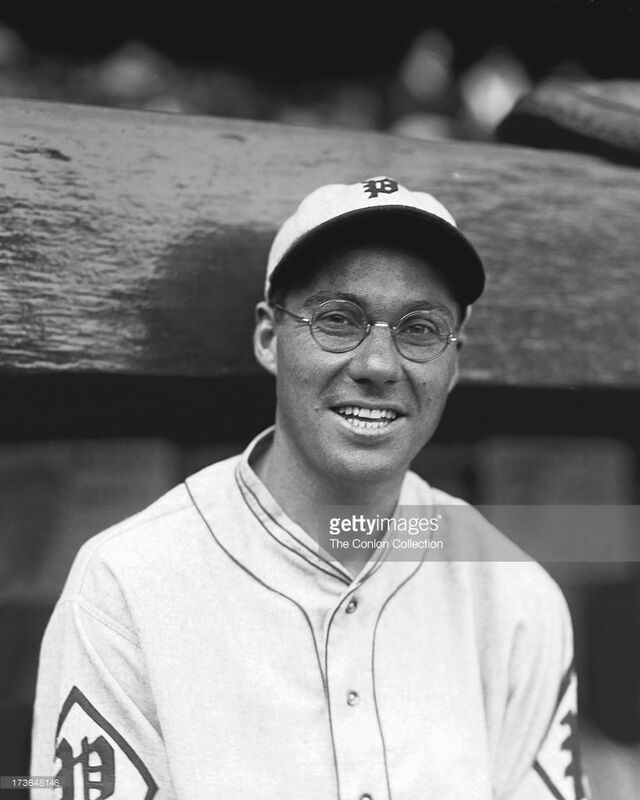 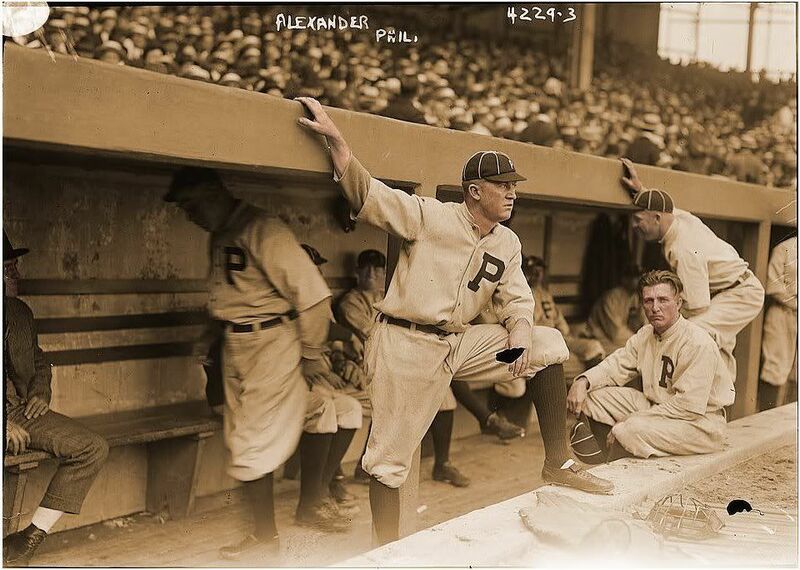 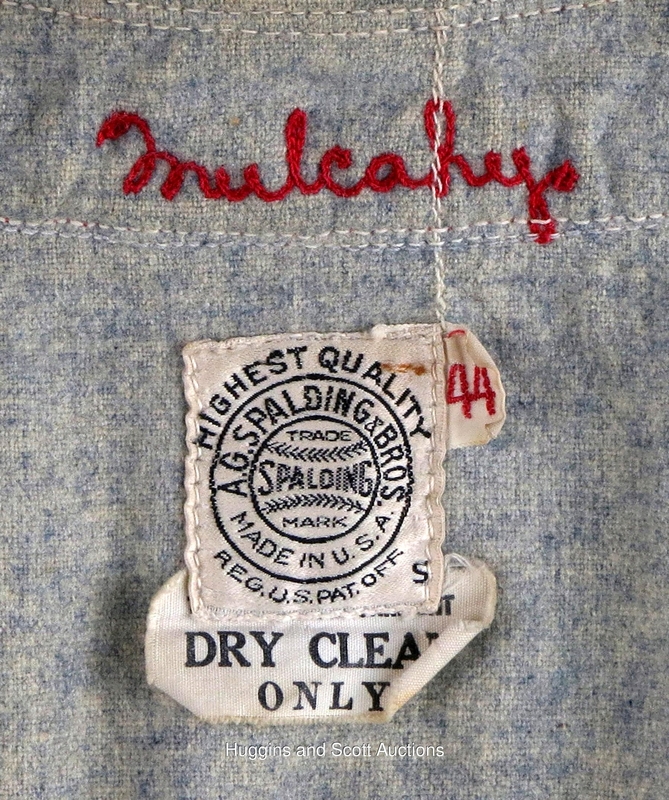 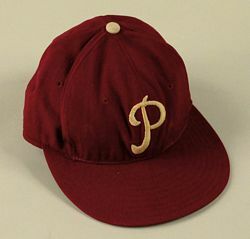 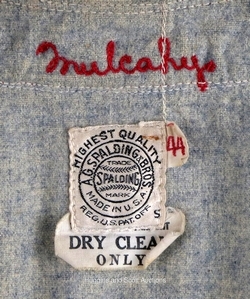 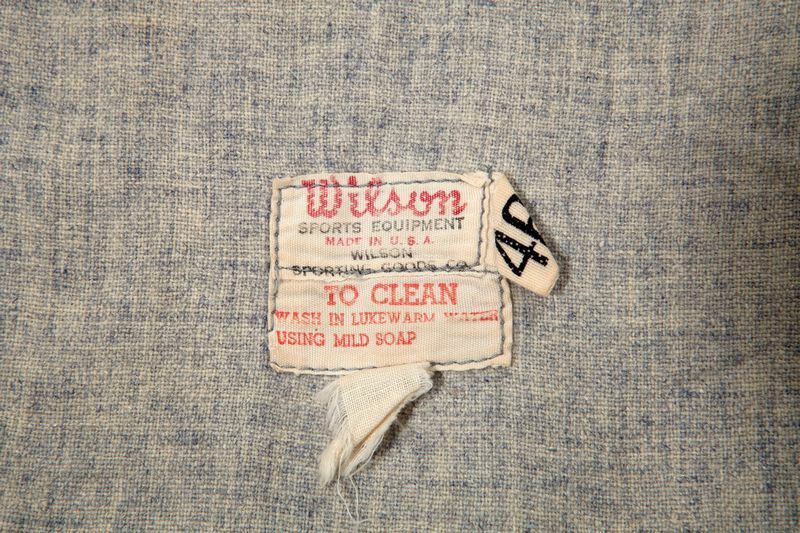 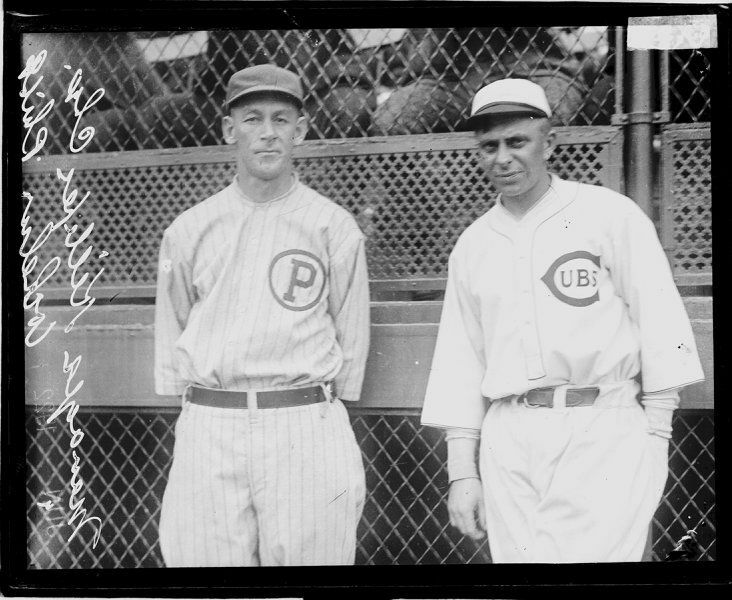 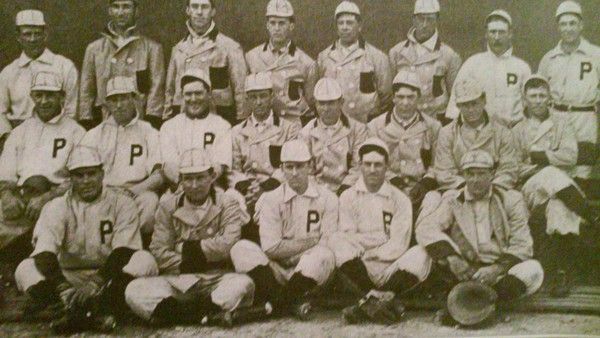 White outline around the "P" removed on cap in 1936. 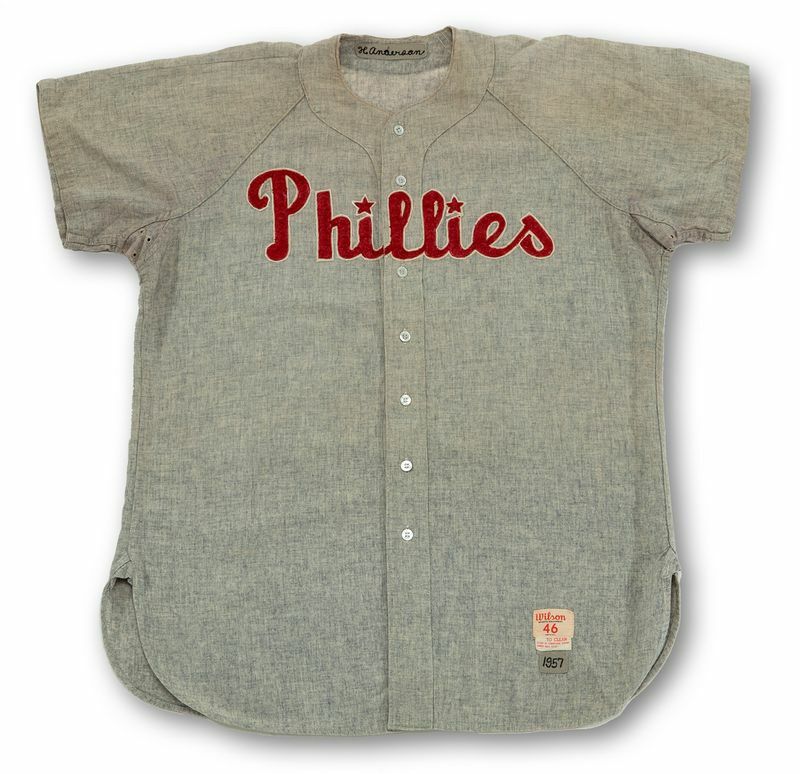 Road jersey "Phillies" script flipped to navy with red trim. To celebrate the tercentennial of the Swedish arrival in Philadelphia and their Quaker roots (the team was originally called "Quakers" from its inception in 1883 through 1889), the Phillies wore a Swedish blue and yellow version of its uniform for the season along with the William Penn logo patch. 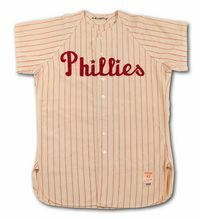 Home jersey has a "P", road a cursive "Phillies", and no dots on the "i's". 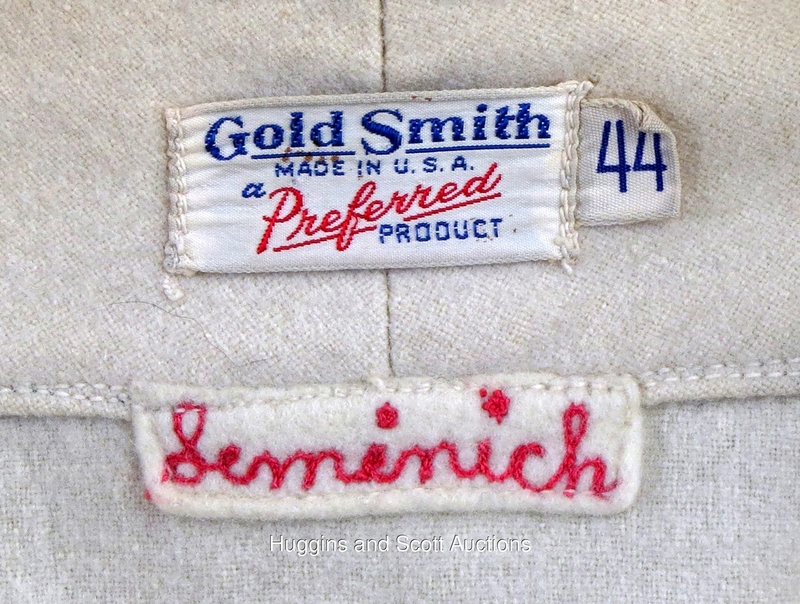 Blue cap, gold "P" with white trim. 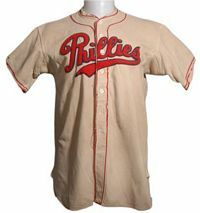 Same style but red replaces gold. 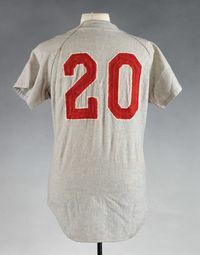 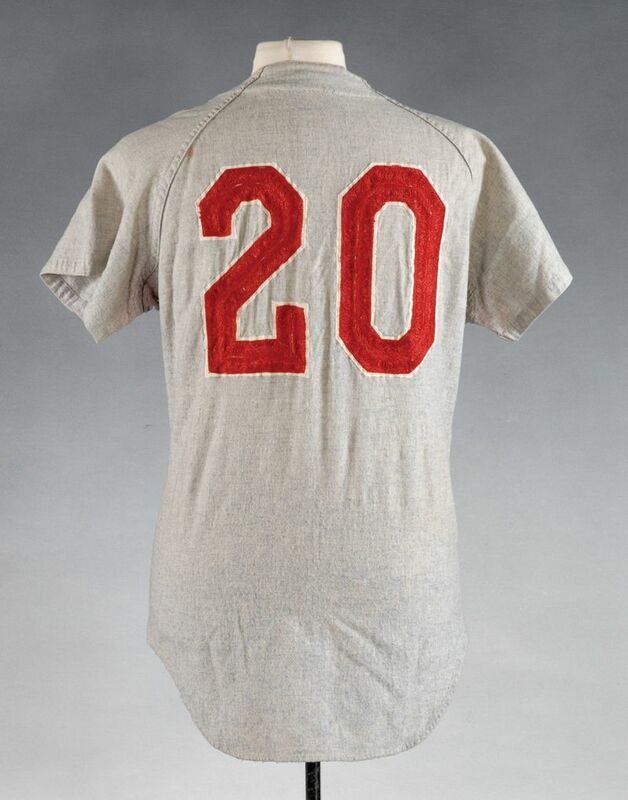 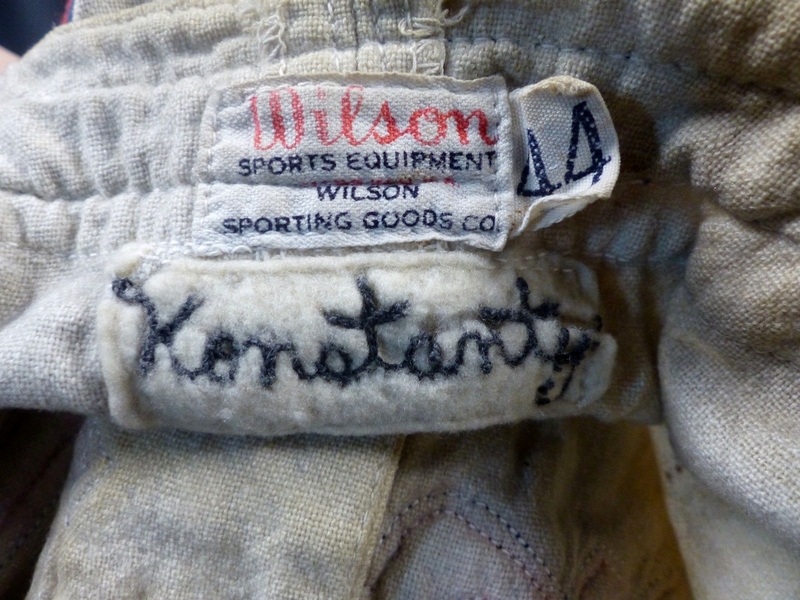 Baseball Centennial patch worn in 1939. 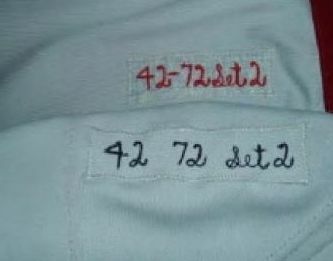 Red is dropped, navy is darkened. 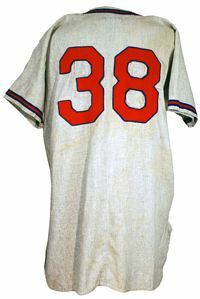 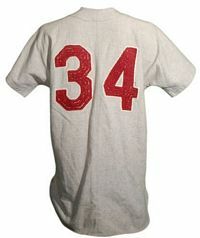 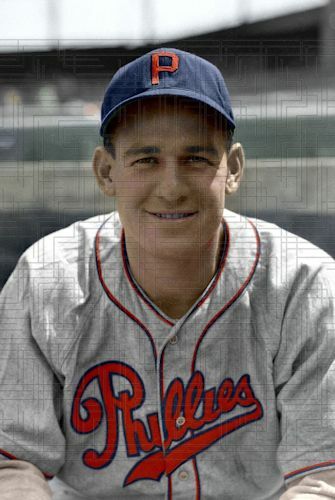 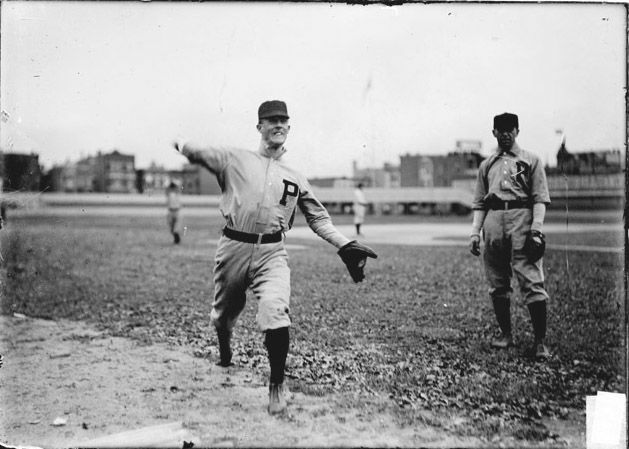 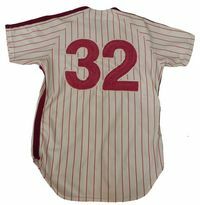 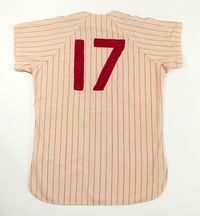 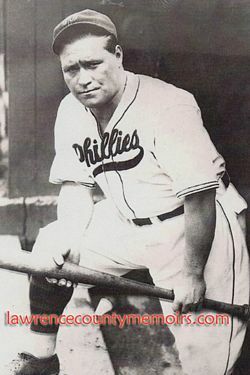 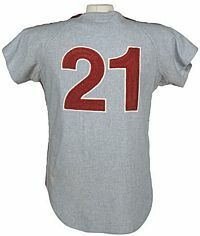 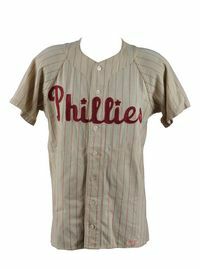 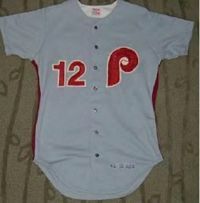 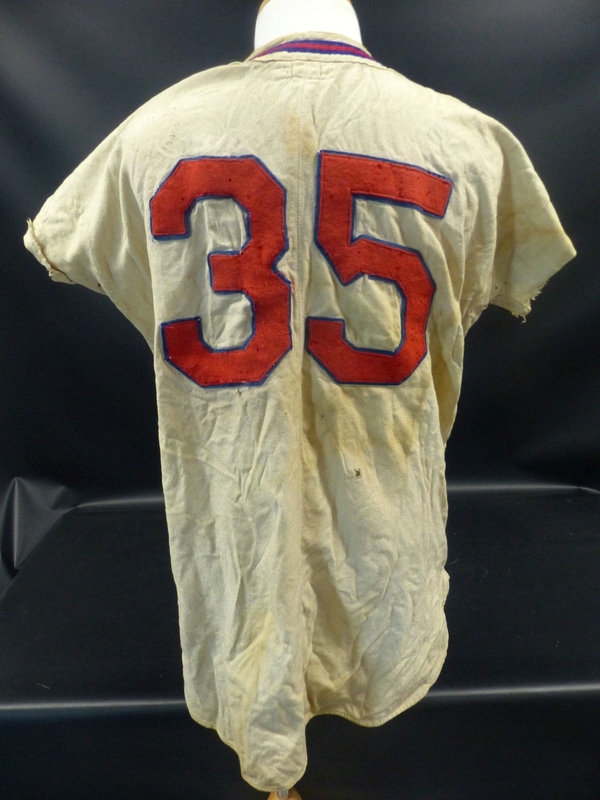 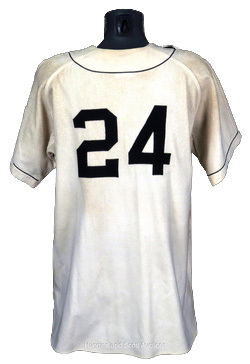 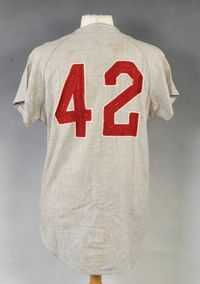 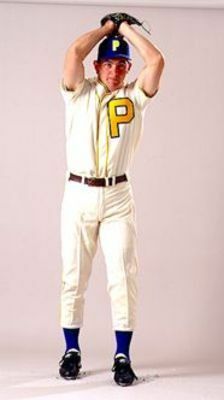 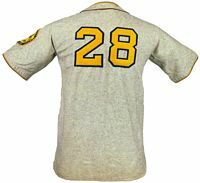 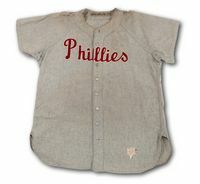 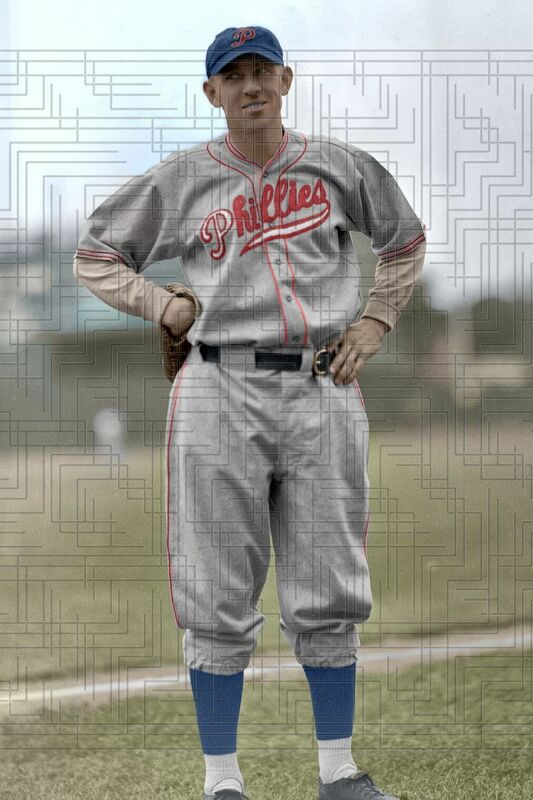 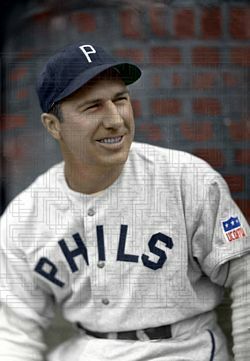 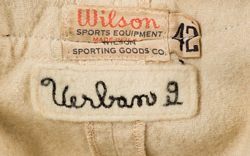 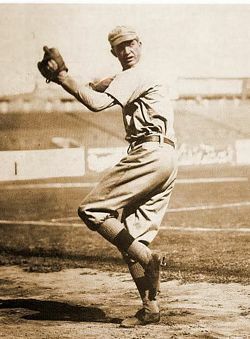 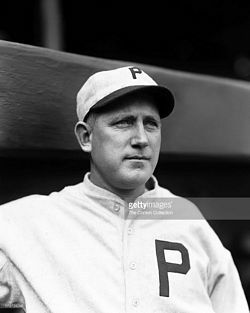 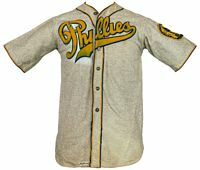 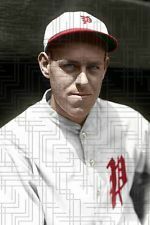 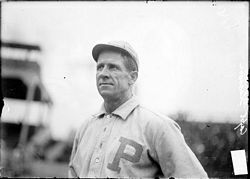 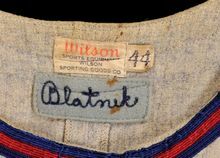 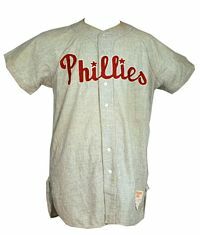 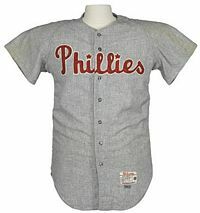 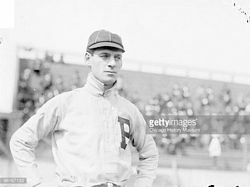 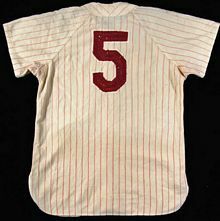 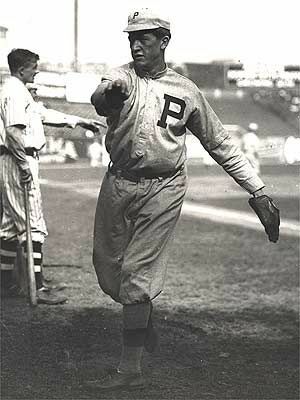 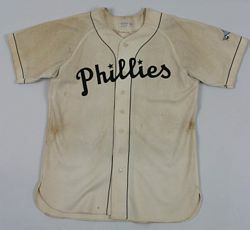 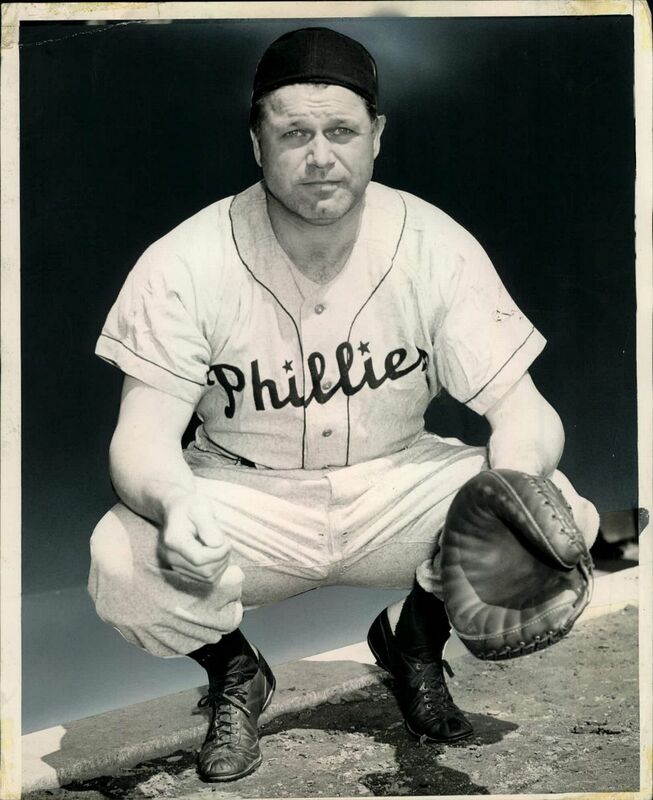 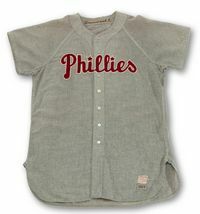 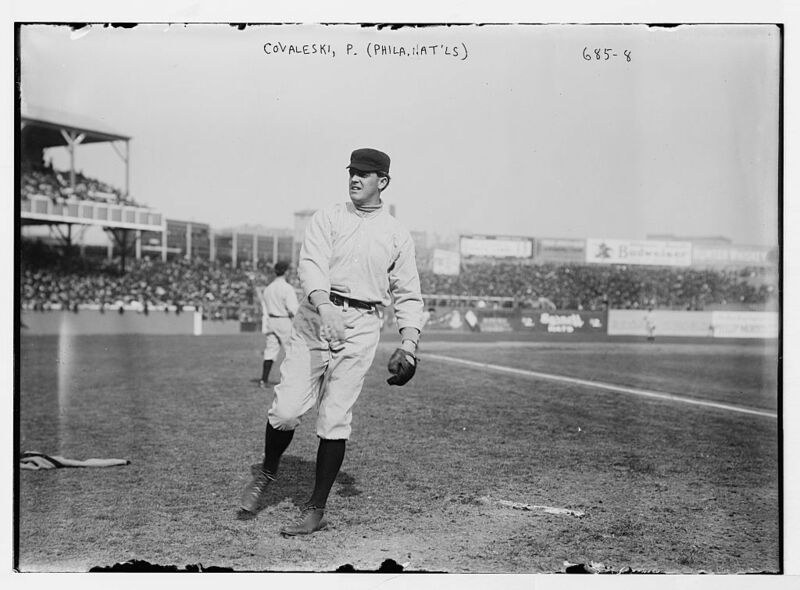 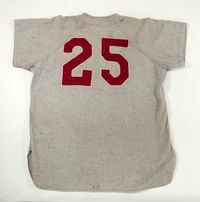 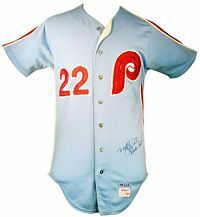 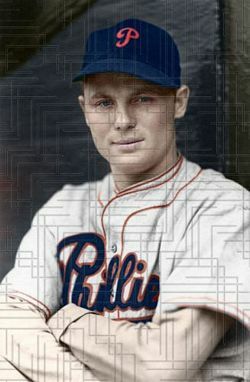 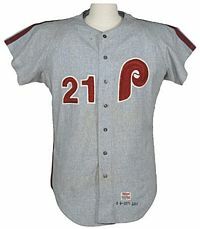 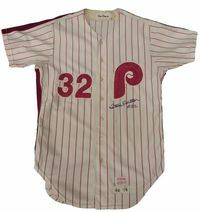 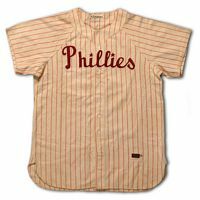 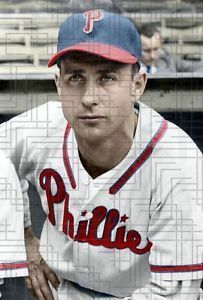 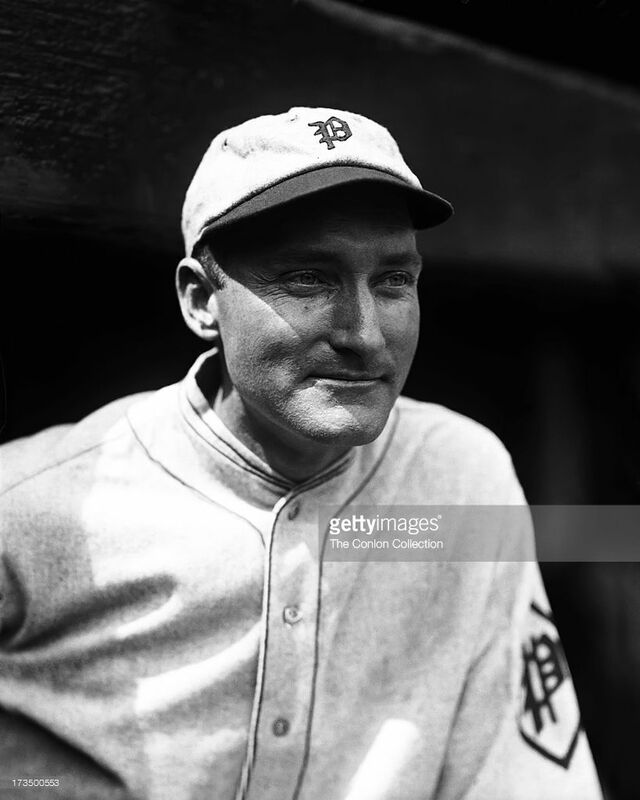 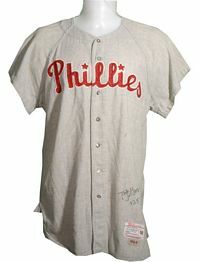 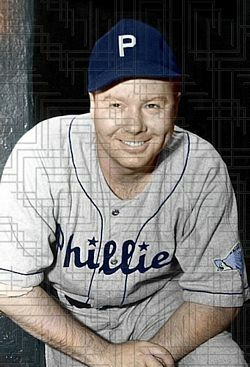 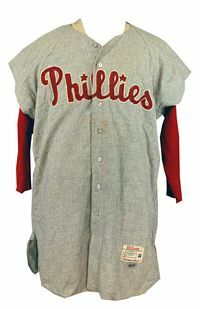 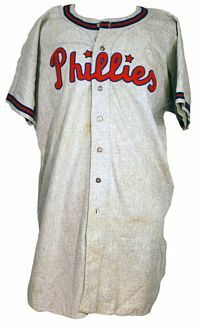 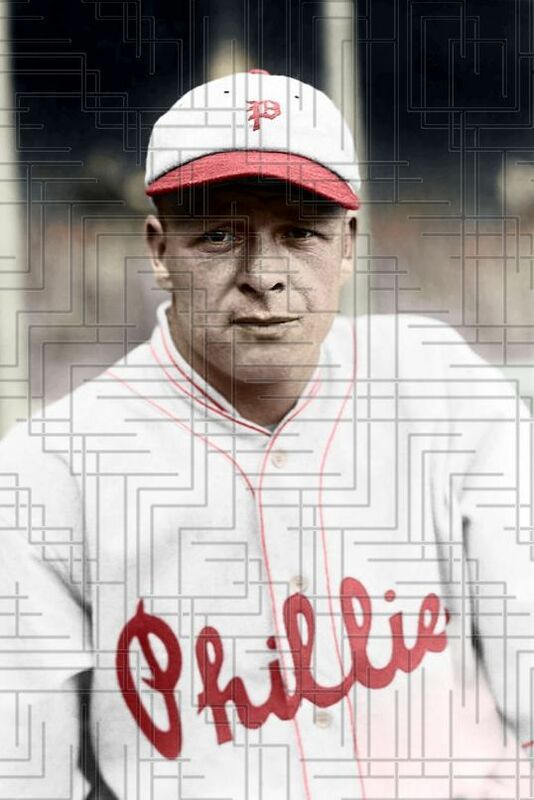 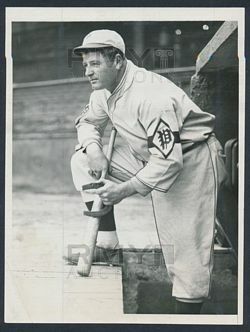 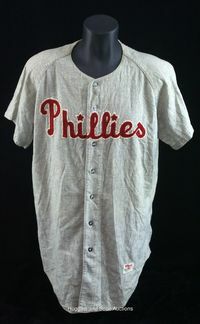 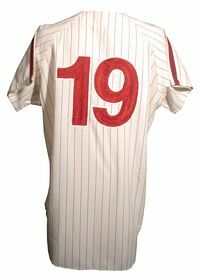 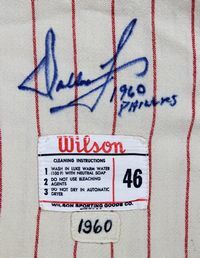 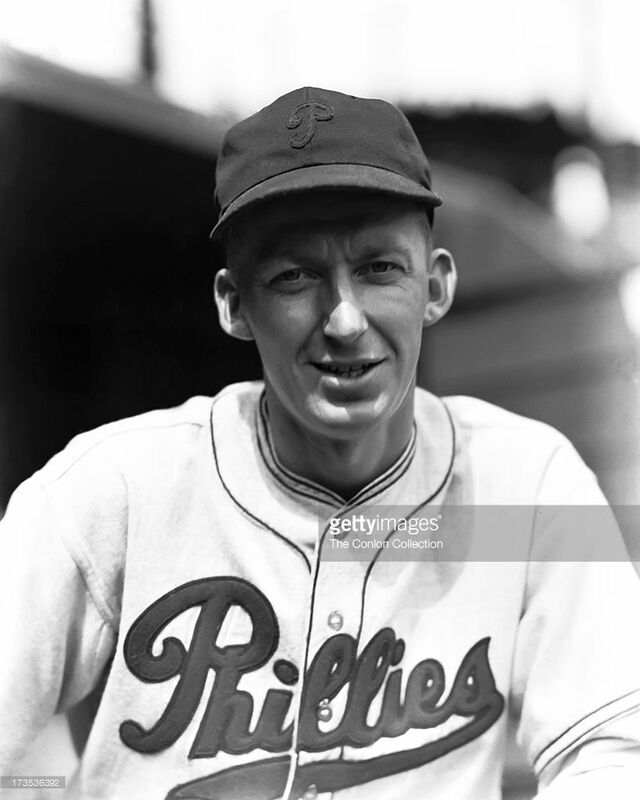 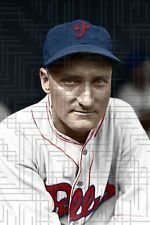 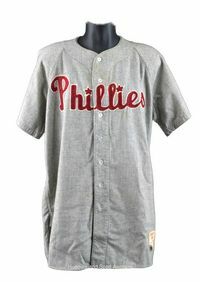 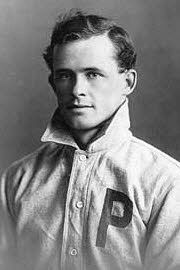 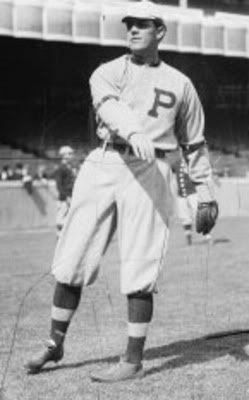 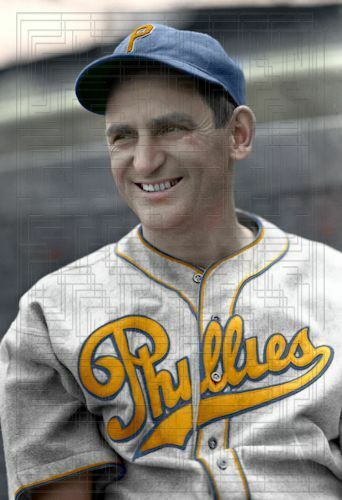 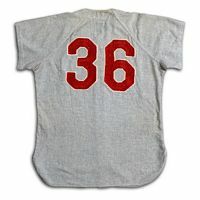 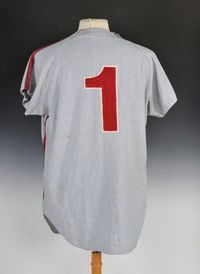 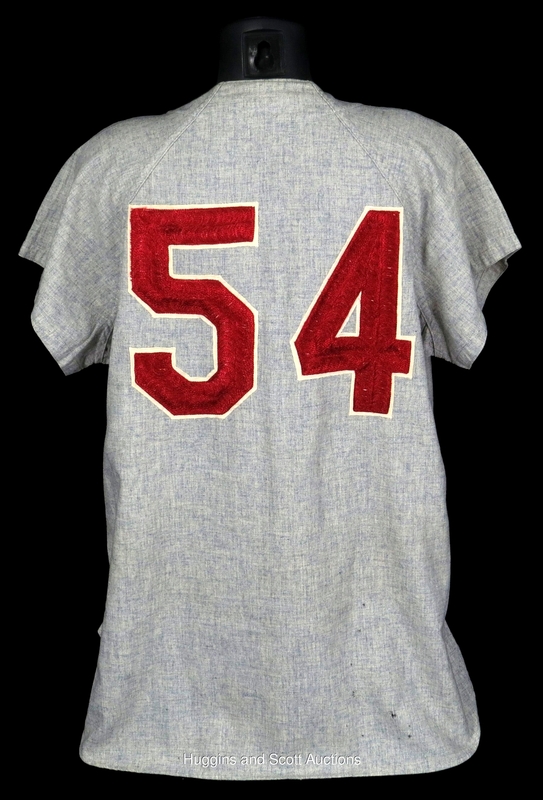 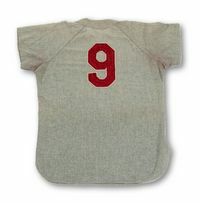 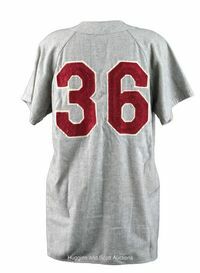 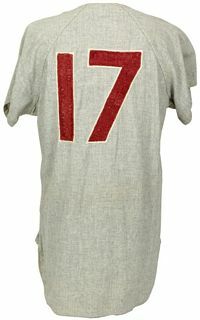 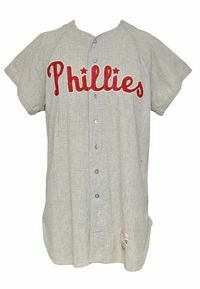 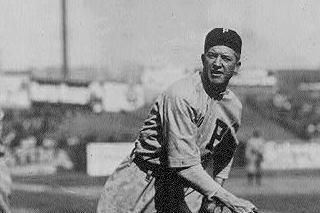 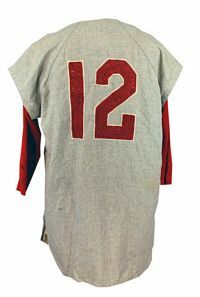 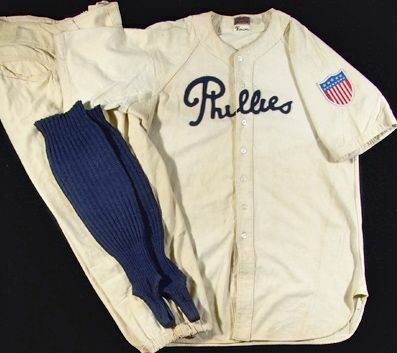 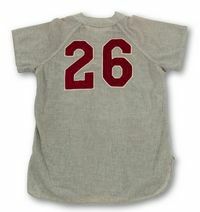 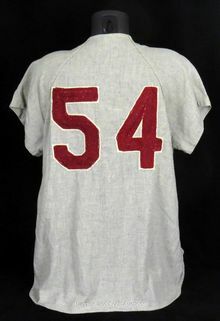 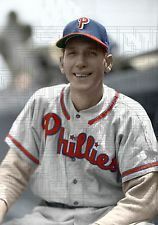 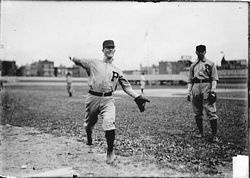 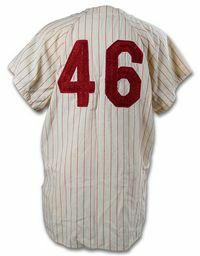 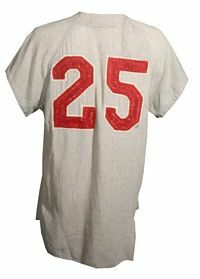 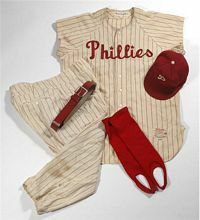 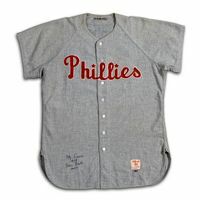 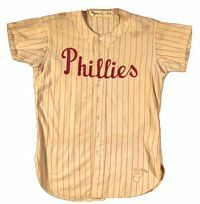 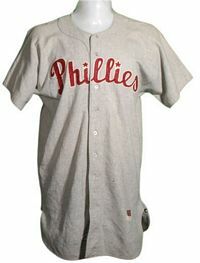 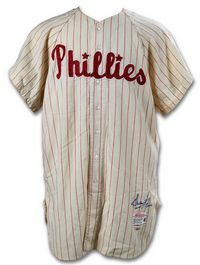 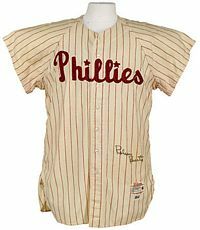 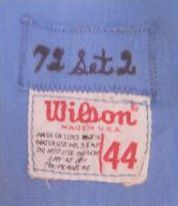 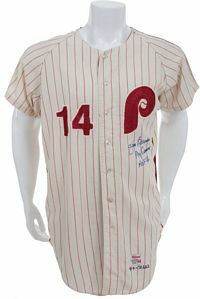 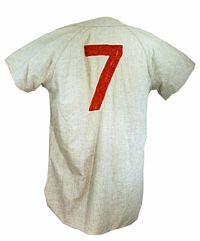 For one season team President Gerald P. Nugent changes the nickname to "Phils", which appears in block on road jerseys. 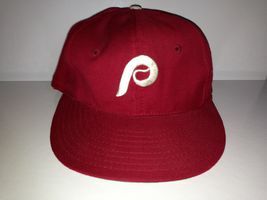 Cap logo is a block "P". 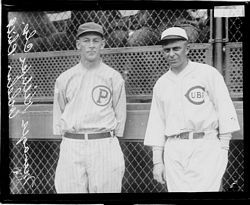 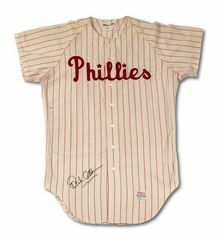 New owner William D. Cox changes the nickname back to "Phillies", which is written in simple navy cursive, and still no dots on the "i's". 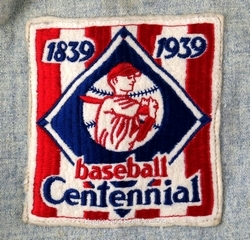 Stars & Stripes patch worn 1943. 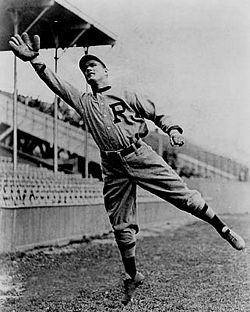 New owner Cox was banned from baseball for betting on his own team. 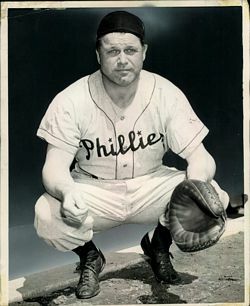 Bob Carpenter took over and, trying to improve the image and generate fan interest, held a contest to choose a new nickname. 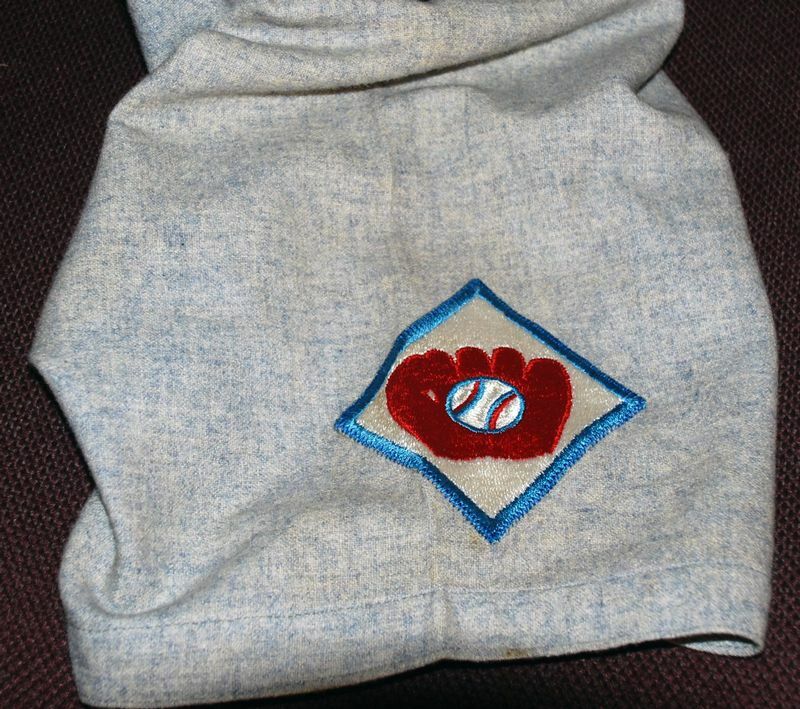 "Blue Jays" was the winner. 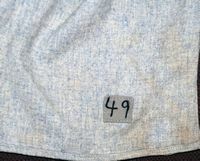 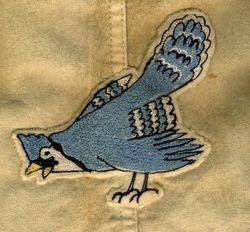 A blue jay logo was designed and added as a sleeve patch. 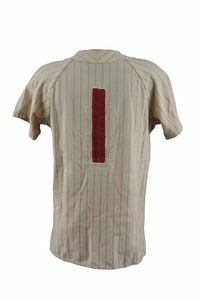 Piping is added to jerseys. 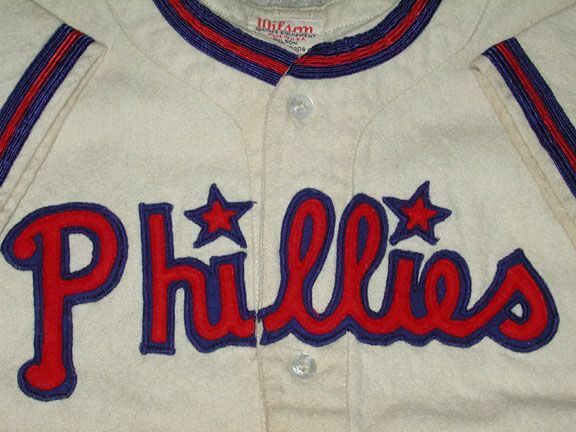 Stars dot the "i's". 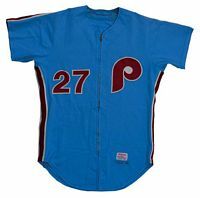 The blue jay is used in promotions but the team name officially remains "Phillies". 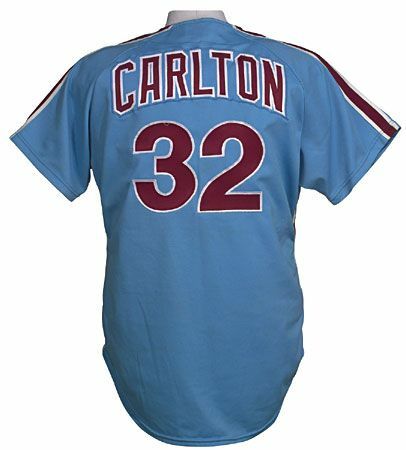 The blue jay flies off the jerseys. 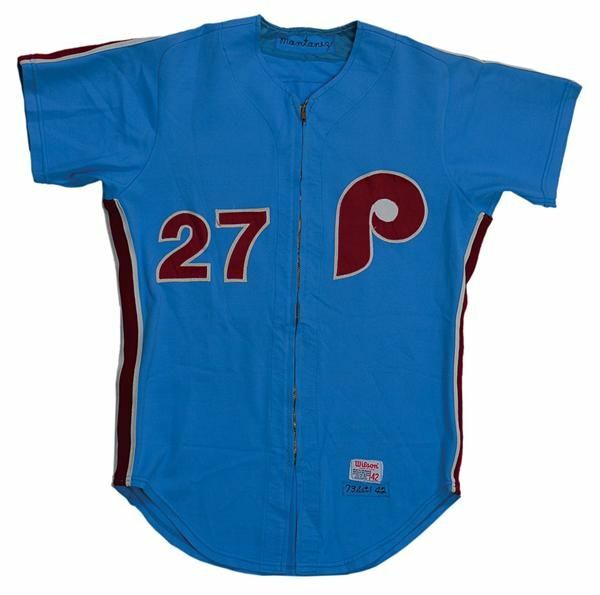 Red with blue trim returns. 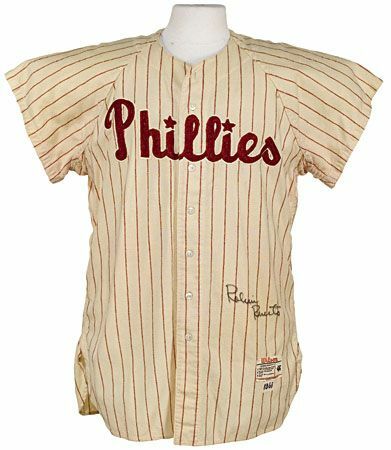 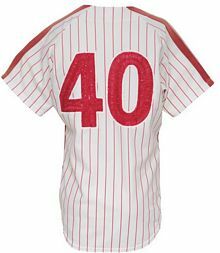 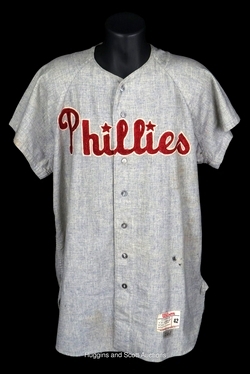 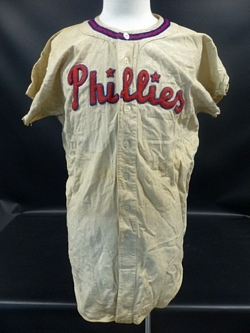 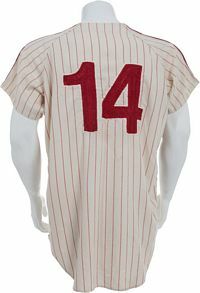 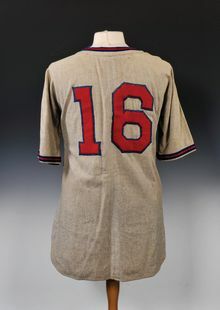 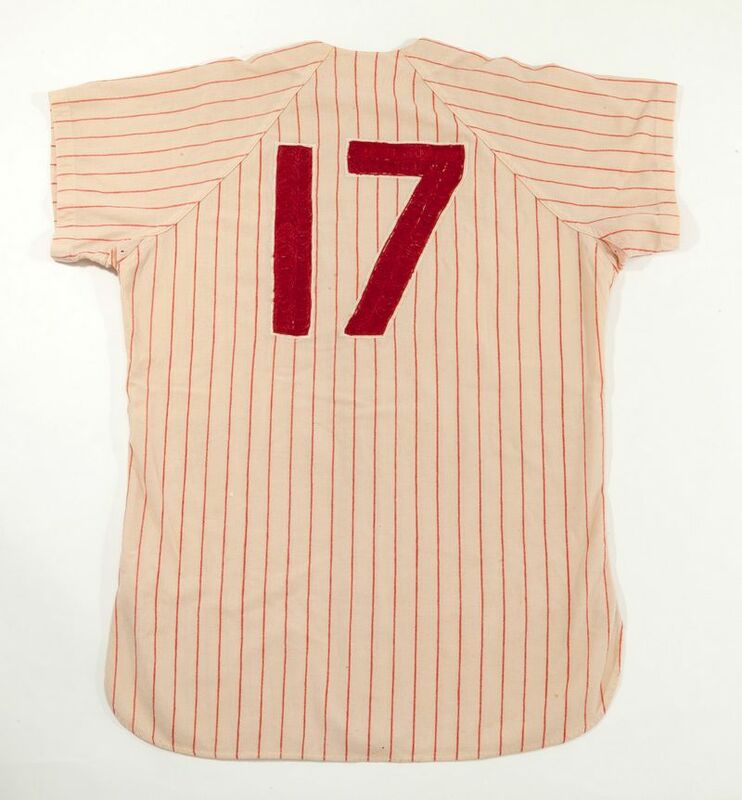 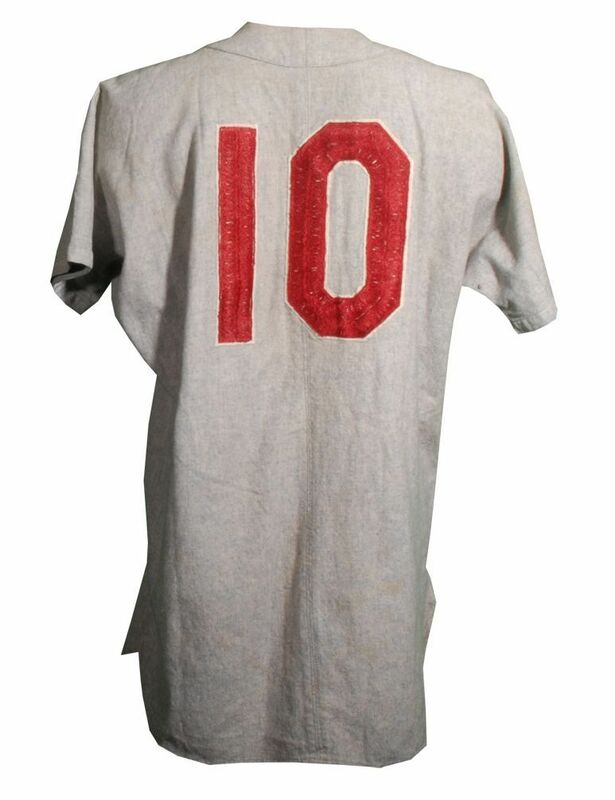 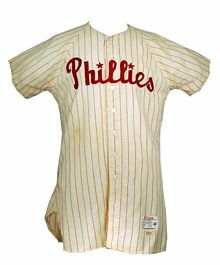 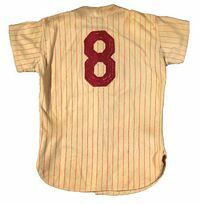 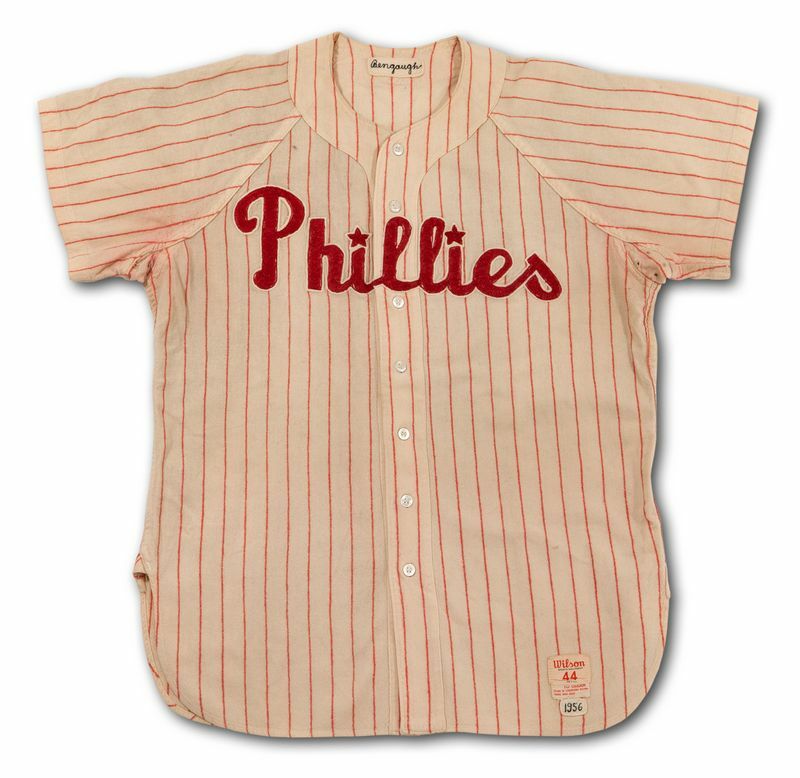 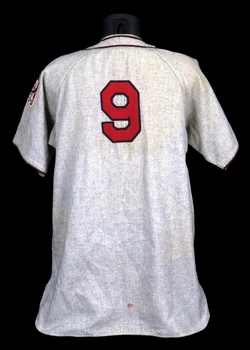 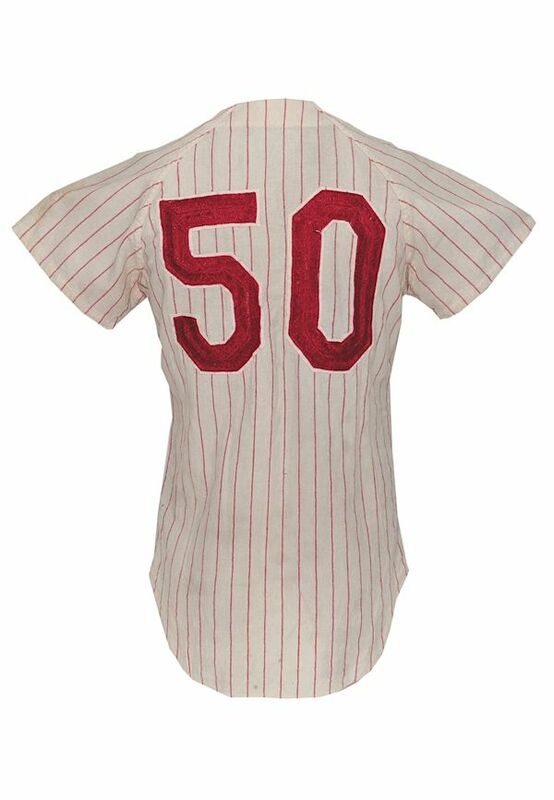 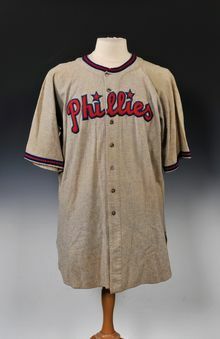 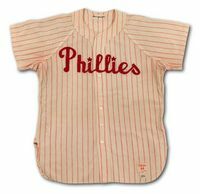 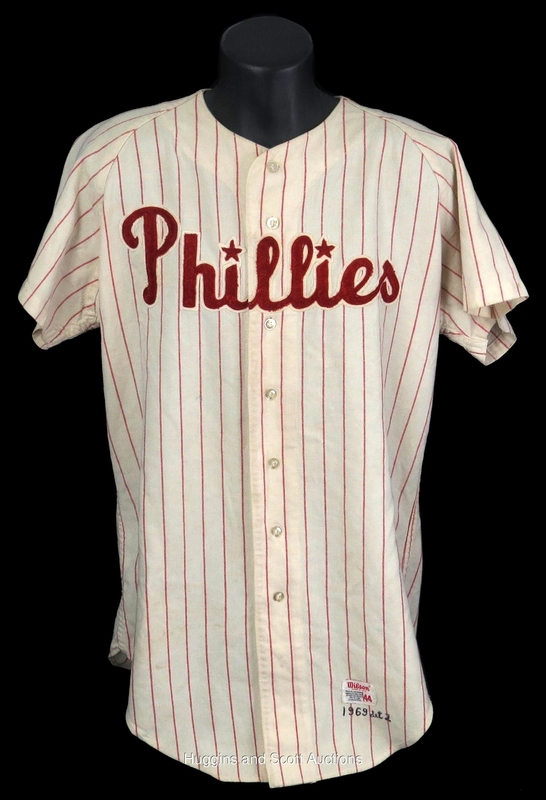 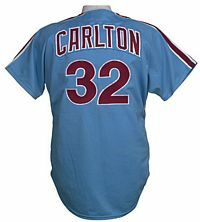 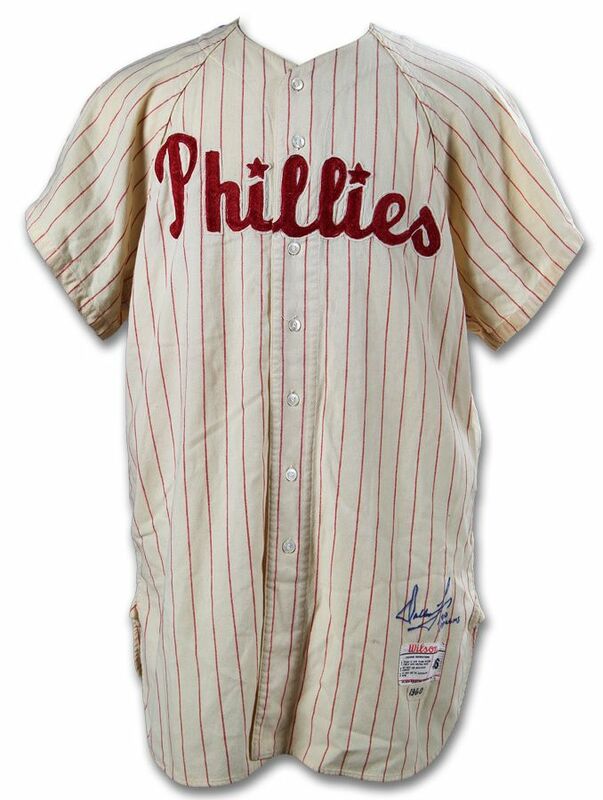 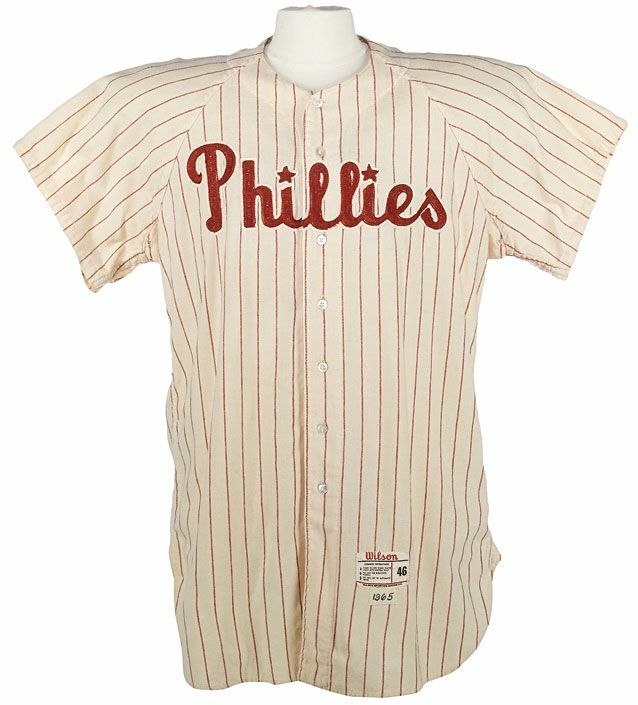 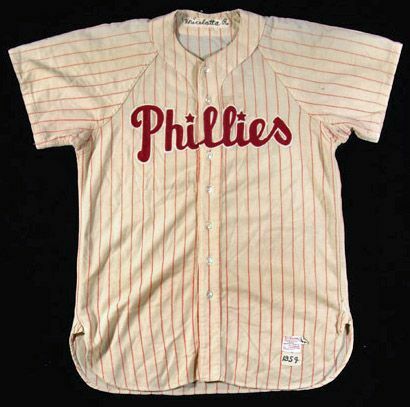 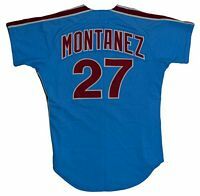 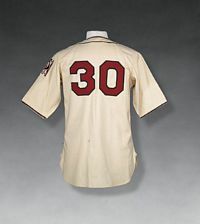 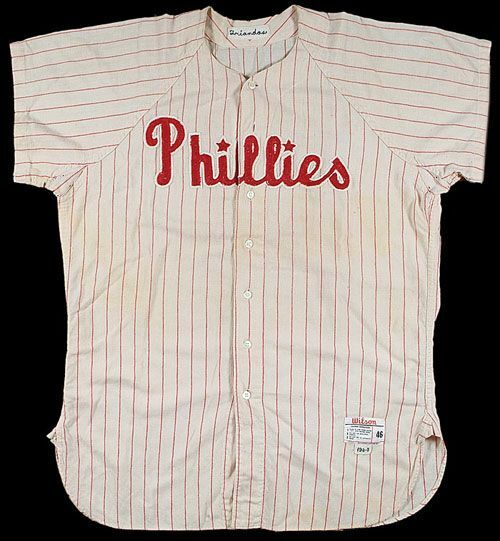 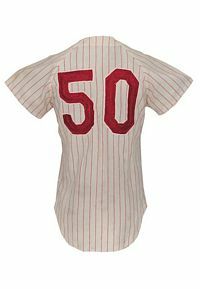 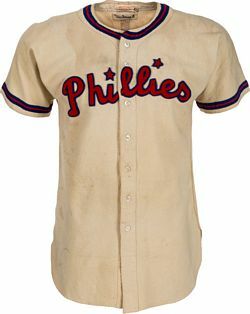 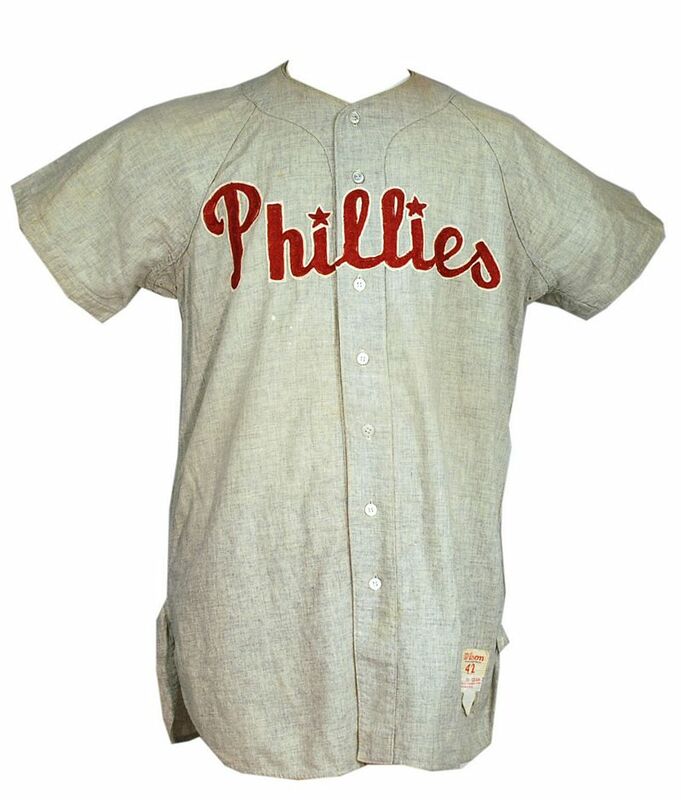 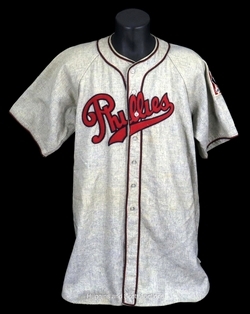 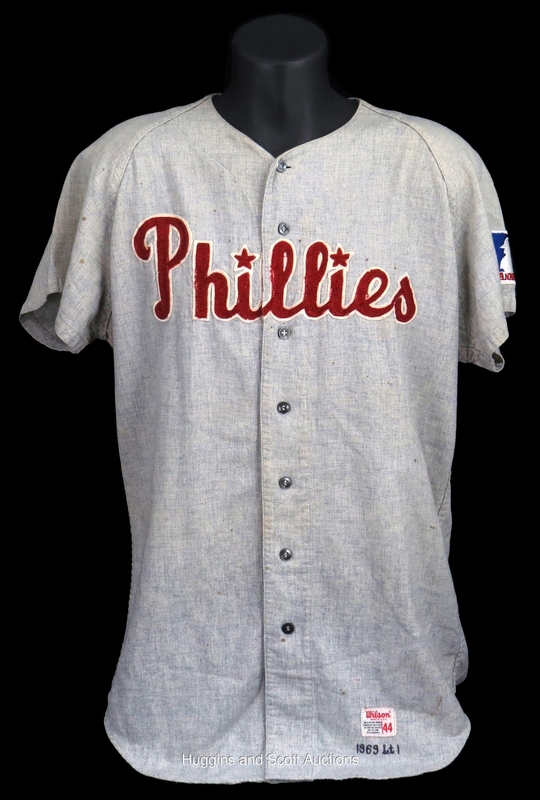 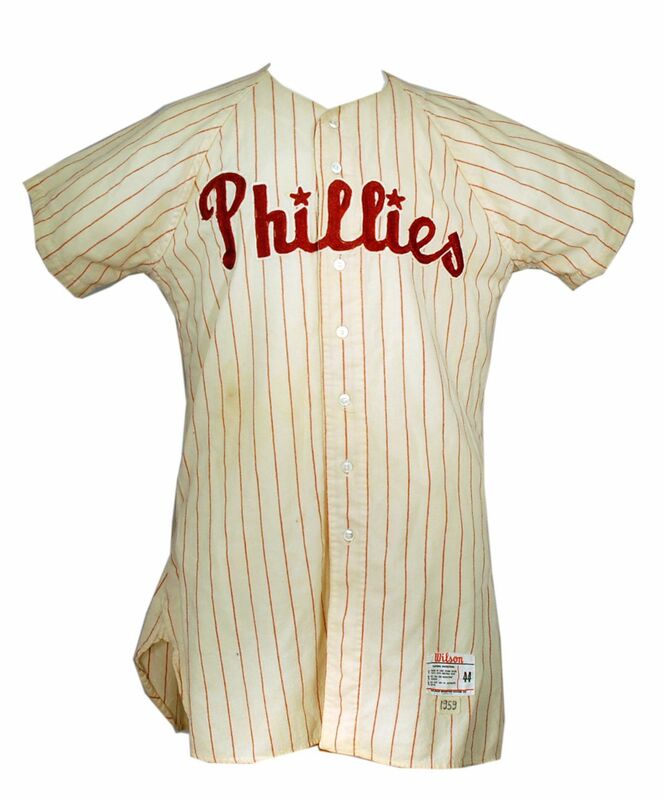 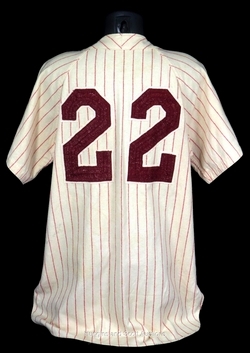 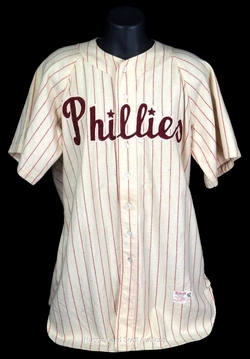 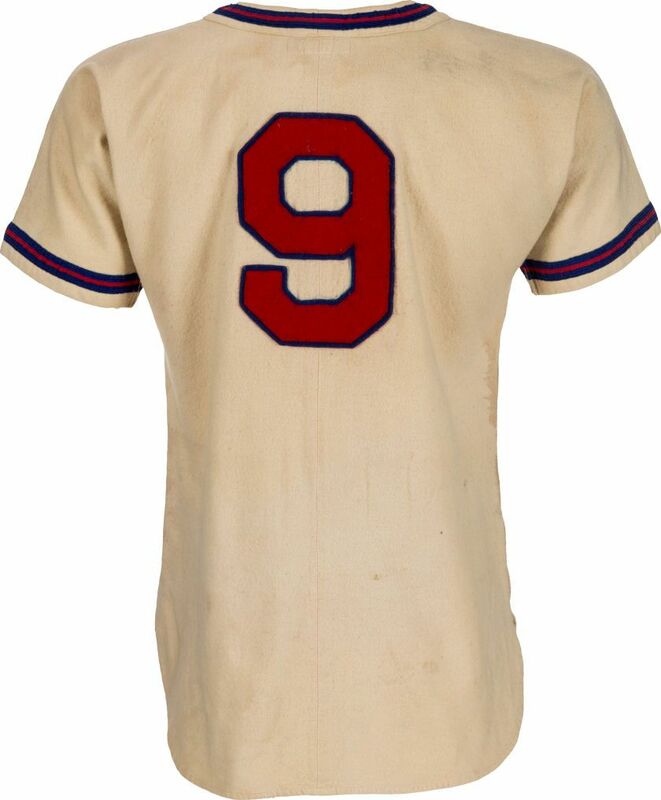 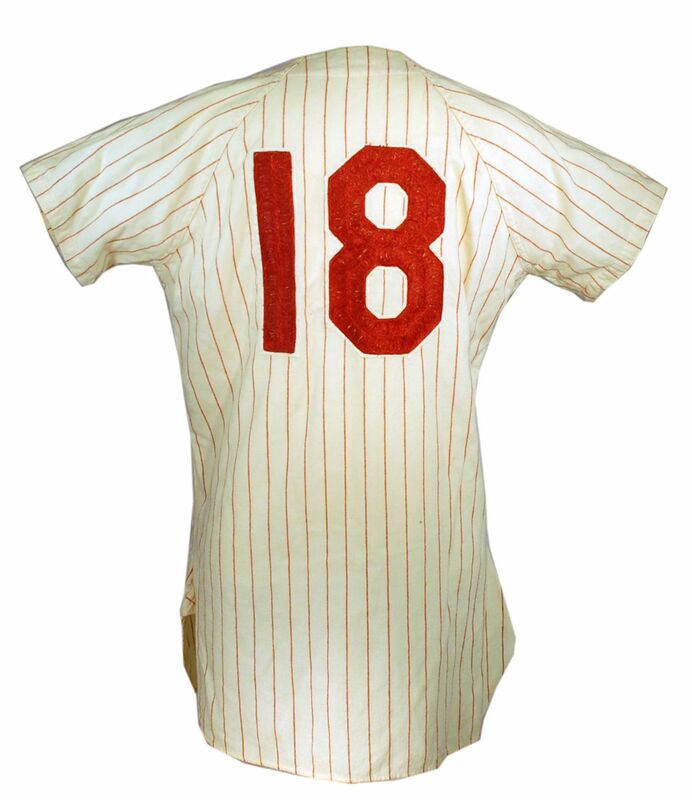 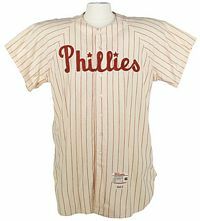 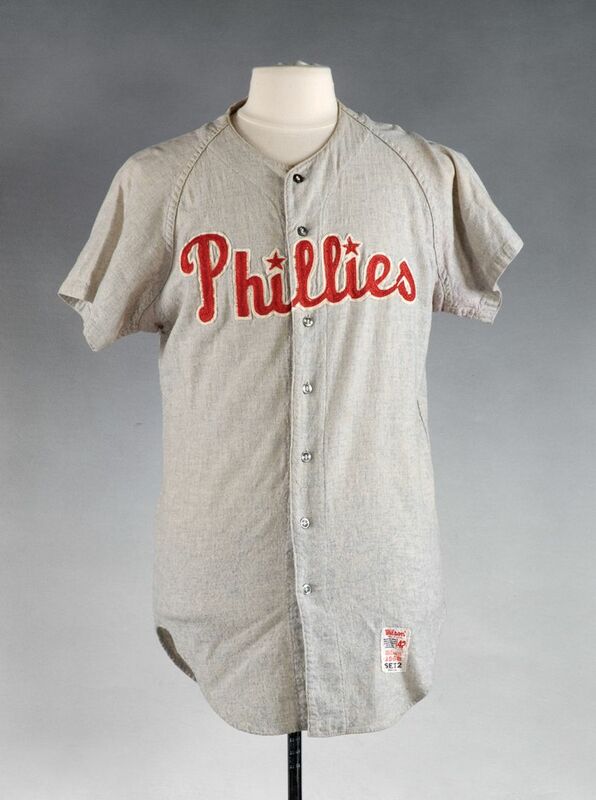 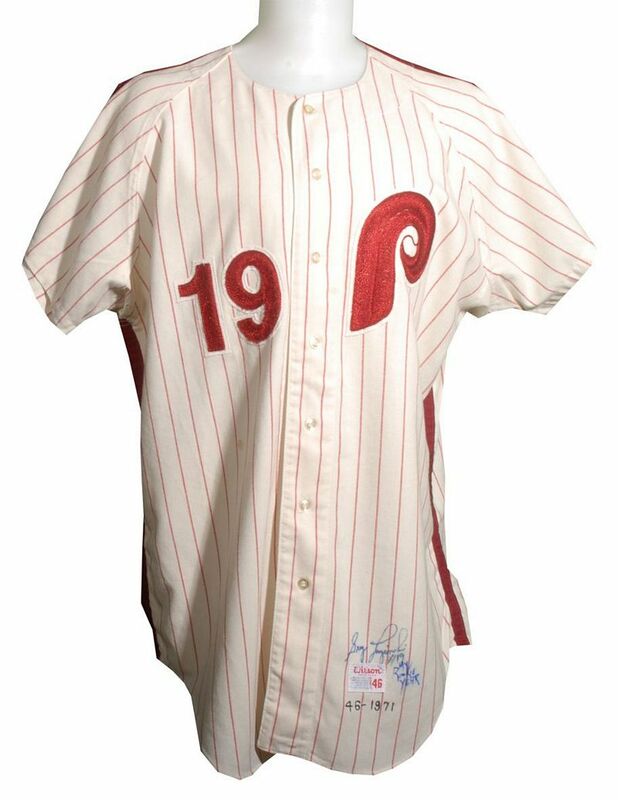 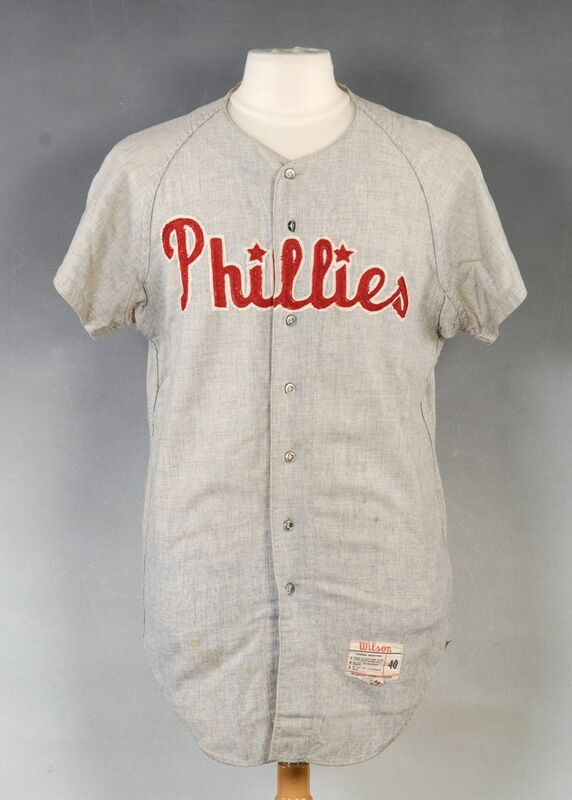 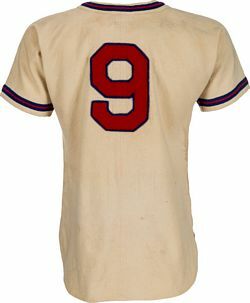 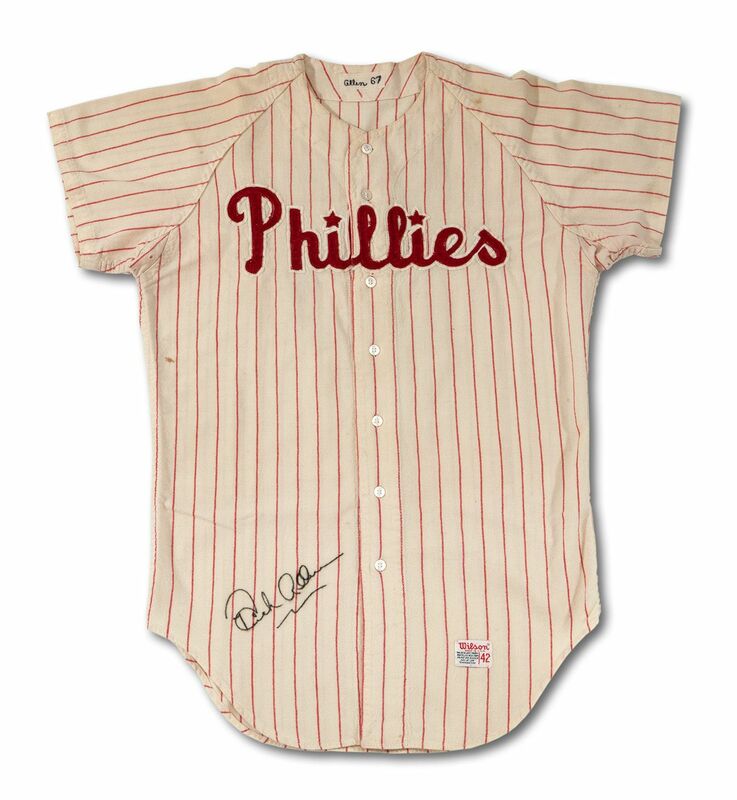 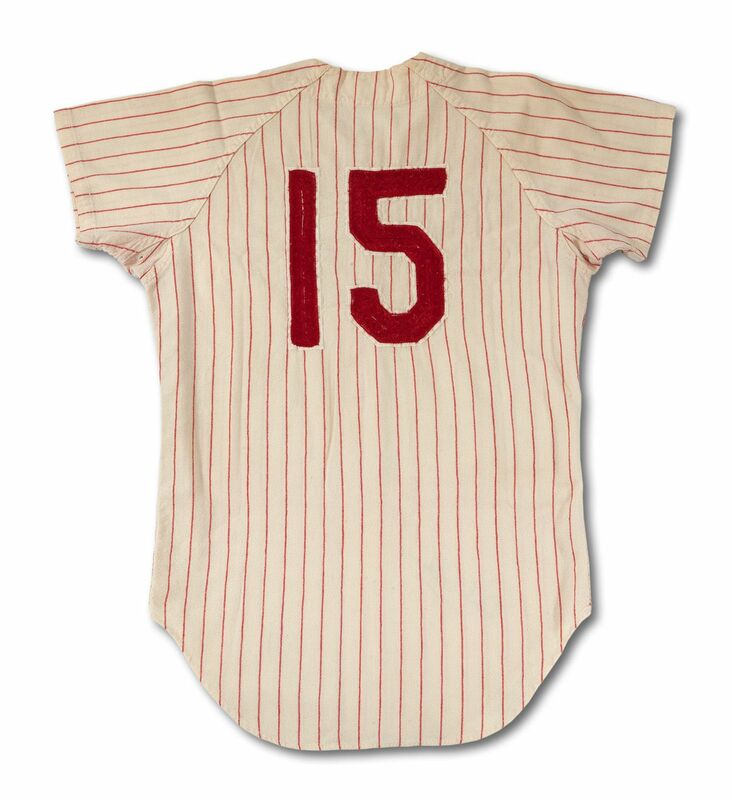 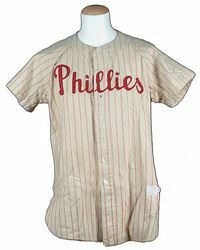 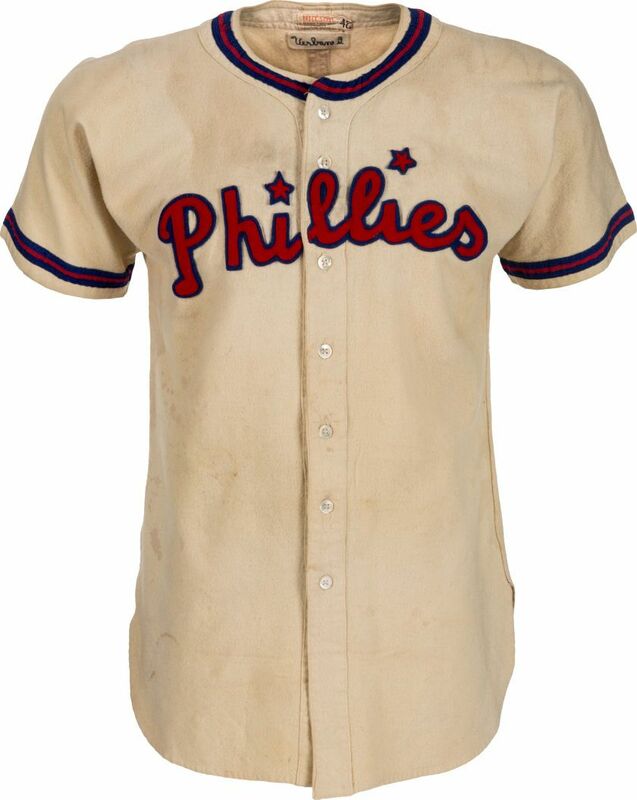 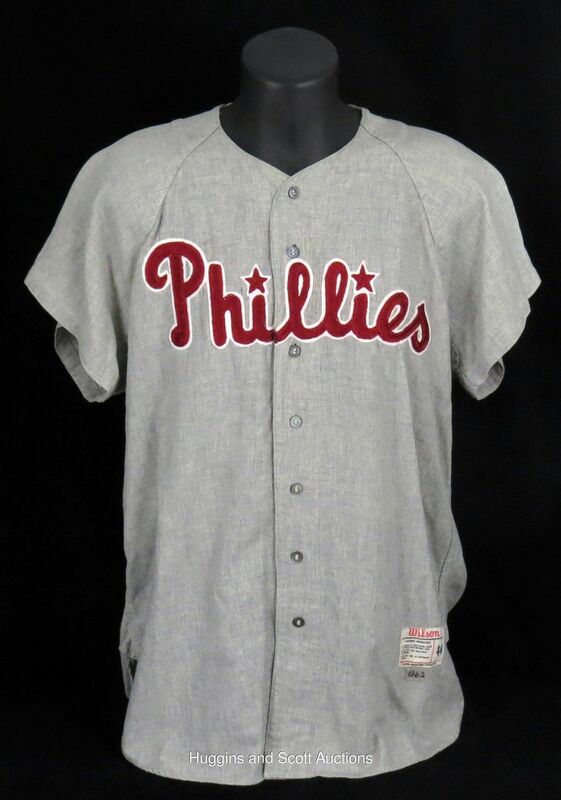 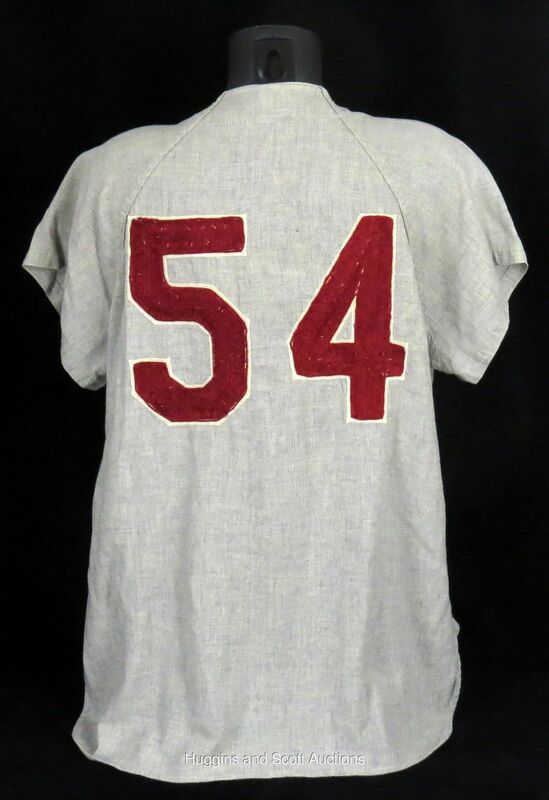 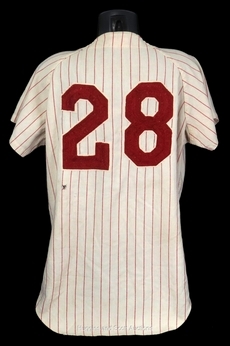 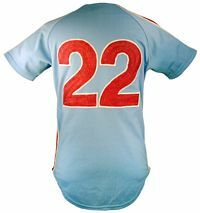 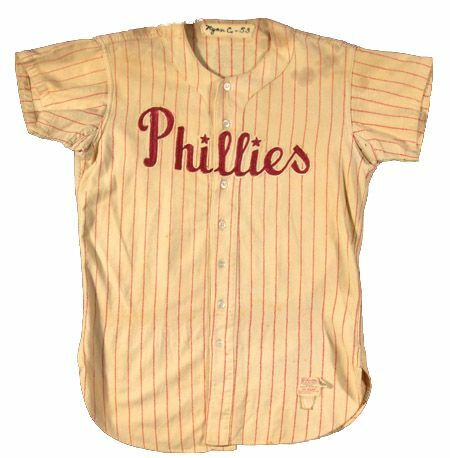 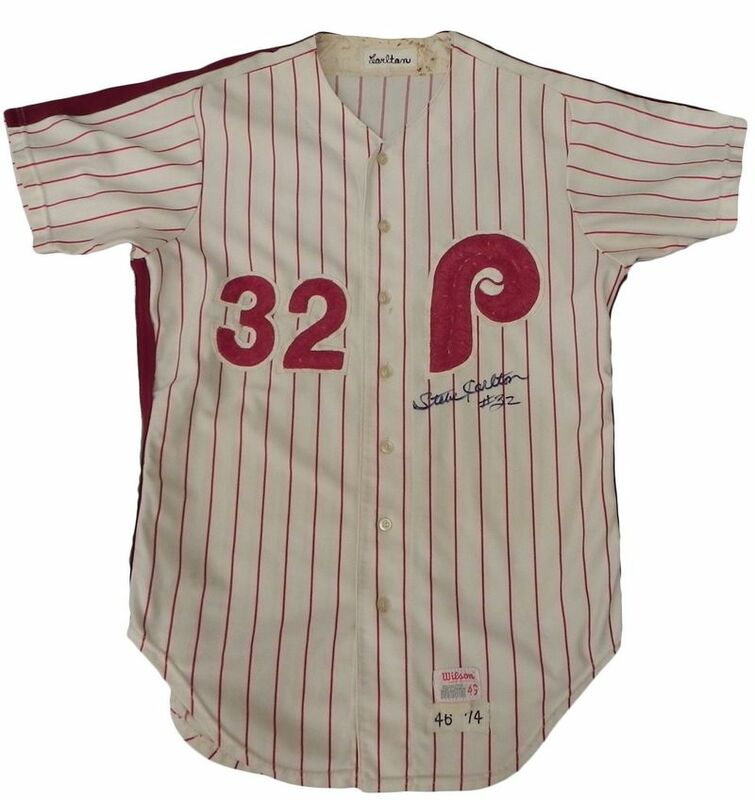 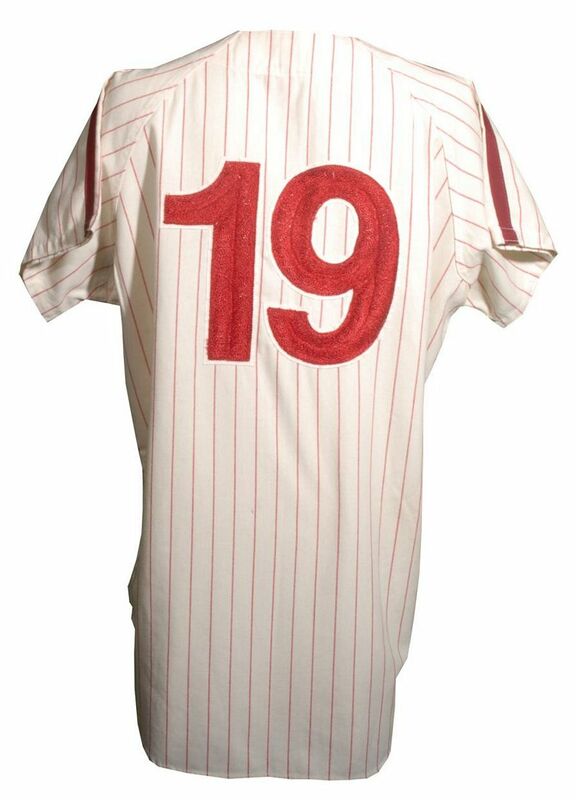 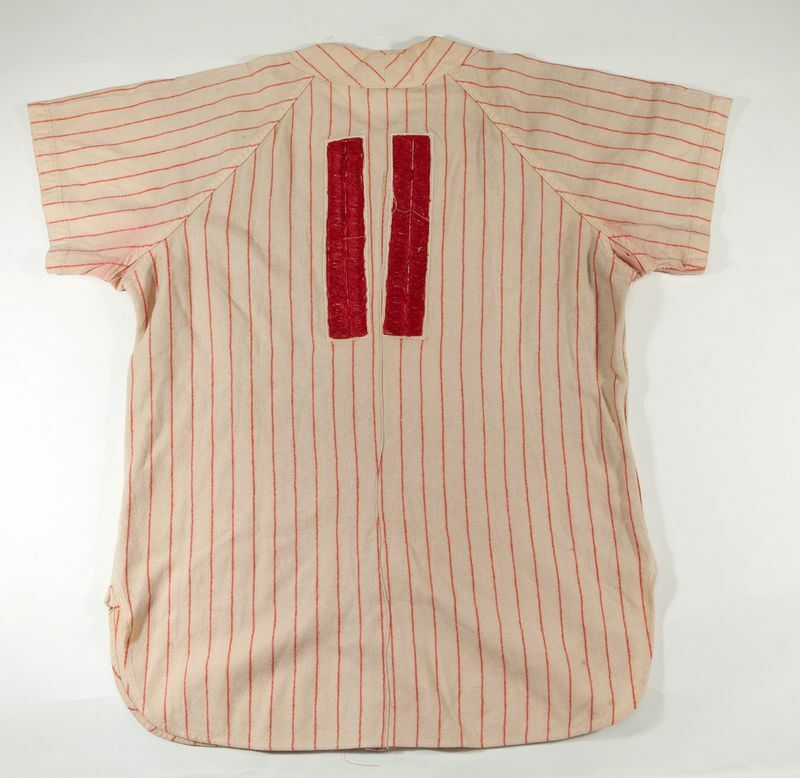 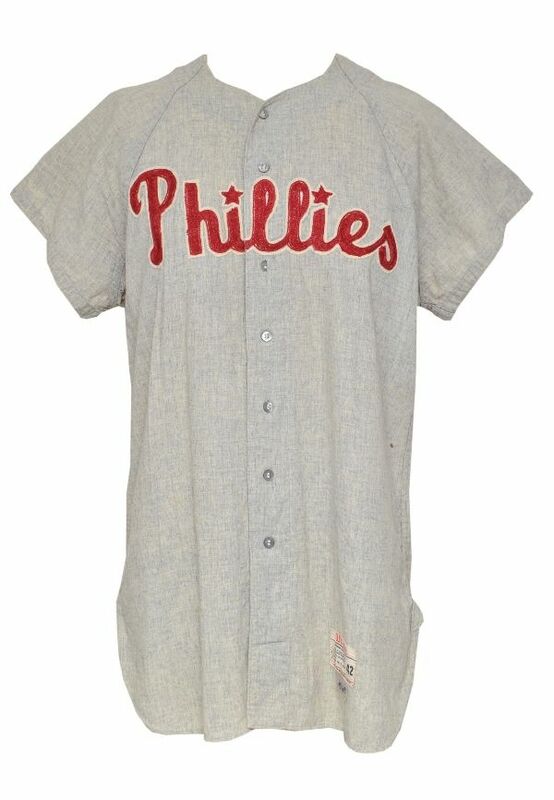 Note the different style collar piping and the first "i" in "Phillies" is shifted to the left side of the jersey. 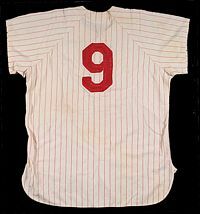 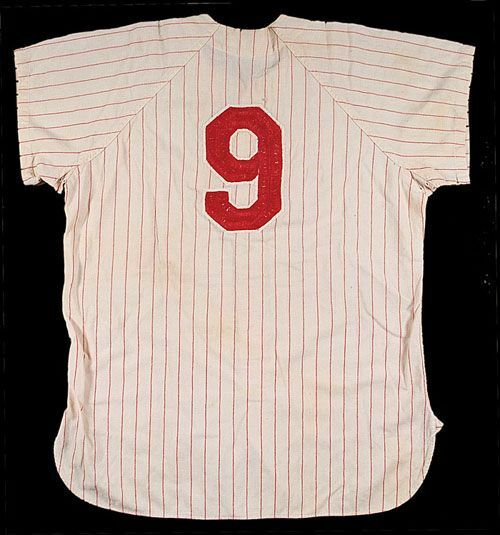 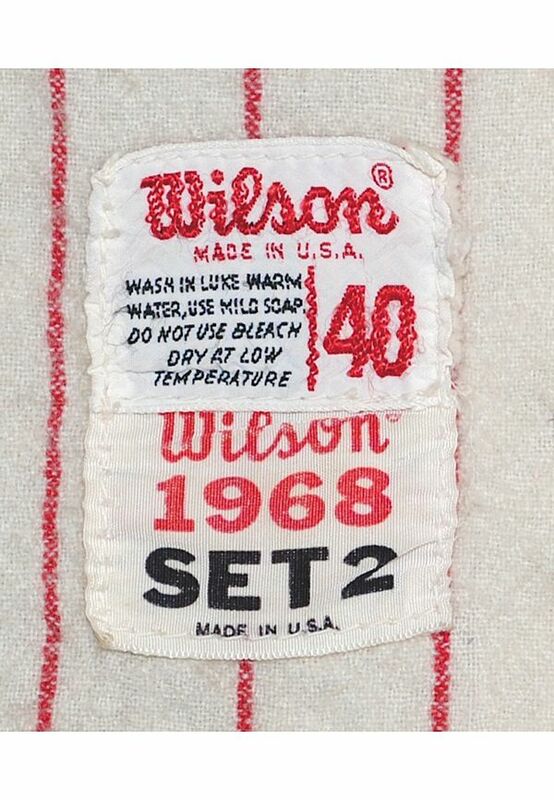 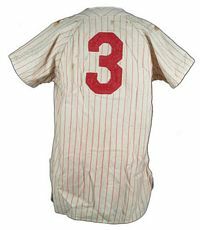 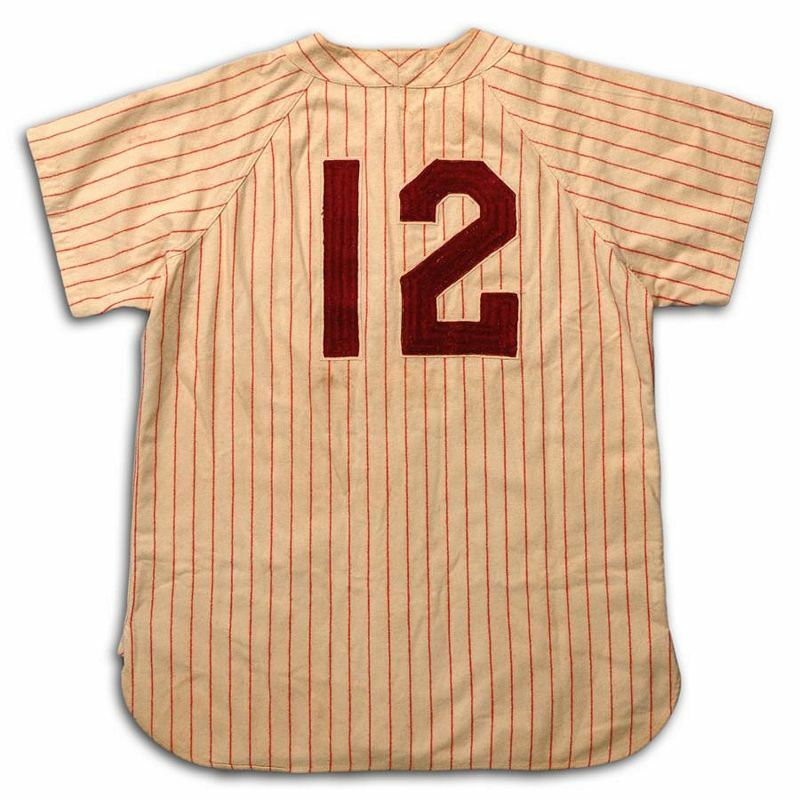 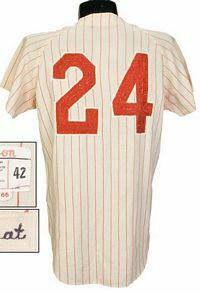 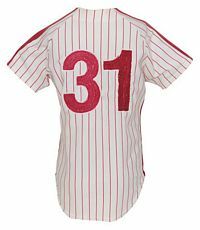 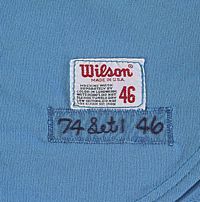 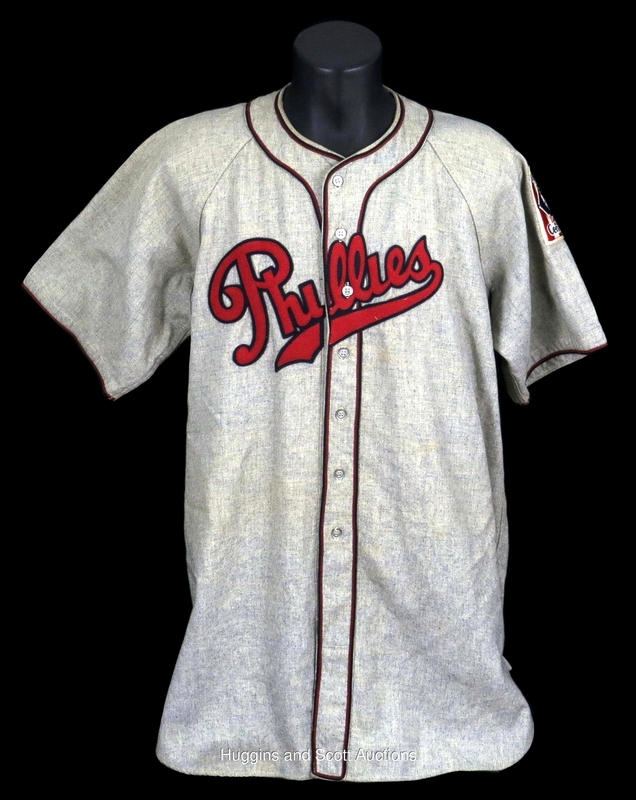 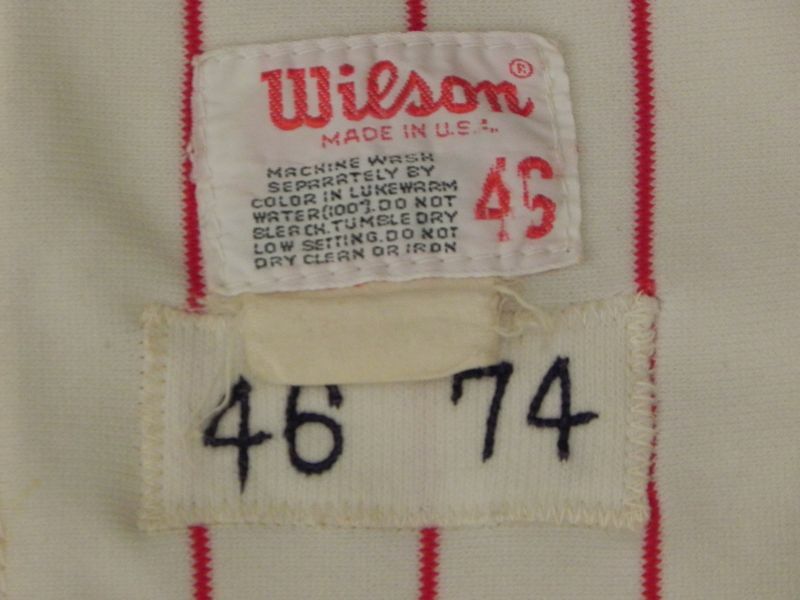 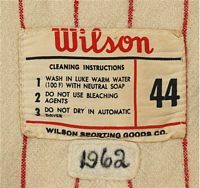 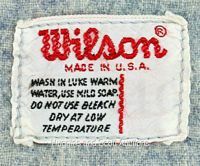 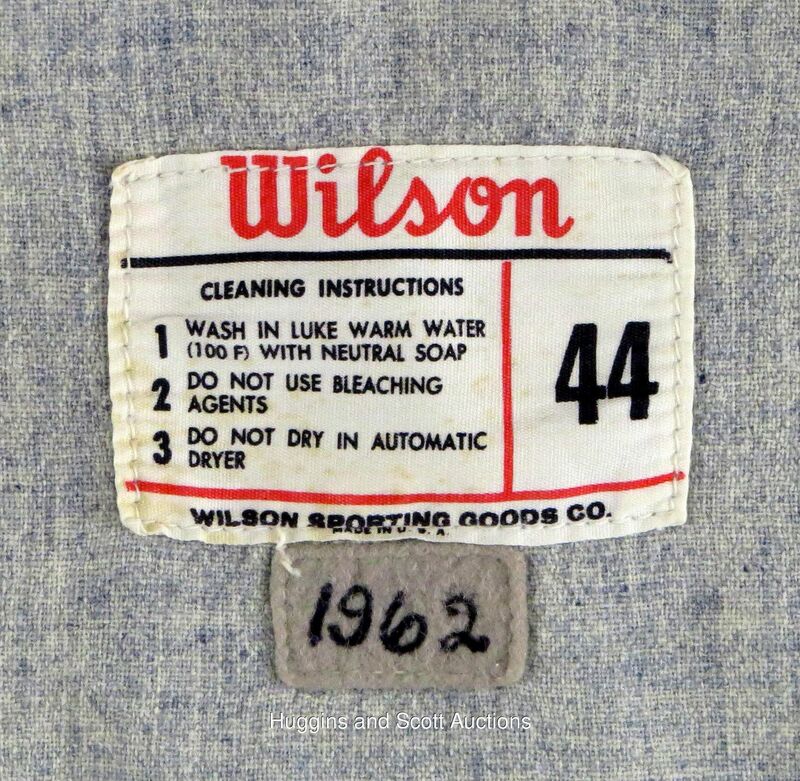 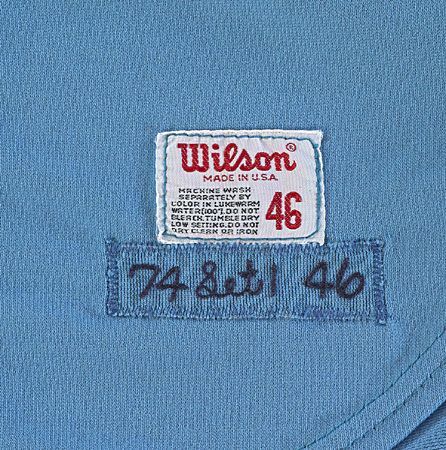 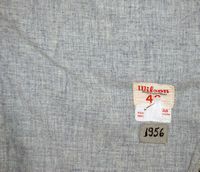 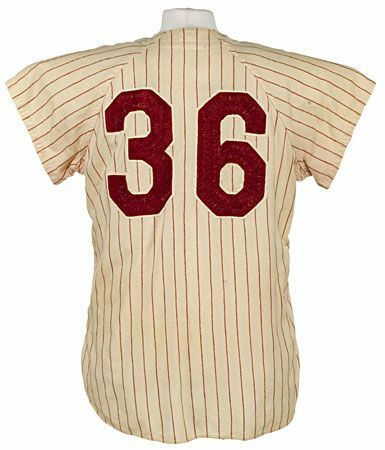 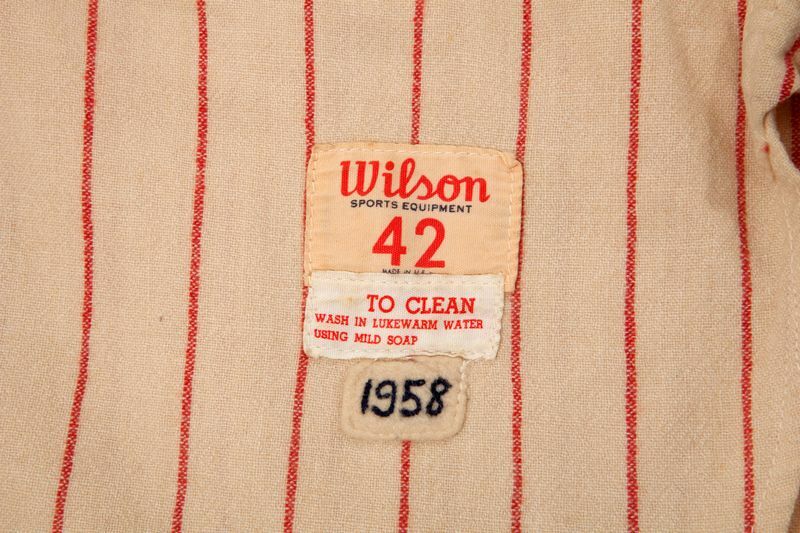 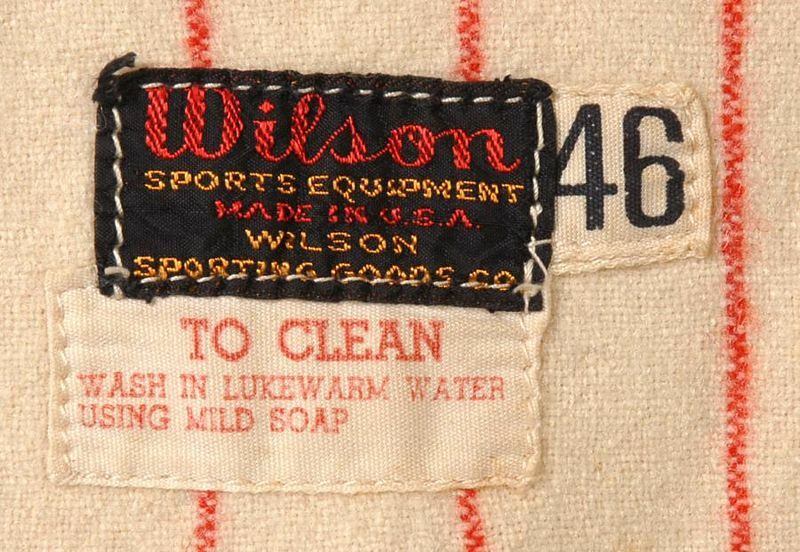 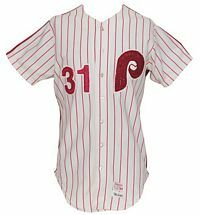 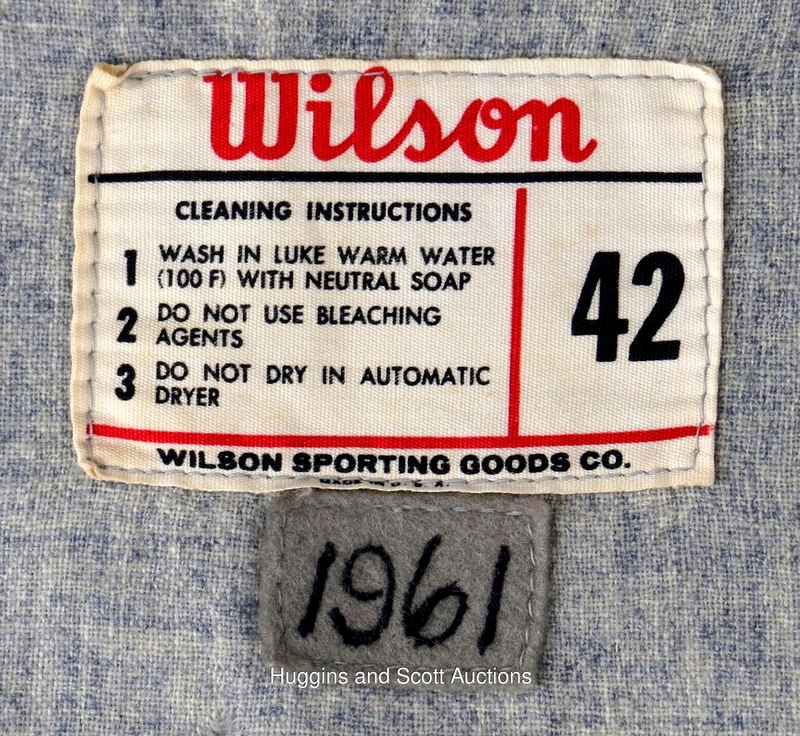 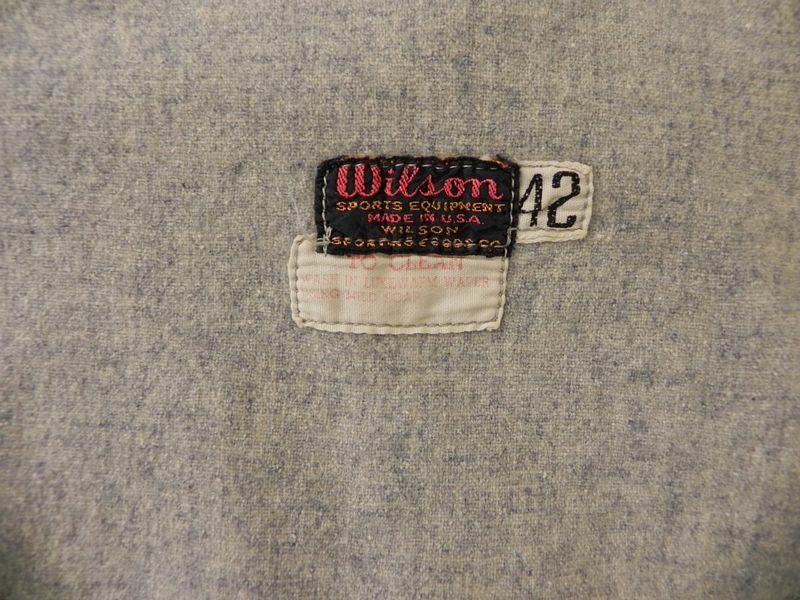 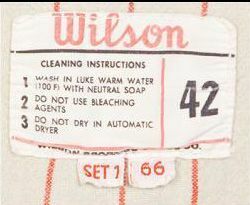 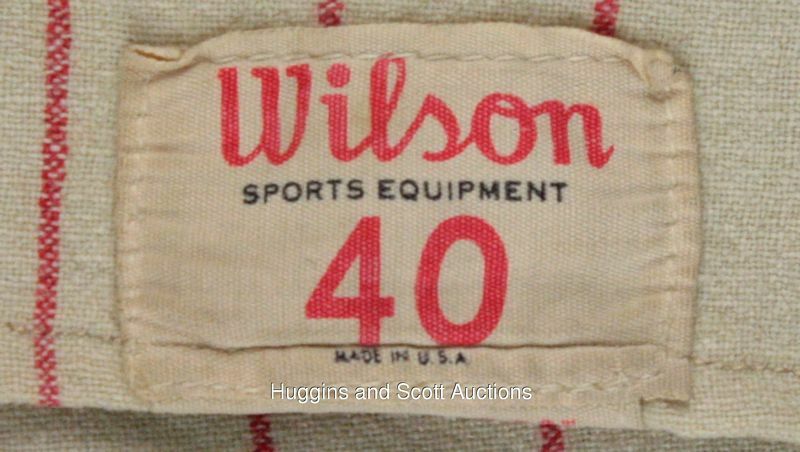 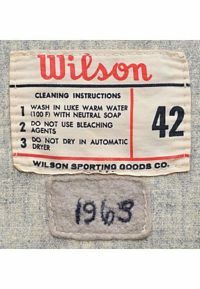 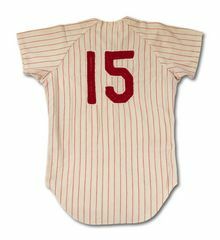 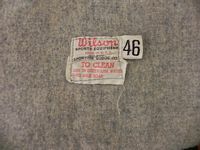 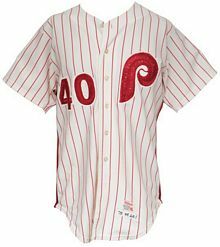 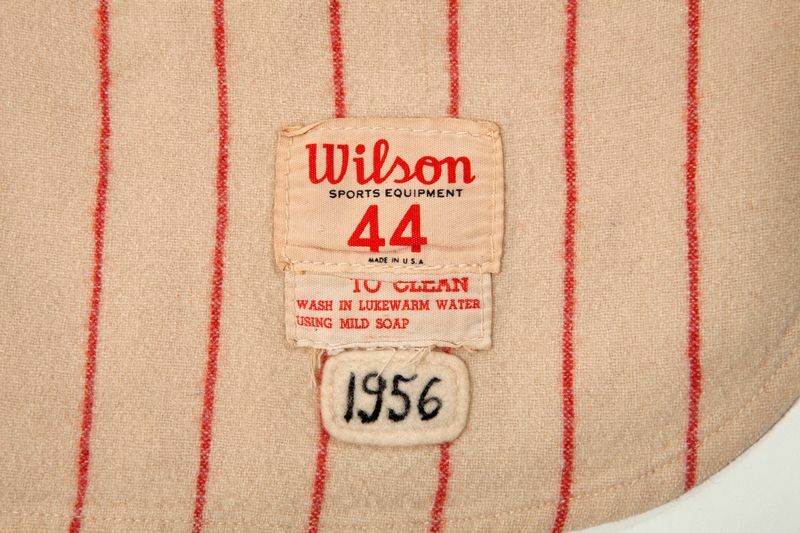 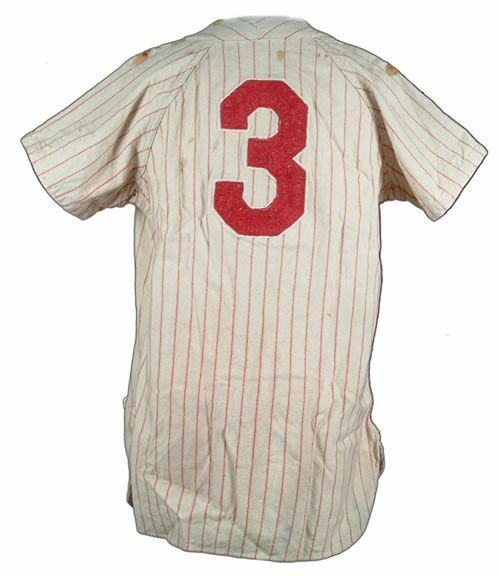 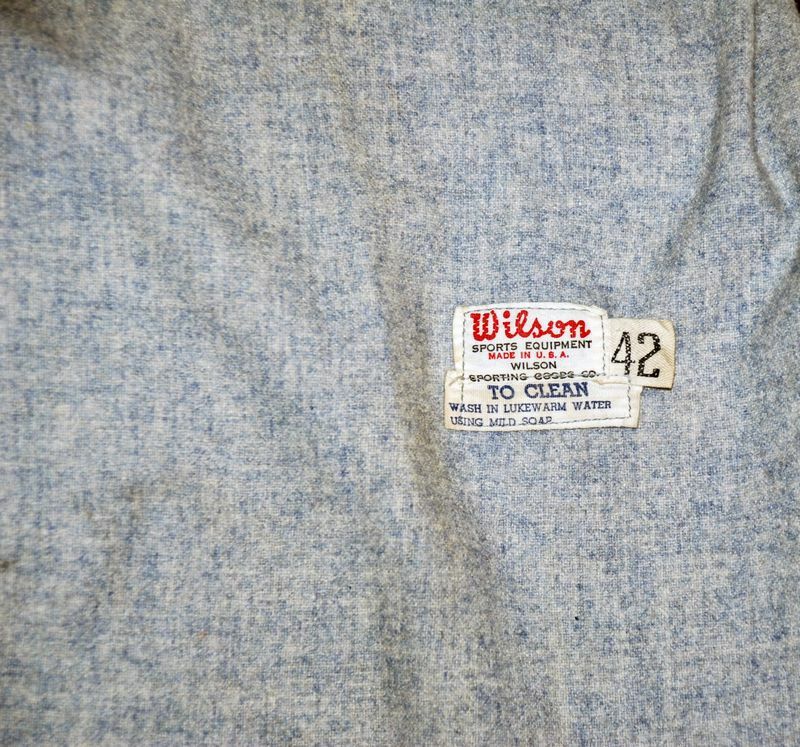 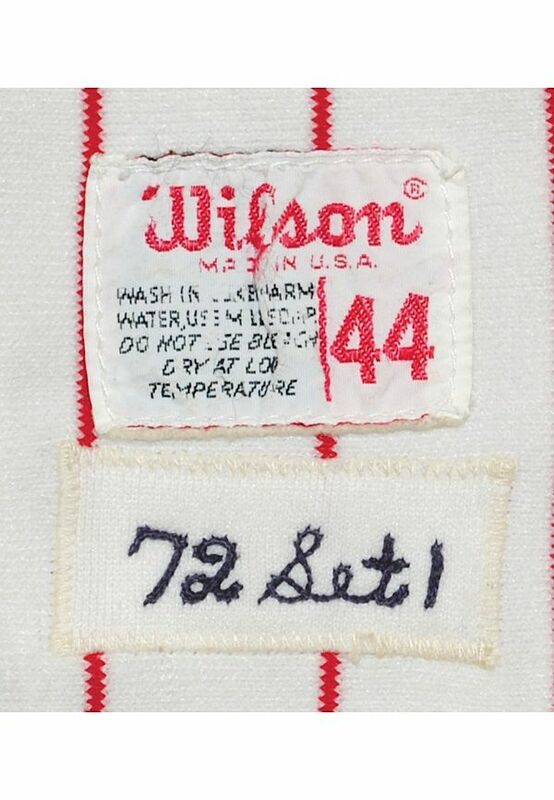 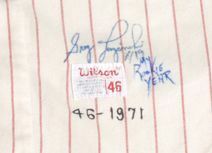 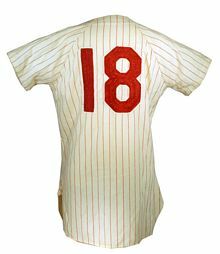 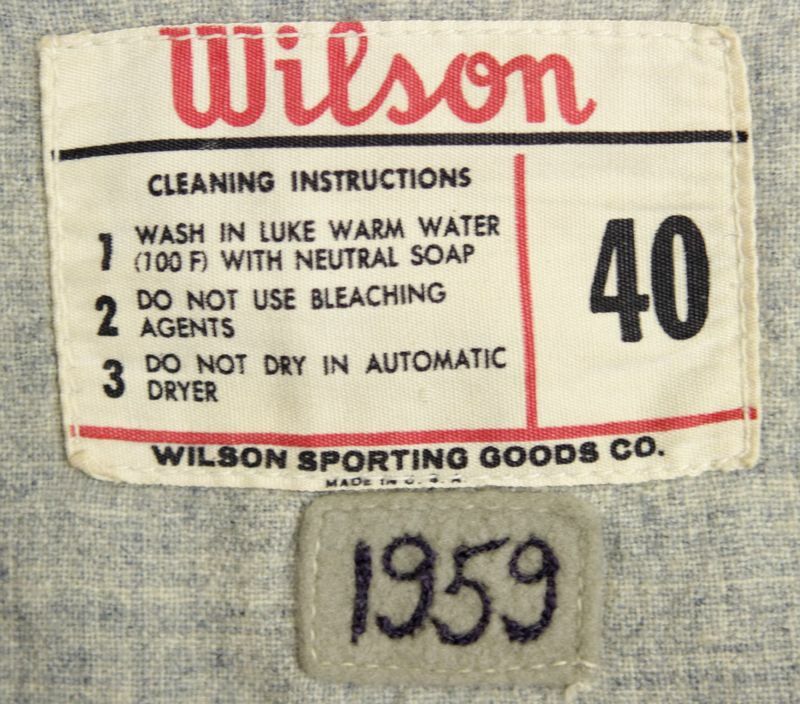 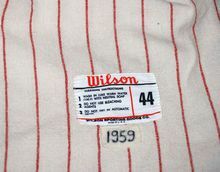 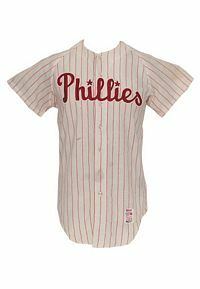 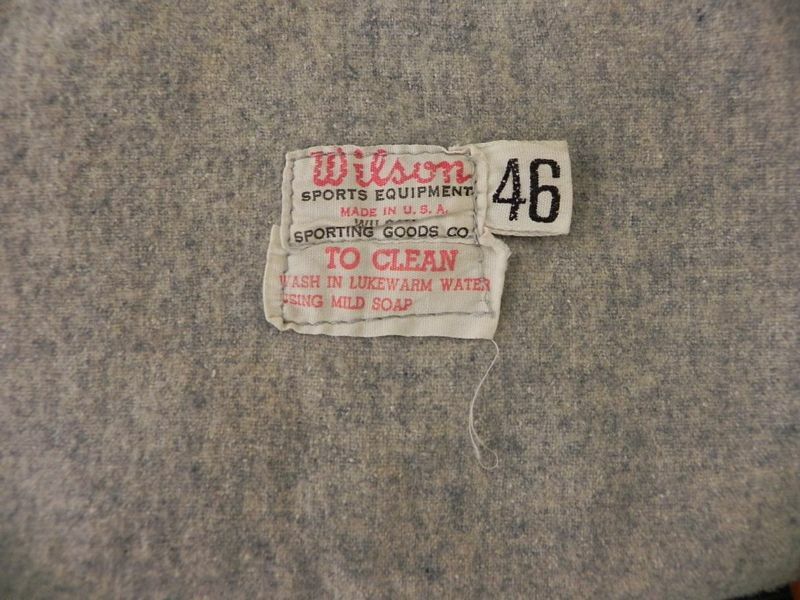 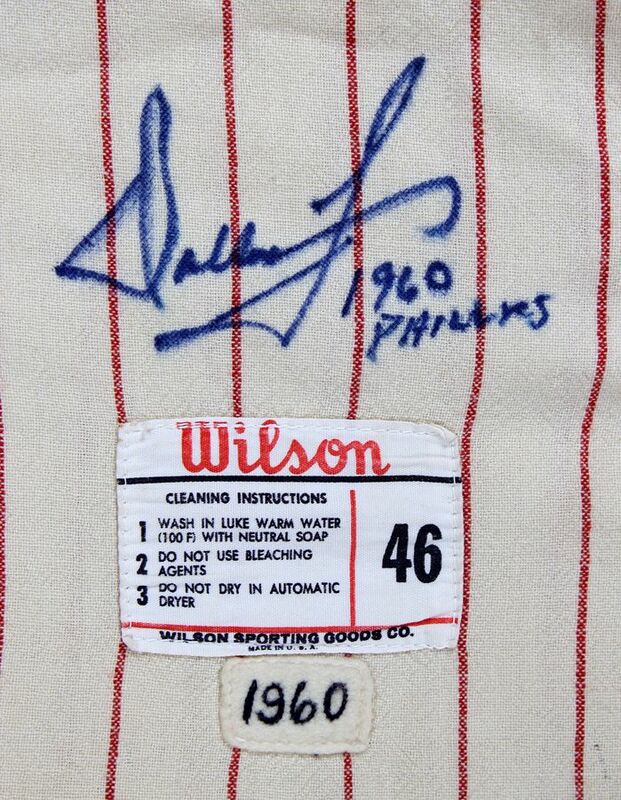 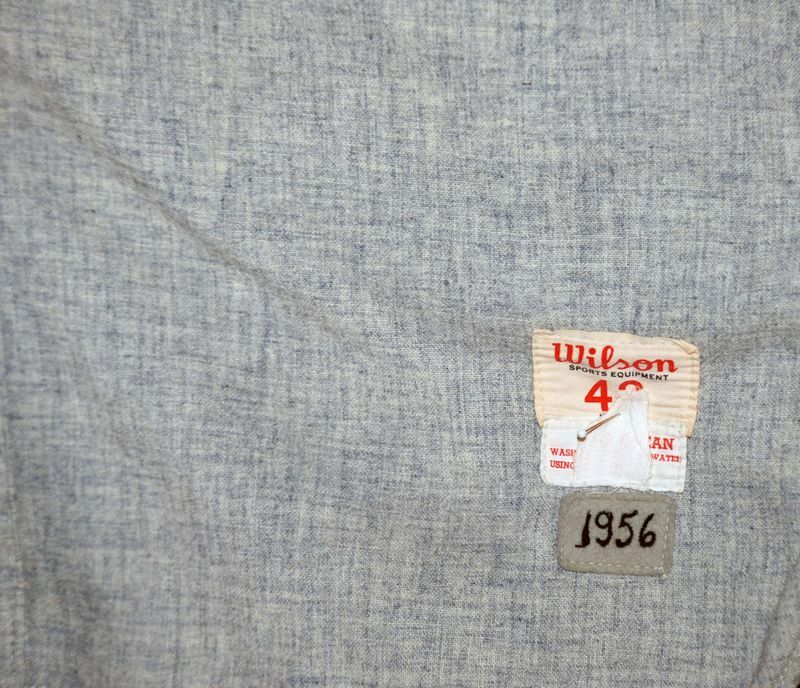 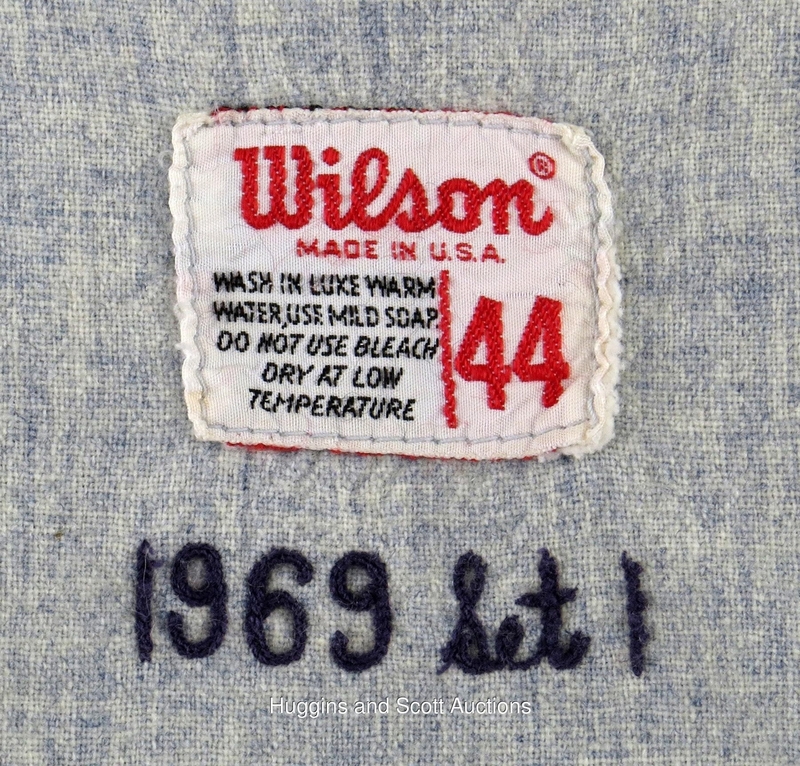 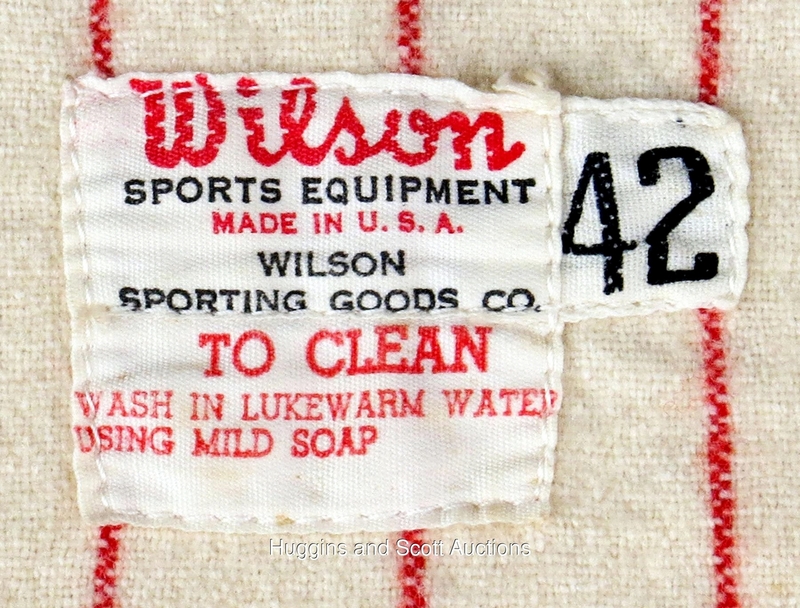 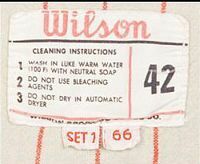 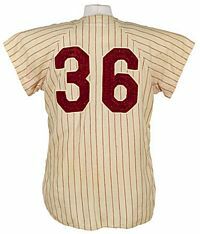 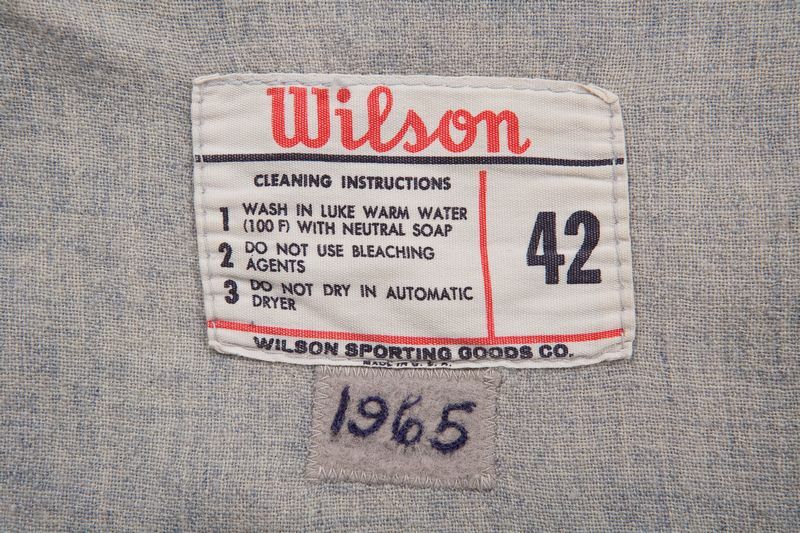 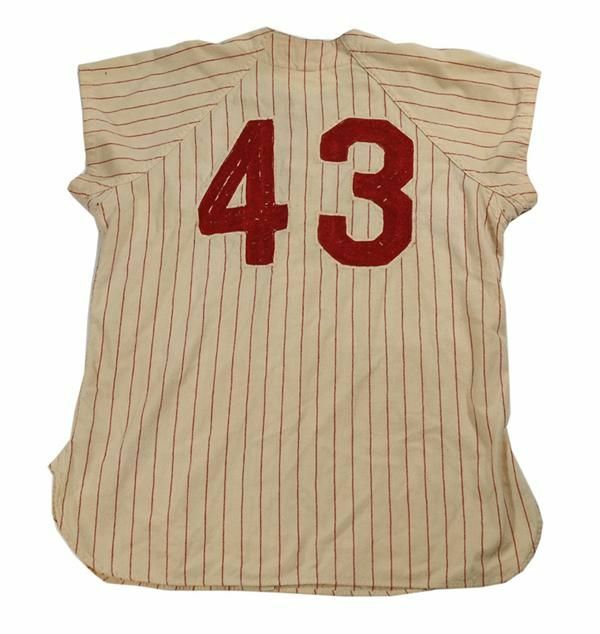 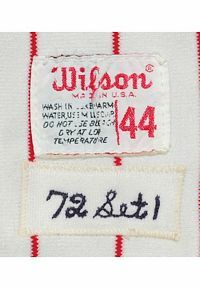 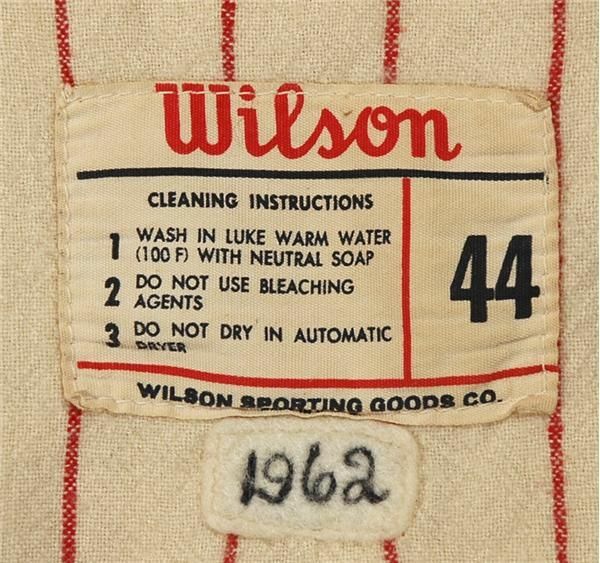 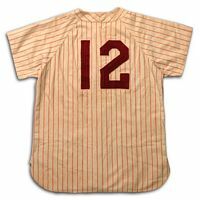 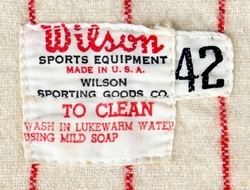 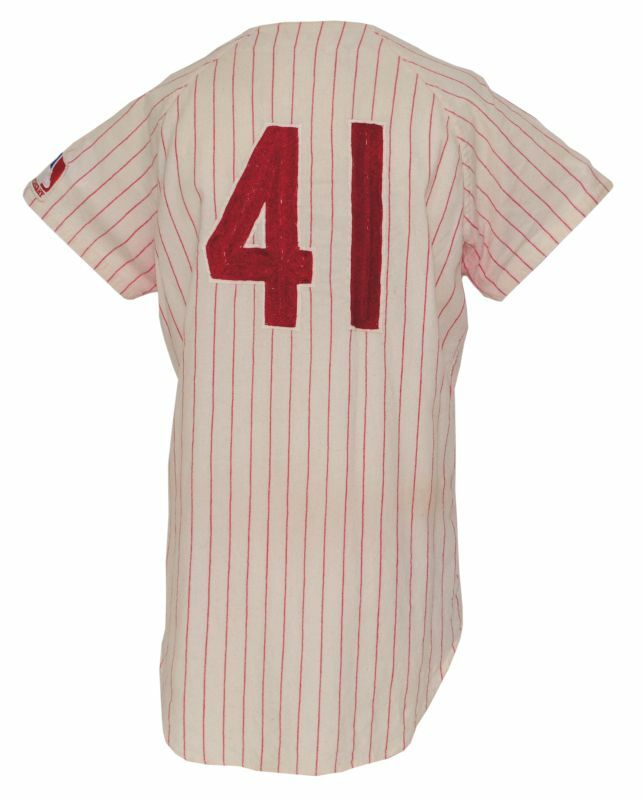 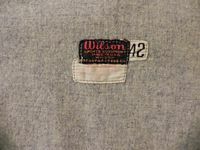 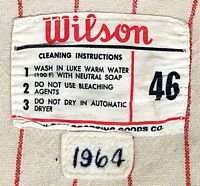 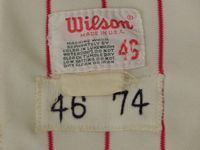 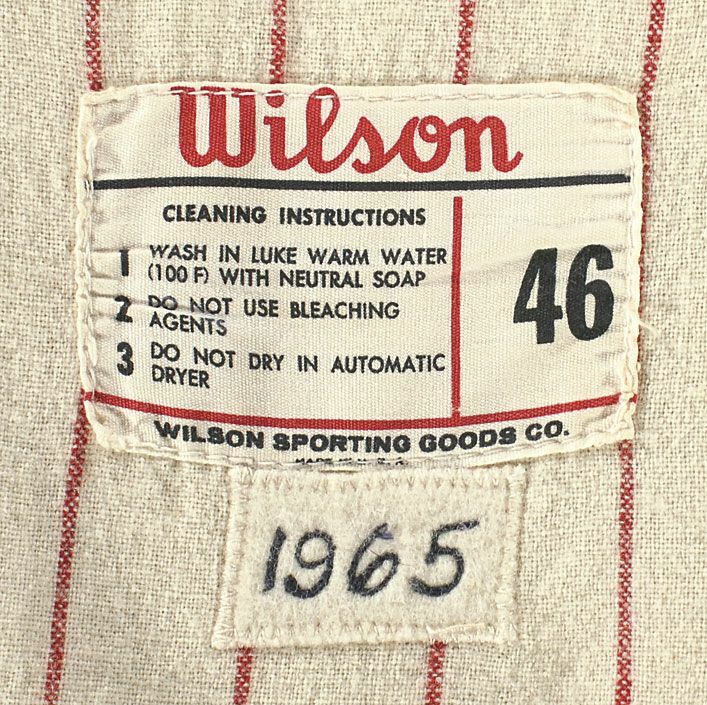 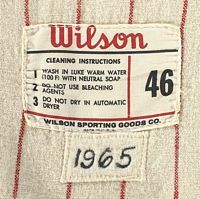 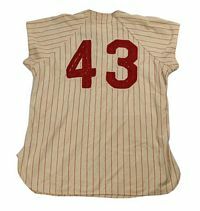 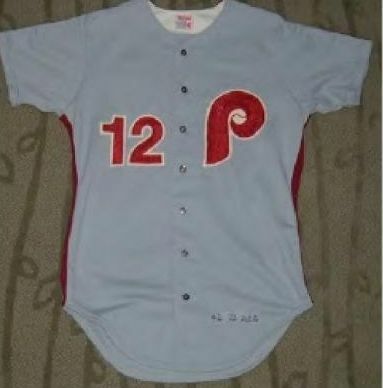 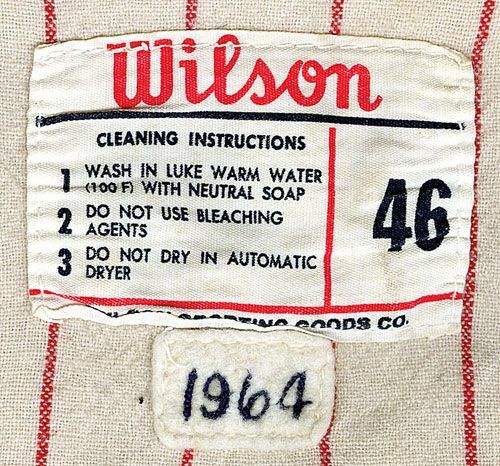 Probably due to the change in manufacturer to Wilson, collar piping changed and the "i" in "Phillies" shifts to the right side of the jersey. 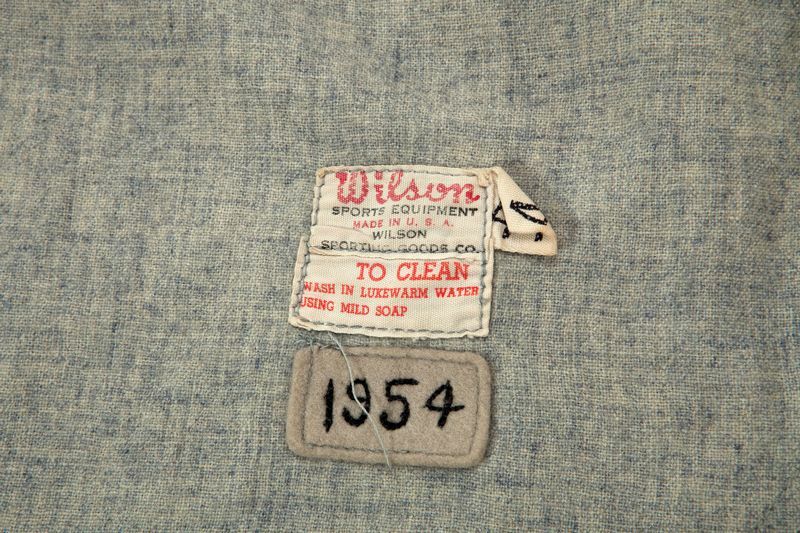 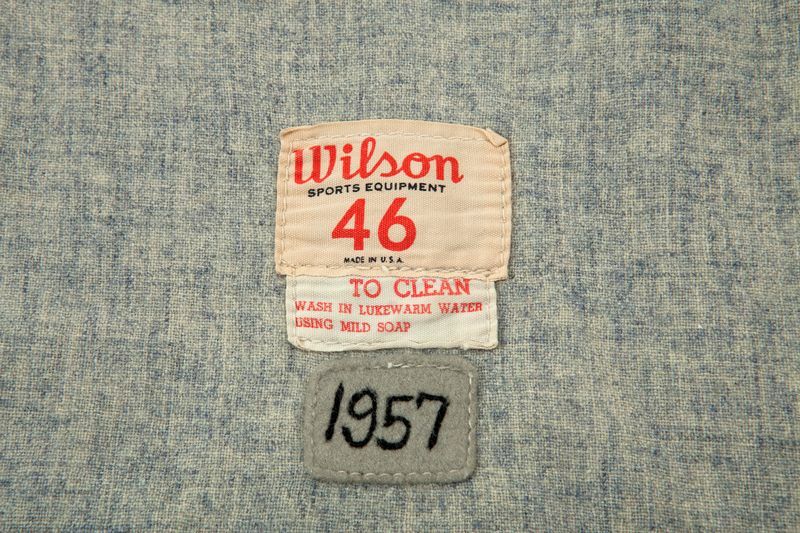 In mid season 1948, royal blue replaces navy. 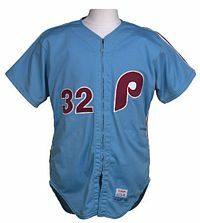 I honestly can't tell the difference. The Blue Jay nickname is officially dropped after 1949. 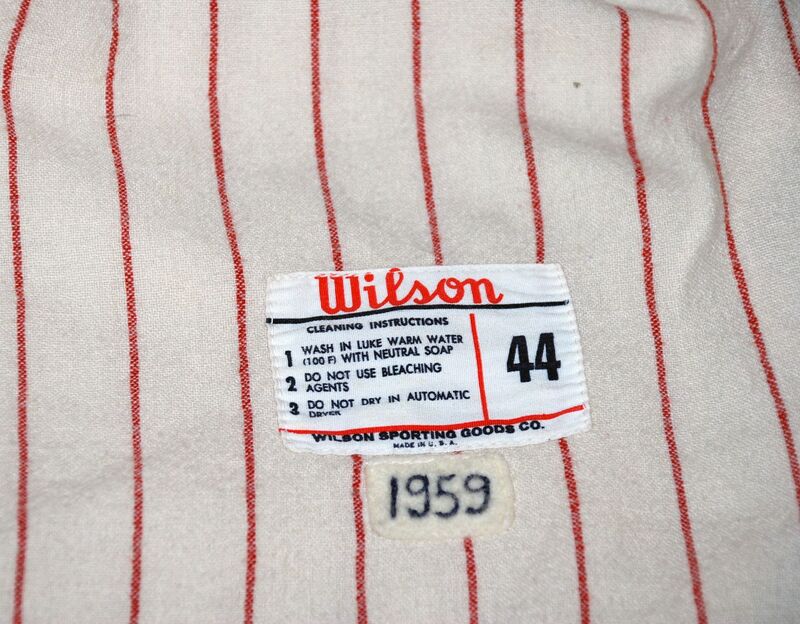 Red pinstripes for home. 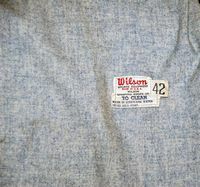 Blue is dropped. 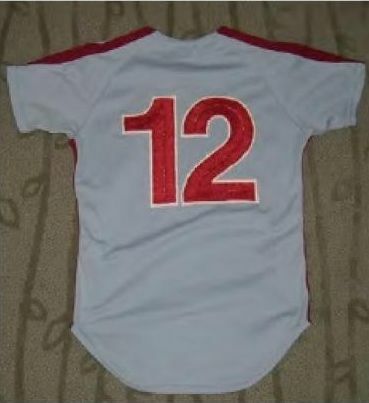 Trim changed to white. 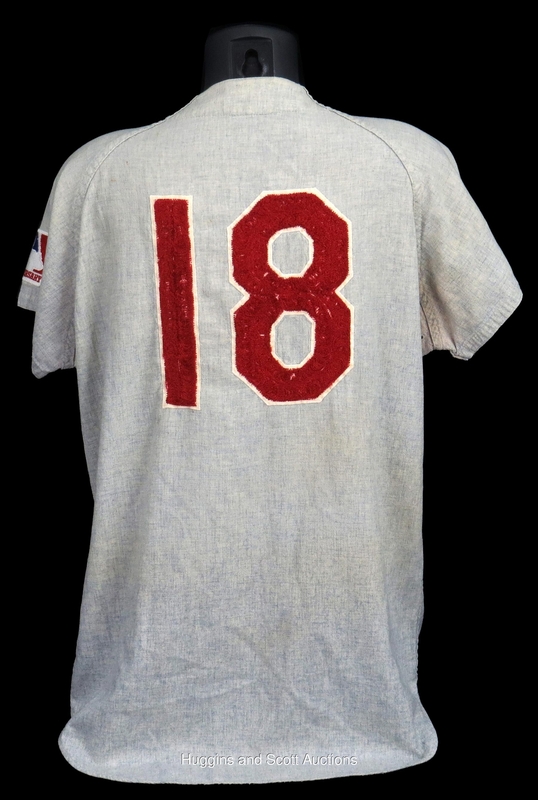 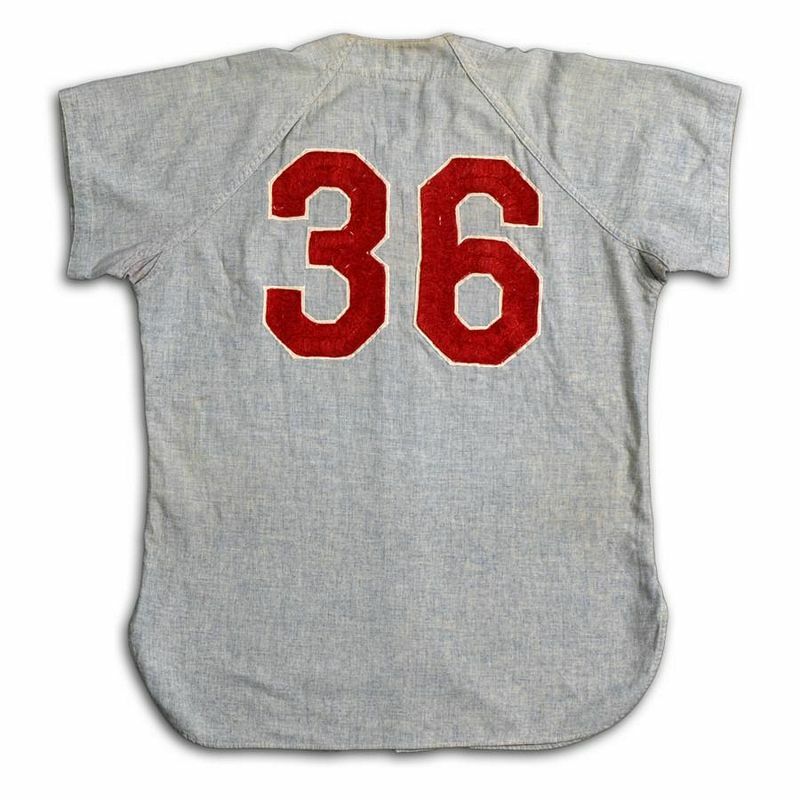 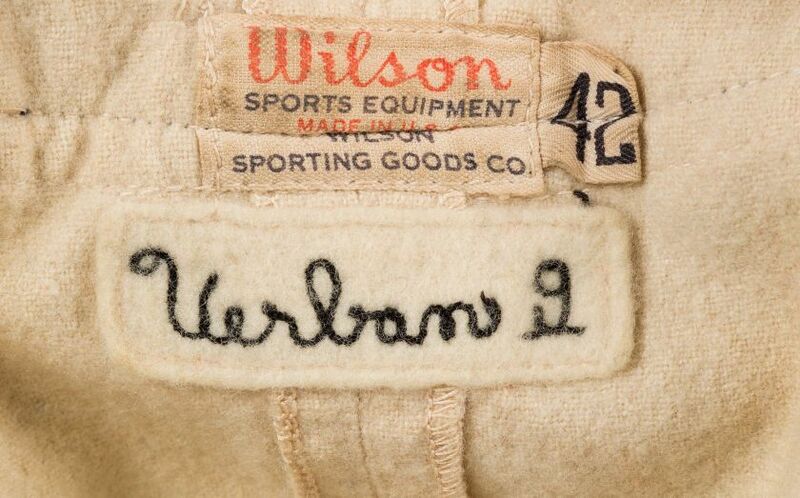 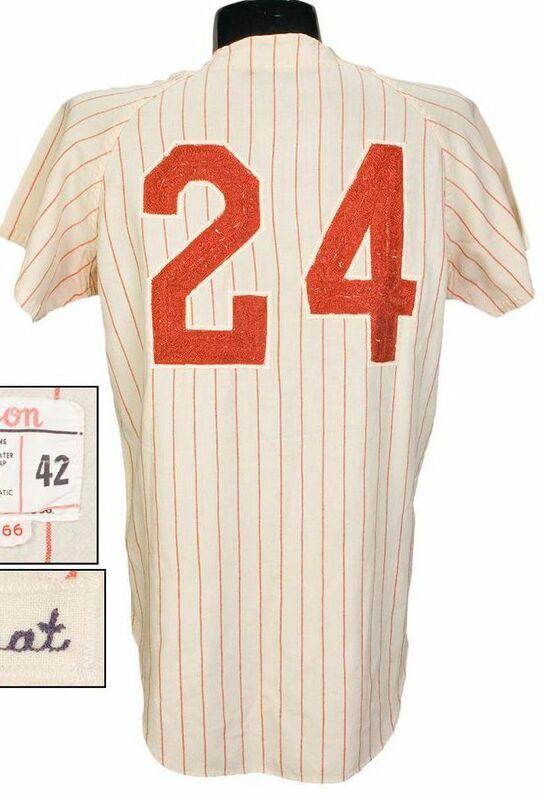 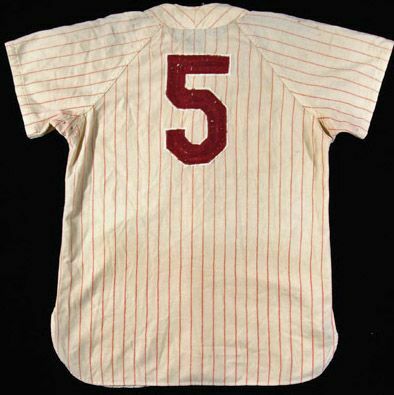 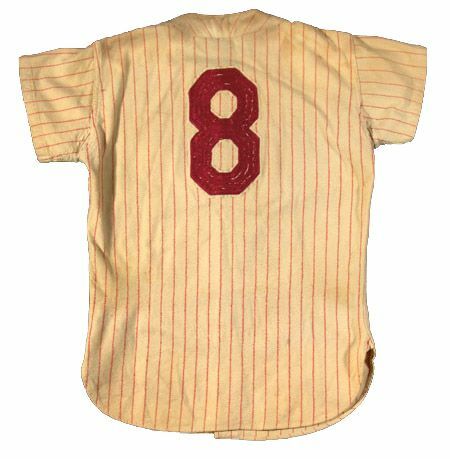 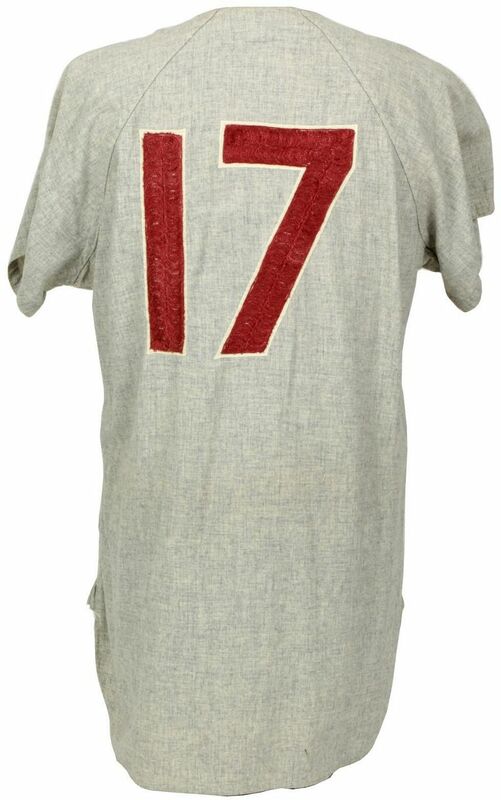 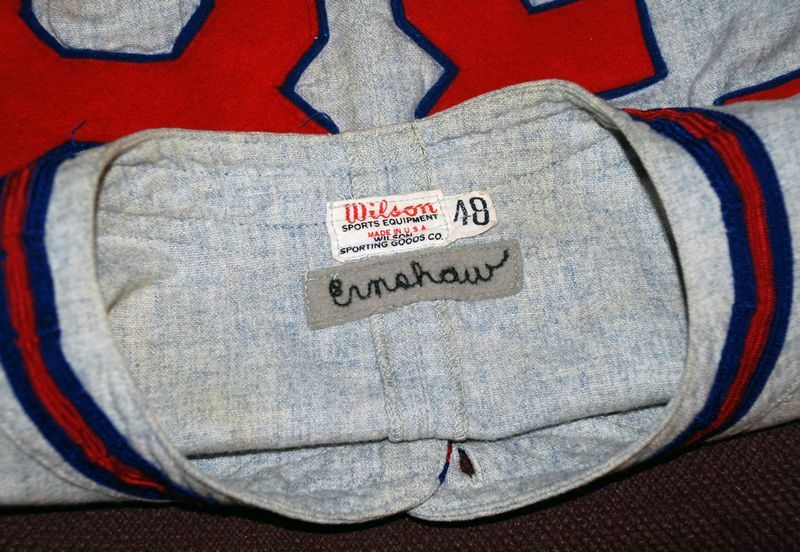 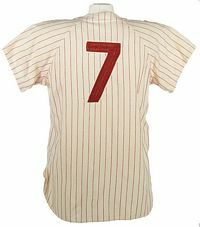 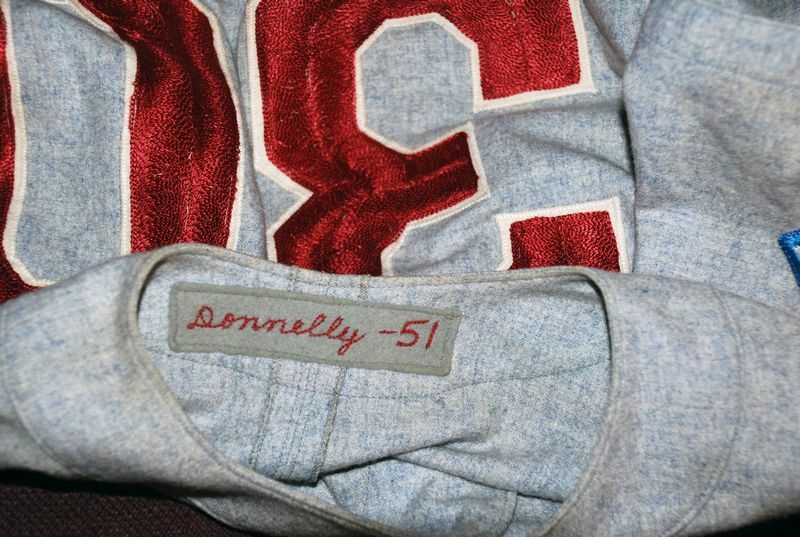 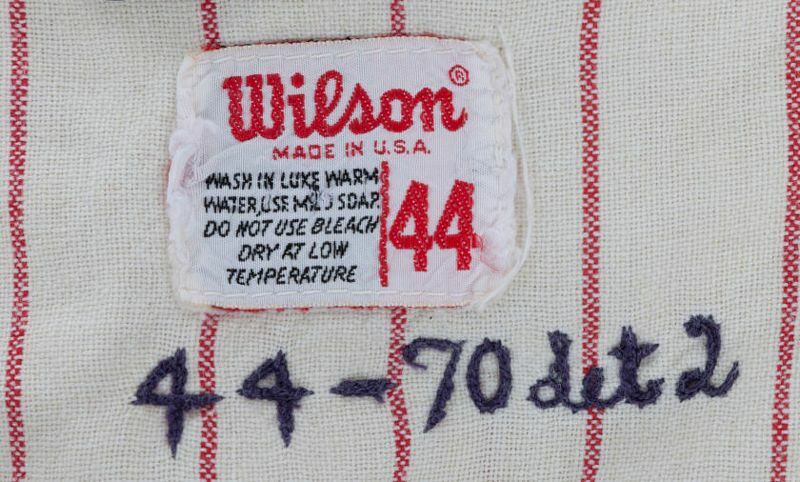 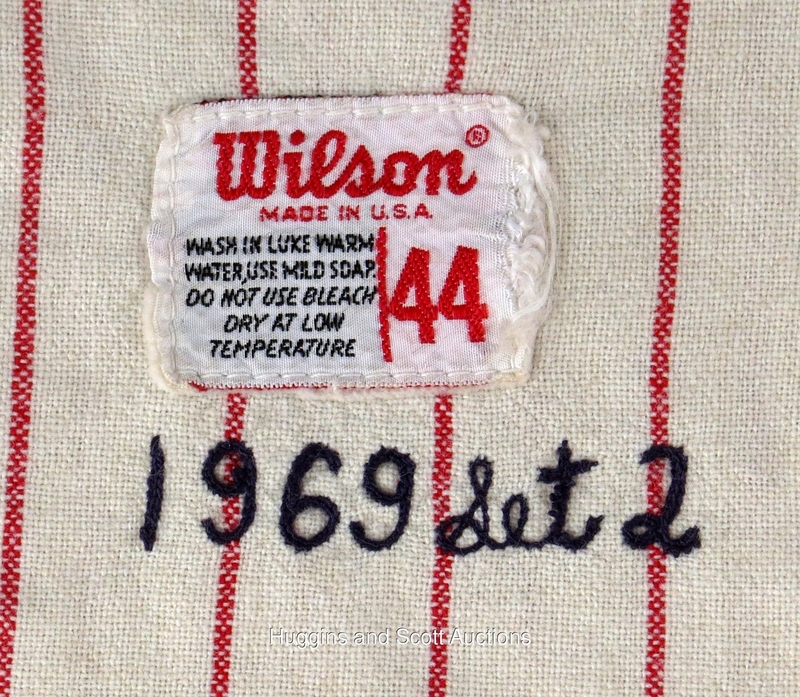 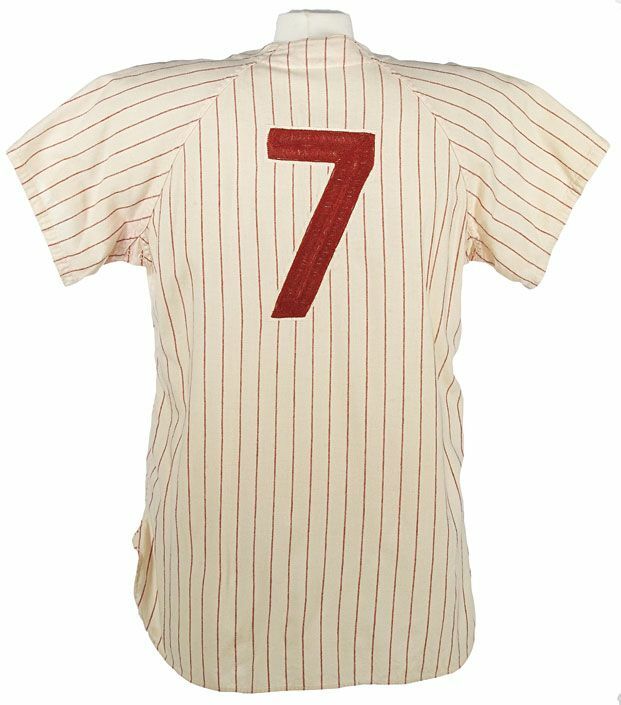 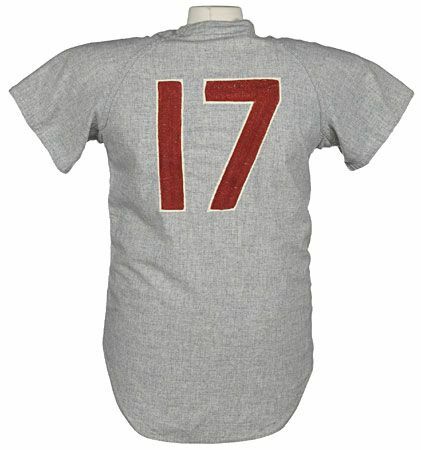 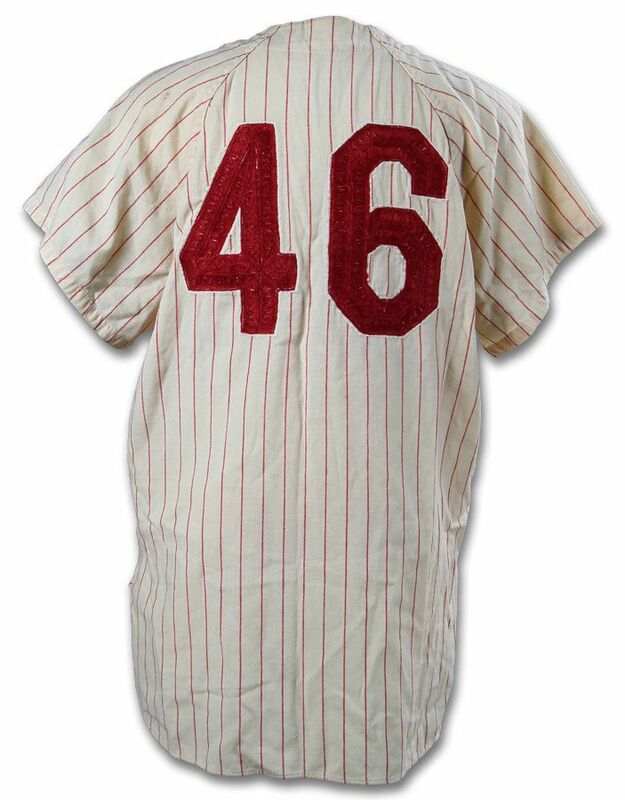 Chain-stitched lettering and numbers appear and the Phillies are the only MLB team to use it. 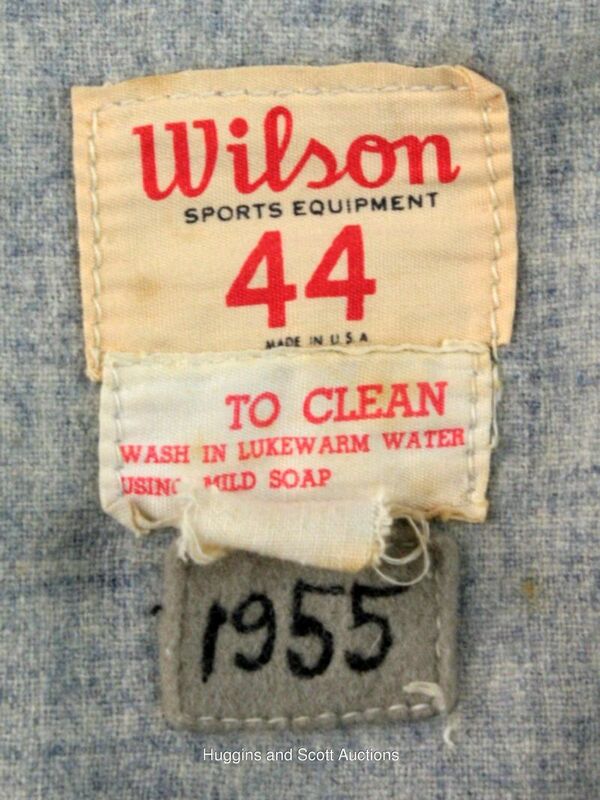 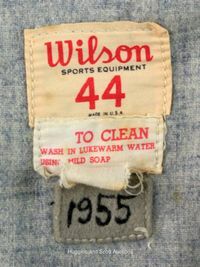 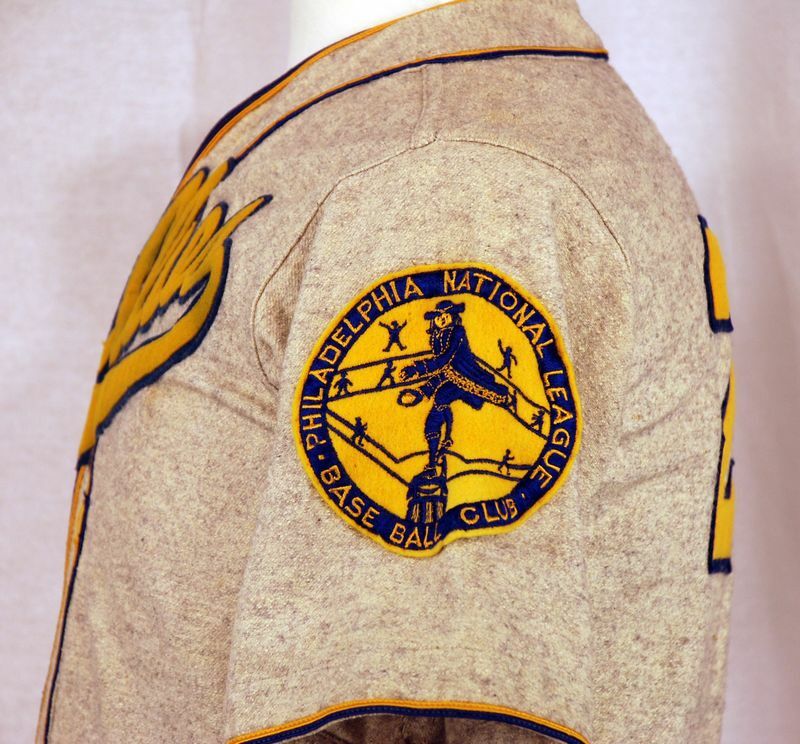 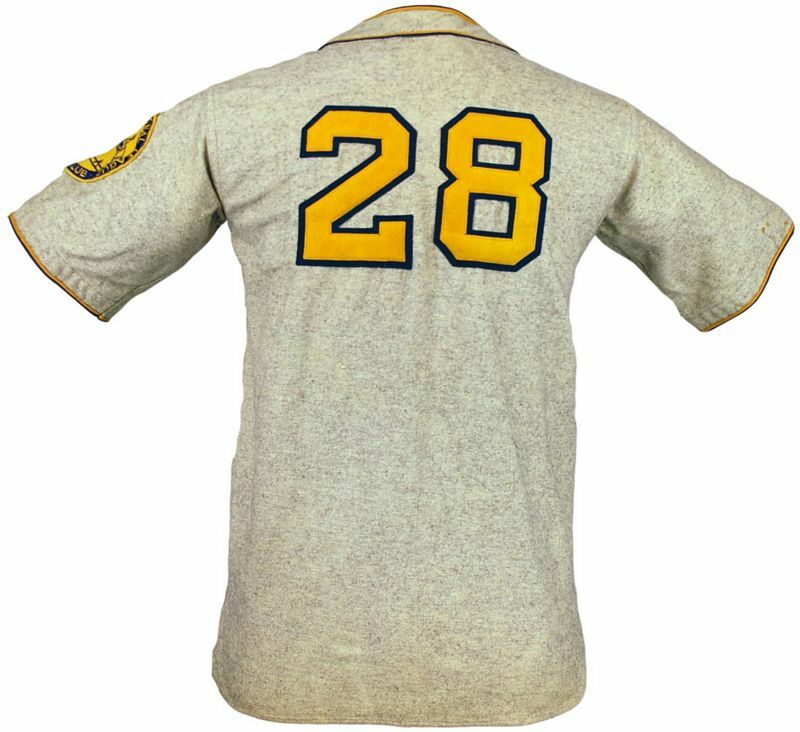 NL 75th anniversary patch worn in 1951. 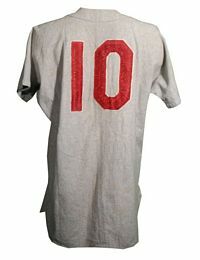 Patch is missing from this jersey. 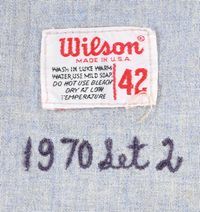 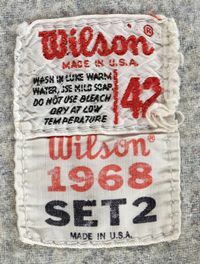 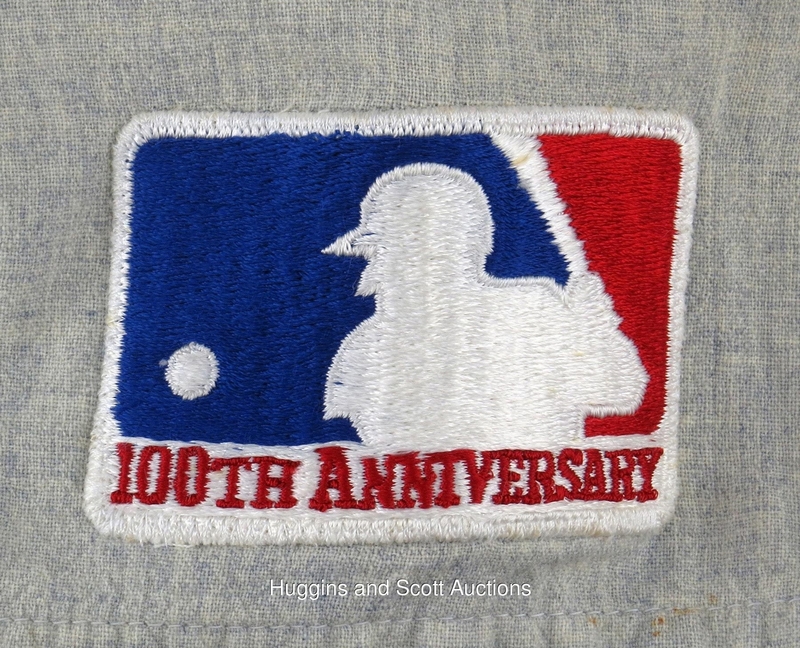 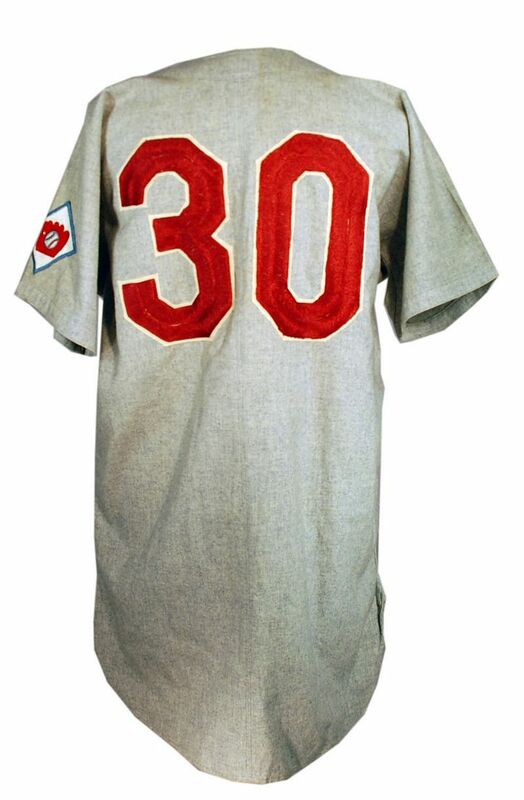 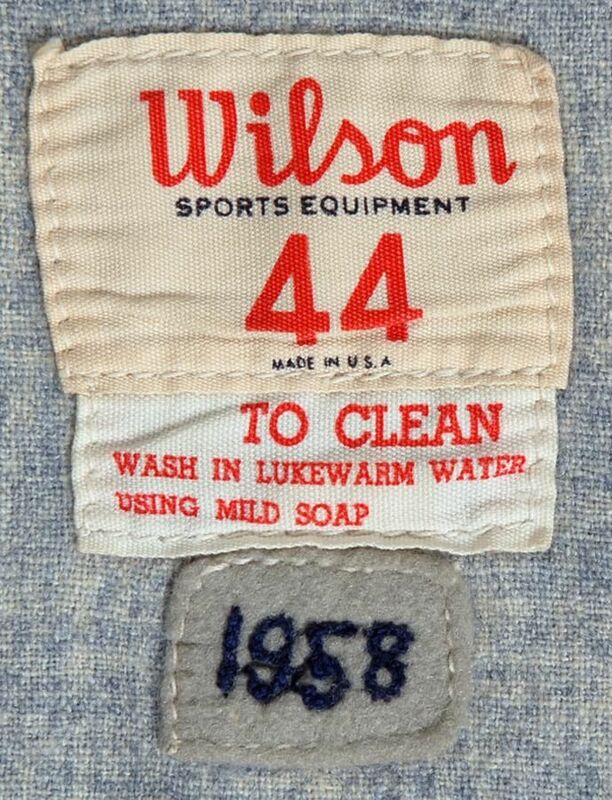 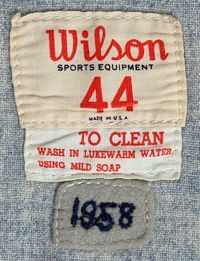 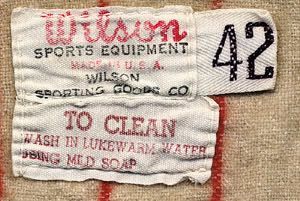 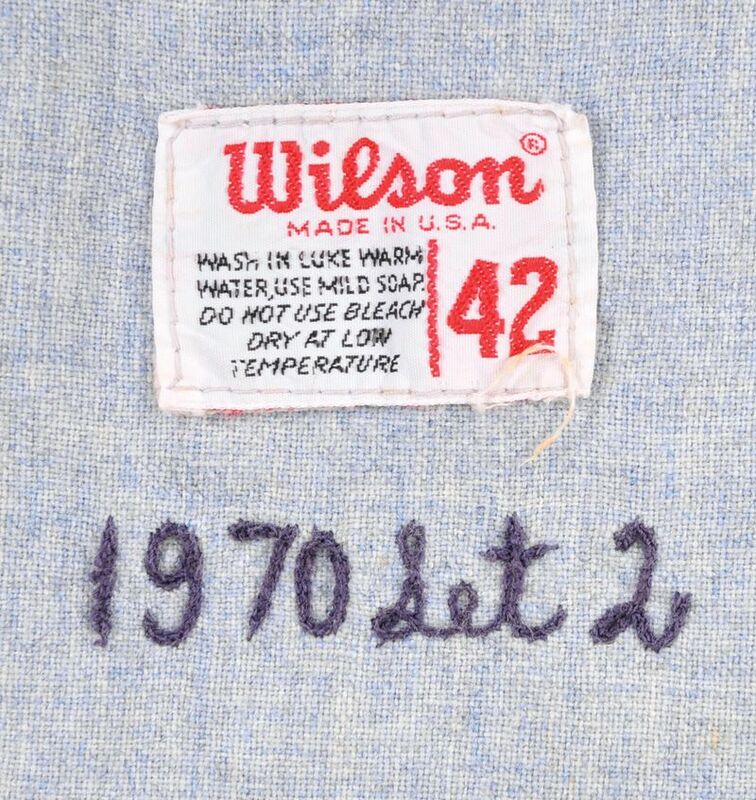 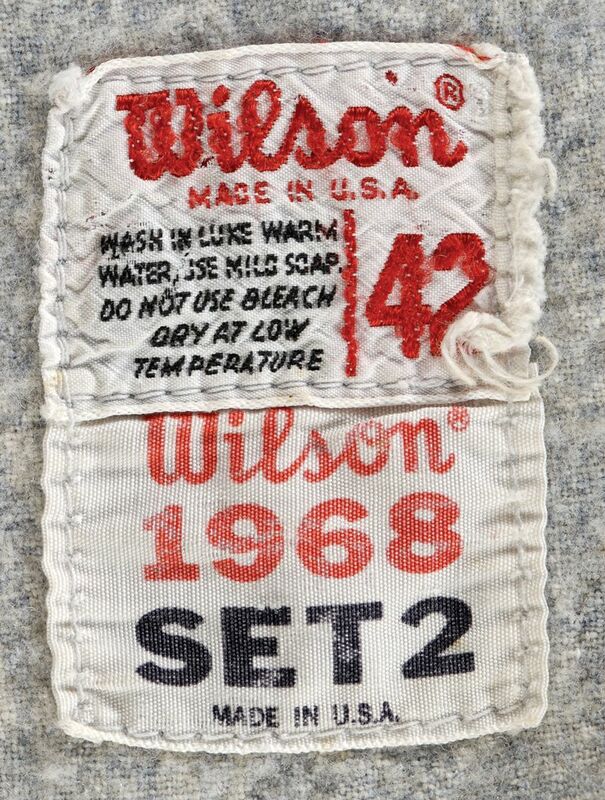 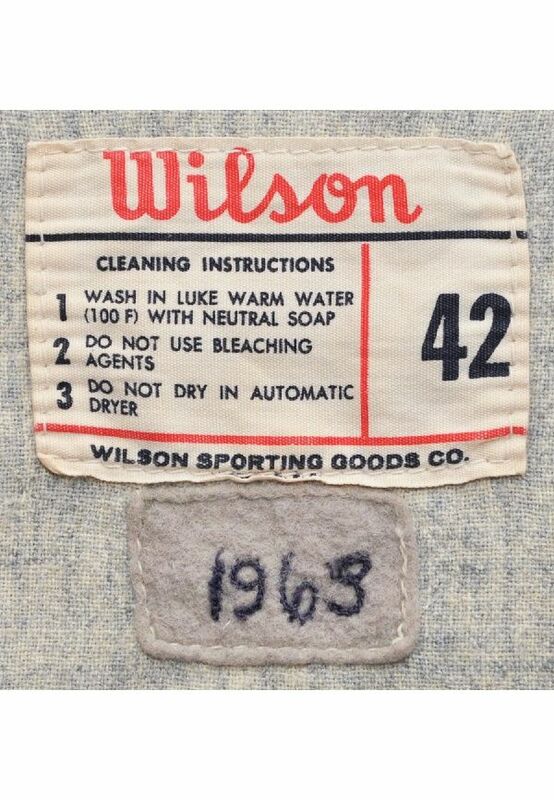 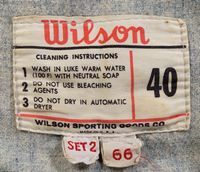 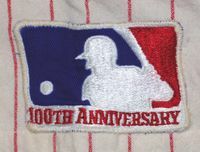 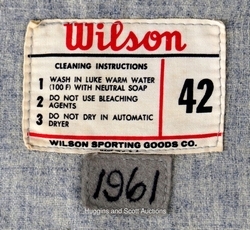 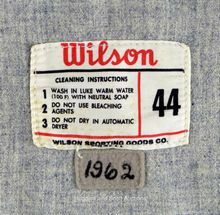 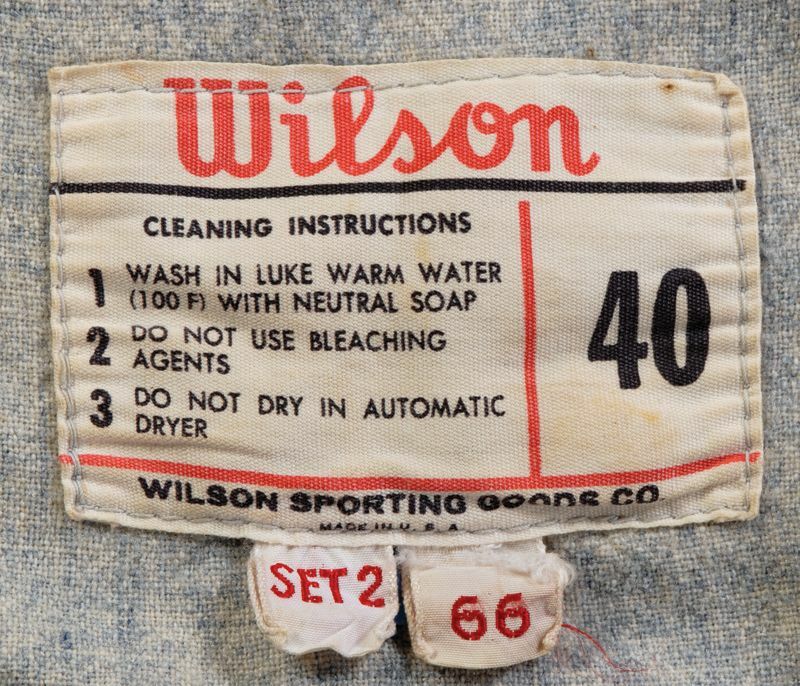 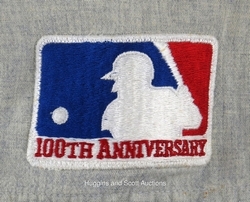 MLB 100th Anniversary patch worn in 1969. 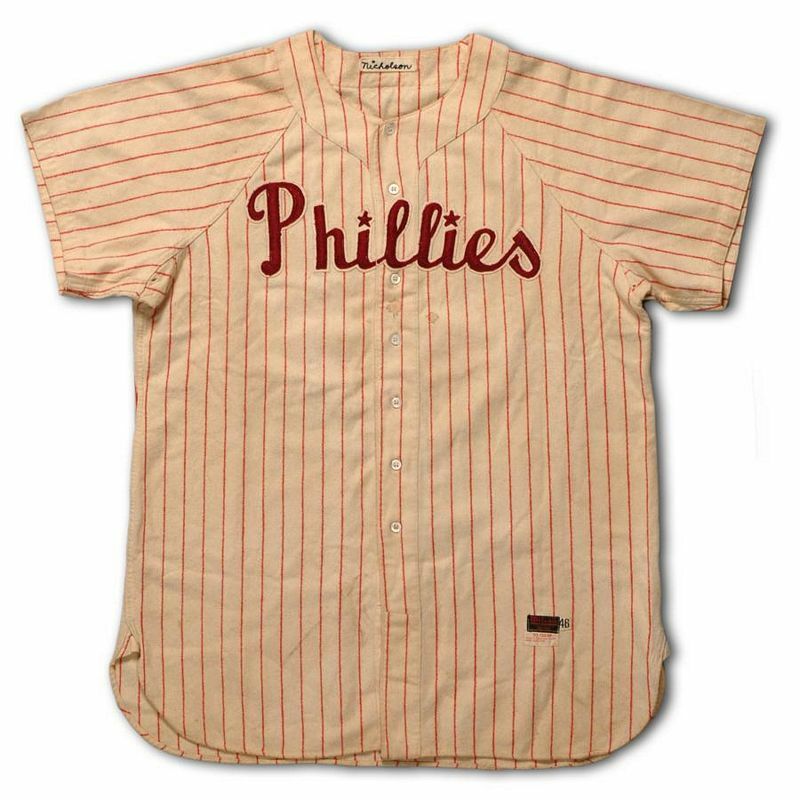 The Phillies had intended to introduce their new look and move into their new stadium in 1970. 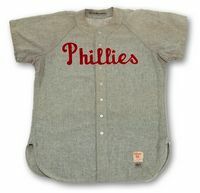 However the stadium was not ready, so the team wore both the 1969 style and the new style during 1970. A stylized "P" becomes the new logo. 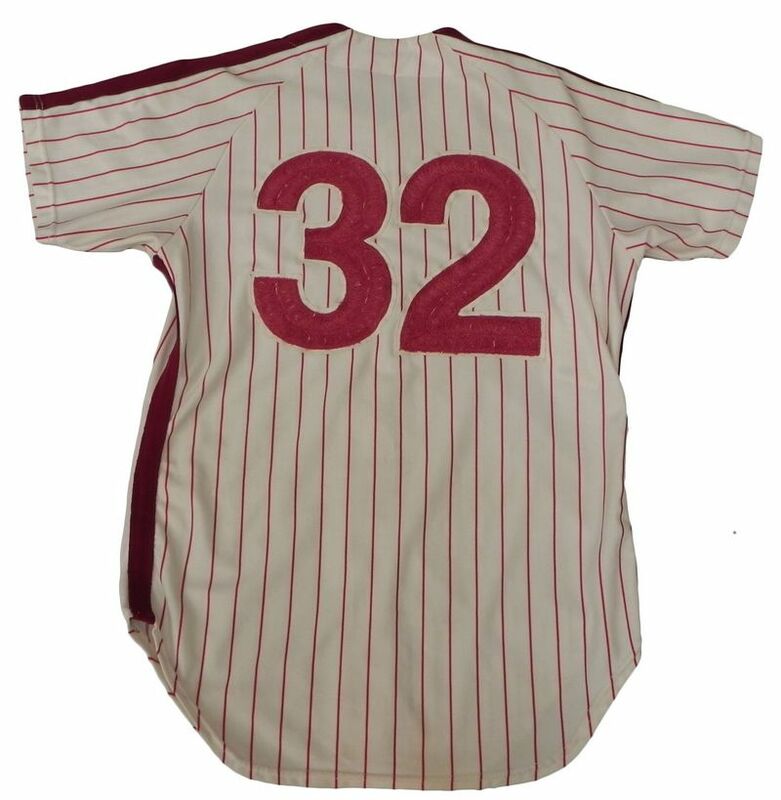 Front numbers appear and shoulder racing stripes are added. 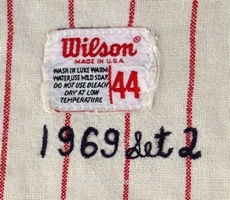 Double knit polyester debuts. 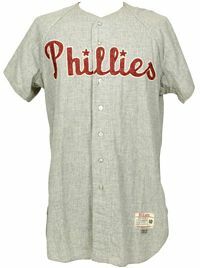 Solid grey road jerseys exist - two sets of them - but there's a debate if those grey jerseys were ever used in a game by the Phillies. 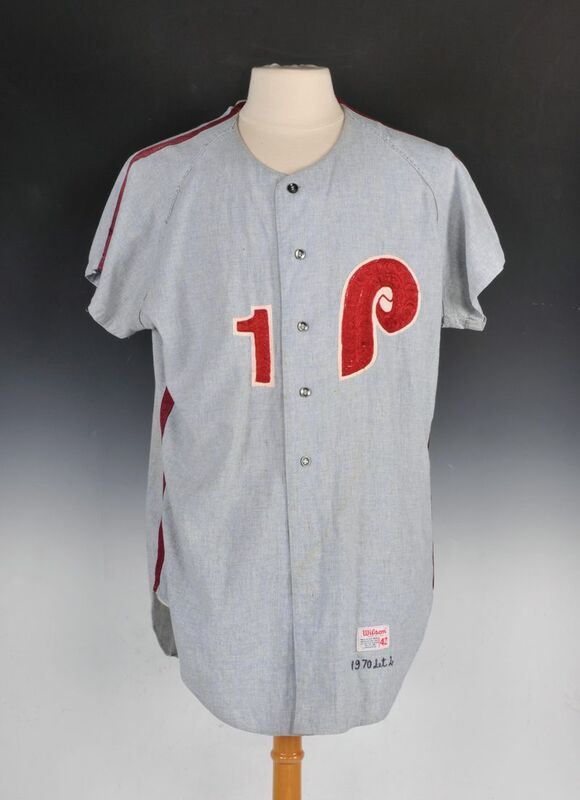 Like many teams did around this time with the advent of color television, the Phillies changed to the blue-grey shown here either for the start of, or very early in, the 1972 season. 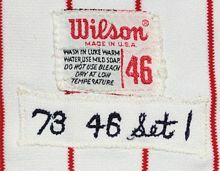 Used or not? We're not sure. My guess - and I remember 1972 quite well - probably not. 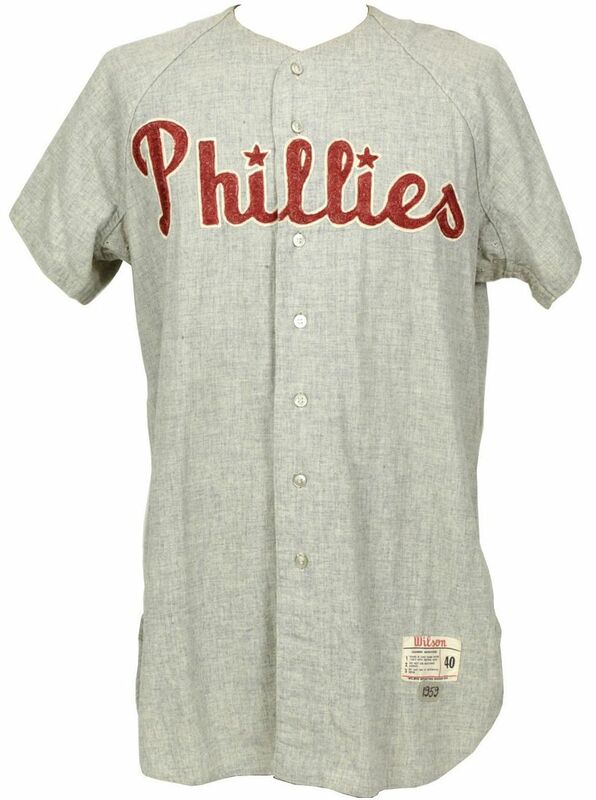 The road jersey gets a makeover. 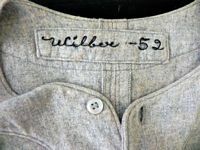 It becomes a deeper blue, NOB are added, numbers become tackle twill, the little "baseball stitch" line in the middle of the "P" logo is gone, zippers replace buttons.